Η Jeep έδωσε λεπτομέρειες της ευρωπαϊκής έκδοσης του Renegade το οποίο αναμένεται να λανσαριστεί στην ελληνική αγορά τον Νοέμβριο με την αρχική του τιμή να κυμαίνεται μεταξύ €22.000 – €23.000. Το μικρό SUV έκανε παγκόσμια πρεμιέρα τον περασμένο Μάρτιο στη Γενεύη. Βασίζεται στην πλατφόρμα του Fiat 500L με μία δομή ατσάλινου monocoque και εντελώς νέα ανεξάρτητη ανάρτηση που αποτελείται από τα παραδοσιακά γόνατα McPherson στον εμπρός άξονα και γόνατα Chapman στον πίσω. Το σύστημα πέδησης στο μικρό Jeep αποτελείται από δισκόφρενα και στους τέσσερις τροχούς. 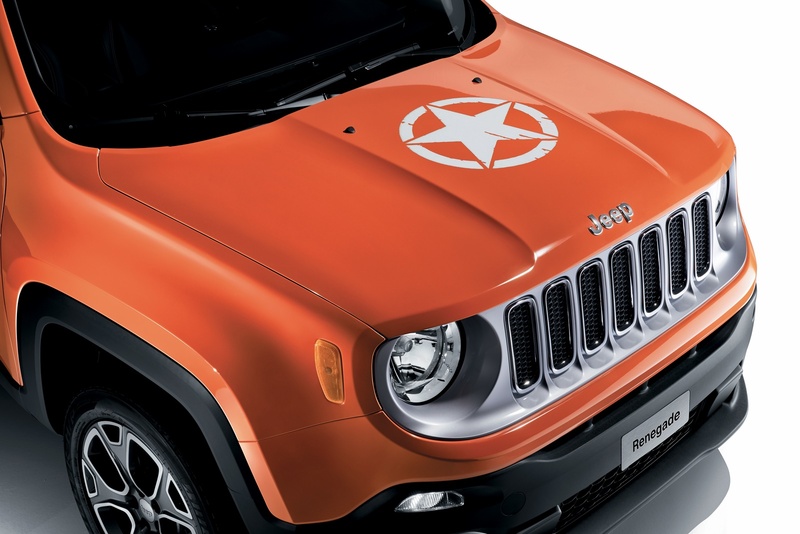 Ενδιαφέρον έχει το γεγονός ότι το Jeep Renegade είναι εφοδιασμένο με σύστημα τετρακίνησης ως standard σε όλες τις εκδόσεις. Ωστόσο, για να μην επιβαρύνεται χωρίς λόγο η οικονομία καυσίμου, διαθέτει σύστημα με το οποίο απεμπλέκει τον πίσω άξονα από το drivetrain όταν η τετρακίνηση δεν είναι απαραίτητη. Σχεδιαστικά διατηρεί τη χαρακτηριστική μάσκα με τα 7 ανοίγματα και τη μεγάλη απόσταση από το έδαφος που μεταξύ άλλων λεπτομερειών, του δίνουν ταυτότητα. Ακόμα και χωρίς κανένα απολύτως σήμα, δεν γίνεται να μην καταλάβεις πως πρόκειται για Jeep. Ωστόσο μοιάζει περισσότερο με το “παλιό”, κλασικό Wrangler παρά με το νέο Cherokee. Η Jeep επίσης, δεν ποντάρει στην εμφάνιση για να πουλήσει το Renegade. Ποντάρει στις εκτός δρόμου ικανότητες του ιδίως στην Trailhawk έκδοση που εξοπλίζεται με το Jeep Active Drive Low με 20:1 crawl ratio και Selec-Terrain σύστημα. Θα είναι διαθέσιμο με τέσσερα επίπεδα εξοπλισμού Sport, Longitude, Limited και Trailhawk καθώς και στην Opening Edition. Μηχανικά θα φορά δύο MultiAir2 βενζινοκινητήρες απόδοσης 140 και 170 άλογα και τον flex-fuel E.torQ απόδοσης 120 ίππων. Από πλευράς πετρελαιοκινητήρων υπάρχουν δύο MultiJet II απόδοσης 120 και 170 ίππων, με τον 2,4-λίτρων Tigershark MultiAir να είναι διαθέσιμος μόνο στη Ρωσική αγορά. Σε ότι αφορά τα κιβώτια, θα προσφέρεται με δύο μηχανικά κιβώτια, έναν DDCT και ένα νέο 9-τάχυτο αυτόματο, τα οποία θα στέλνουν τη κίνηση στους μπροστά (4×2) αλλά και στους τέσσερις τροχούς (4×4). 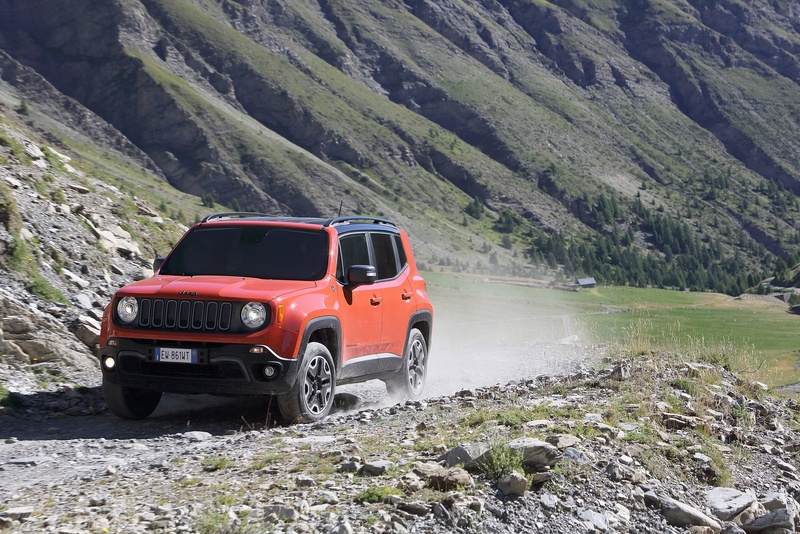 After the world reveal at the Geneva Motor Show in March and the US première at the New York International Auto Show in April, the new Jeep Renegade, the Small SUV now make its debut to the international press before its market launch across the EMEA region starting end of September. 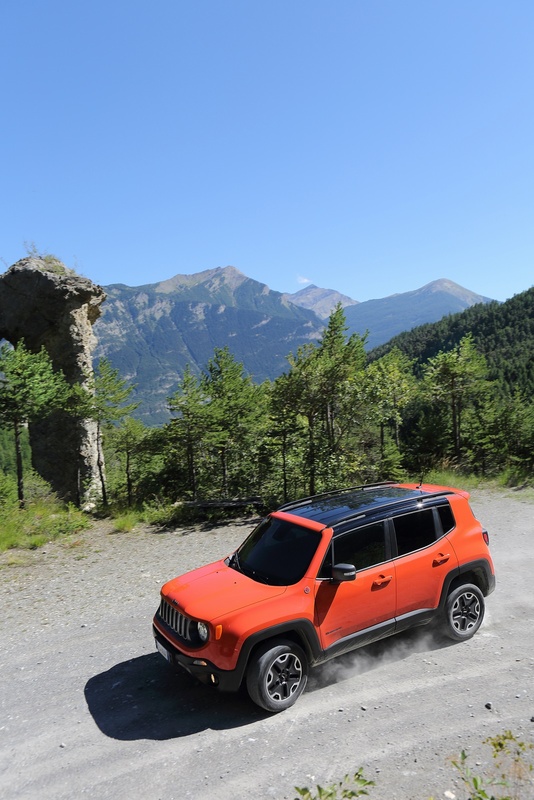 The all-new Jeep® Renegade expands the brand’s vehicle lineup, entering the growing Small sport-utility vehicle (SUV) segment, while staying true to the adventurous lifestyle and 4×4 capability Jeep is known for. 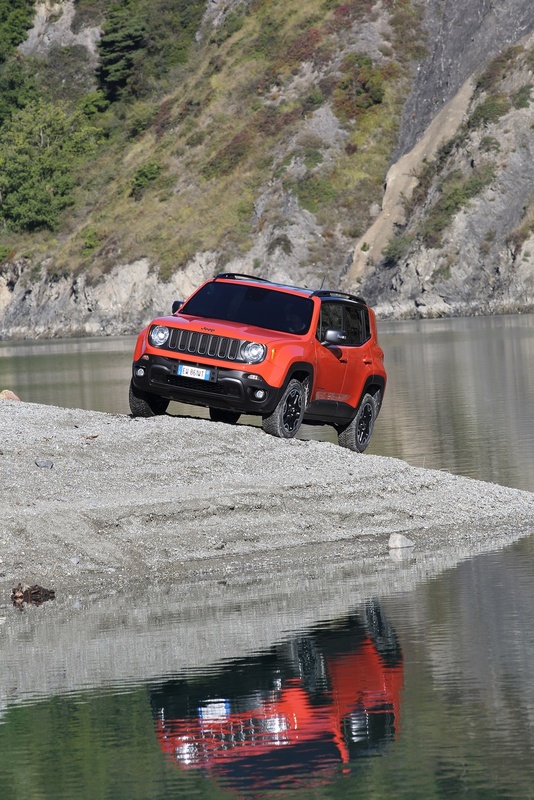 Determination, skill and desire to be part of one, solid team: these are the most important ingredients in the making of the new Jeep Renegade, the first vehicle of Fiat Chrysler Automobiles to be jointly developed by Italian and American designers and engineers and the first model in the brand’s history to be built in Italy, at the renewed SATA plant in Melfi (Basilicata). 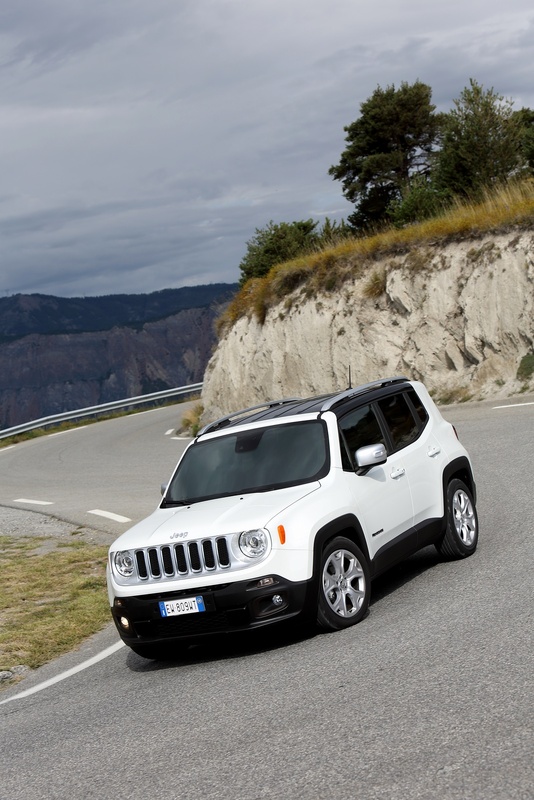 An all-new Jeep, resulting from the combination between the design, functionality and off-road expertise belonging to the U.S. brand – that since 73 years is synonymous with freedom and 4×4 driving – and the style and the dynamic features that are signature cues of the Italian cars all over the world. 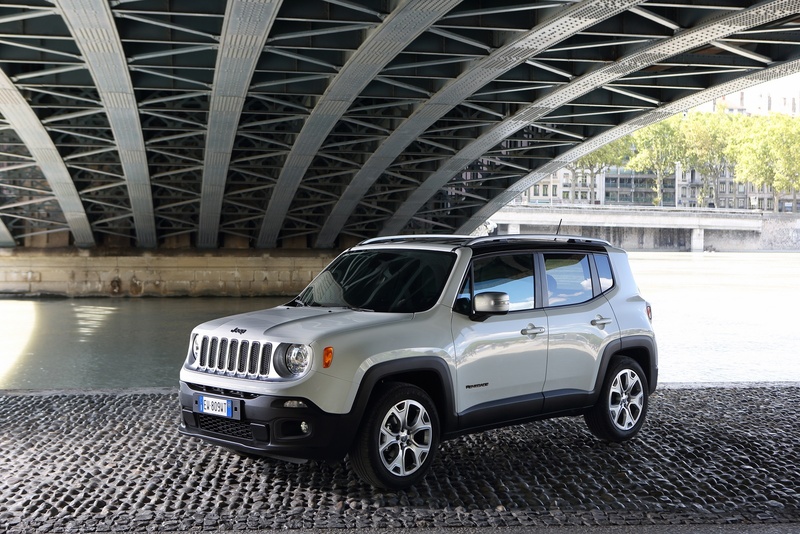 Jeep Renegade is a model packed with a strong stylistic personality . Agile and spacious, it is perfect for errands across town and with its off-road capabilities it is ready to explore new off-road trails. 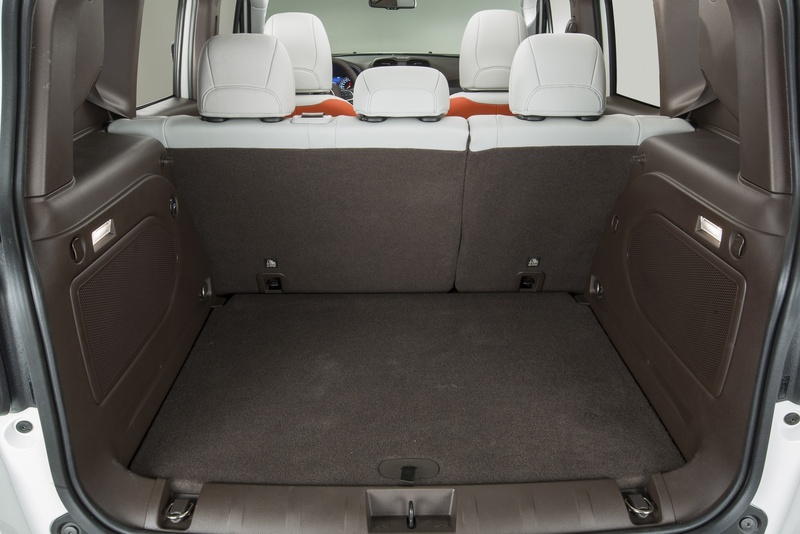 It boasts best-in-class interior roominess, excellent on-road driving dynamics and unsurpassed off-road capabilities. Two new, advanced 4×4 systems – Jeep Active Drive and Jeep Active Drive Low – incorporate a category-exclusive rear axle disconnect system that seamlessly switches between two- and four-wheel-drive for reduced energy loss when 4×4 capability isn’t needed and improving fuel efficiency in the process. The first in the segment nine-speed automatic transmission ensures benchmark performance both on-road and off-road. A range of fuel-efficient engines available in twelve powertrain combinations make sure the new Renegadecansatisfy every customer’s needs. 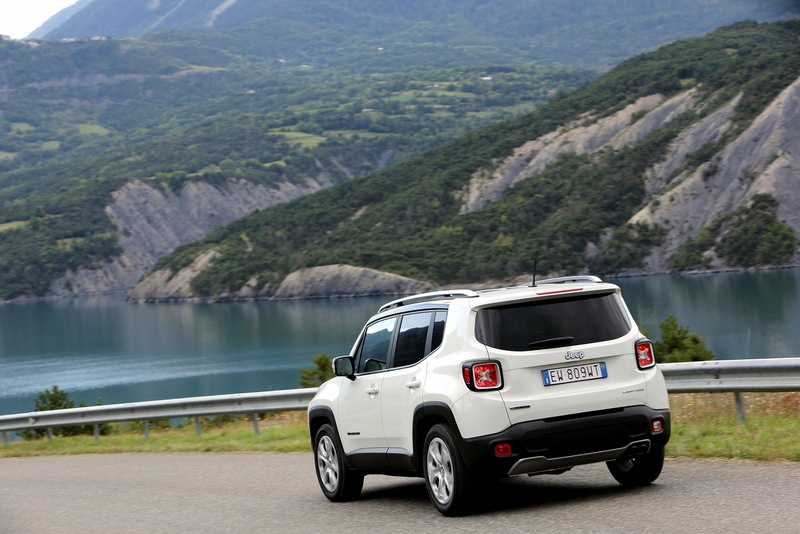 In EMEA (Europe, Middle East and Africa), the new Jeep Renegade will be available with a full-range comprising four different trim levels – Sport, Longitude, Limited and Trailhawk – a total of 12 fuel-efficient powertrain combinations and a choice of turbo diesel and petrol engines that will be available in four-wheel drive or front wheel- drive configurations. Sales of the new model will start on the main European markets in the first quarter of 2014. The engine range offering in the EMEA region comprises two MultiAir2 and one E.torQ petrol engines and two MultiJet II diesel engines . The gearbox offer includes a choice of two manual, one dual-dry clutch transmission (DDCT) and the first in the segment 9-speed automatic gearbox. 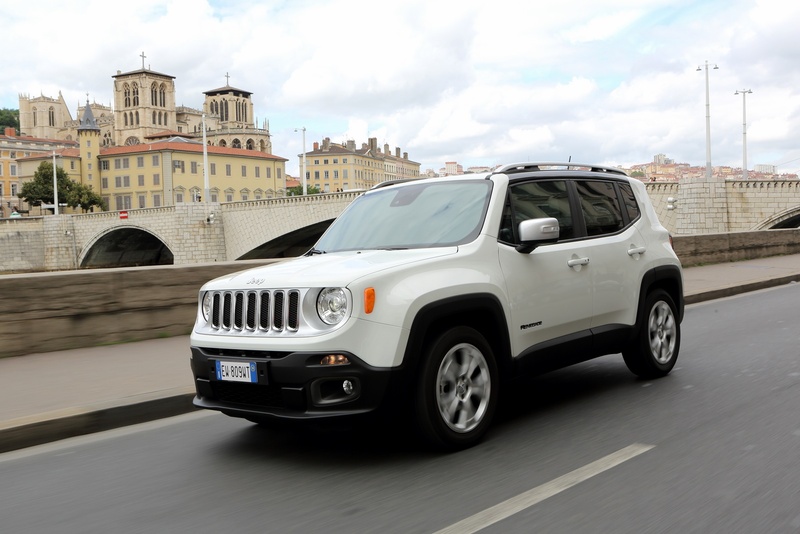 With the new Renegade, Jeep will be entering one of the automotive industry’s fastest growing vehicle categories – the Small SUV market. The result is a vehicle that builds on the Jeep Wrangler’s powerful stance, and features a fresh, all-new exterior styling that will certainly appeal to youthful and adventurous customers who recognize themselves in the well-known Jeep design inspired by the values of freedom and adventure. The vehicle’s exterior has a purposeful look with rugged body forms and aggressive wheel-to-body proportion. From any angles it reveals the distinctive design cues of the brand’s stylistic heritage, such as round headlamps, signature seven-slot grille and trapezoidal wheel arches. Two open-air roof systems will also be available to provide customers with open-air freedom: a large dual pane electric sliding glass roof and the unique to segment ‘My Sky’. 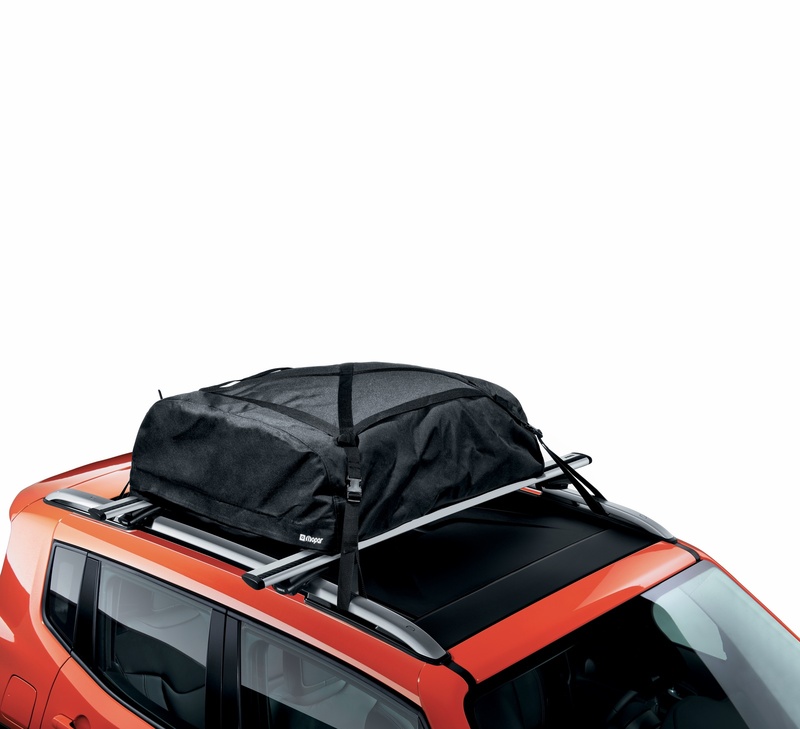 With its two lightweight panels that can be easily and conveniently removed and stowed in the boot, ‘My Sky’ introduces segment-exclusive panoramic open air experience. 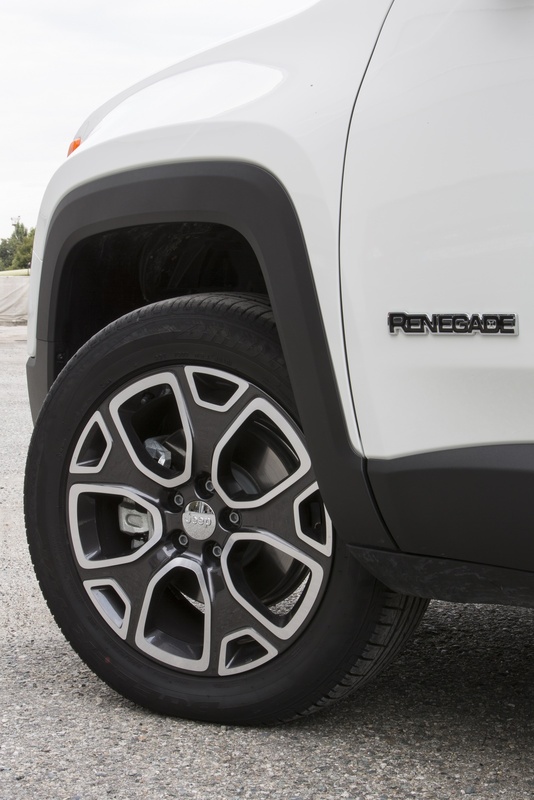 A total of seven wheel designs are available on the new Jeep Renegade. All are five-lug designs with specific finishes ranging from 16″ to 18″. 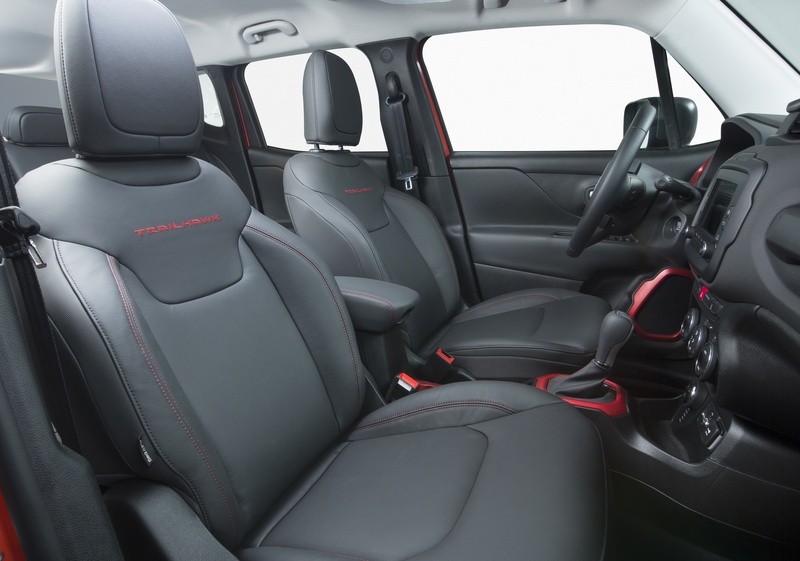 The interior features a modern, refined look, in line with the brand’s DNA. The cabin is characterized by maximum attention to detail, innovative color combinations, high-quality materials, advanced technological contents and clever and functional storage areas. 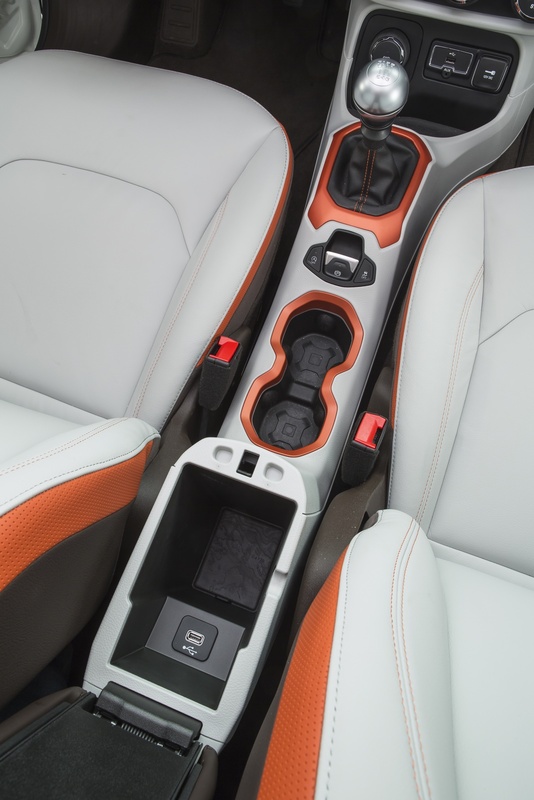 The interior boasts a distinctive, fresh form language, which Jeep designers have titled “Tek-Tonic.” This new design theme is defined by the intersections of soft and tactile forms with rugged and functional details. Major surfaces, such as the sculpted soft-touch instrument panel, are intersected with bold functional elements like the passenger grab handle – indispensable for off-road adventures and borrowed from its big brother, the legendary Jeep Wrangler. 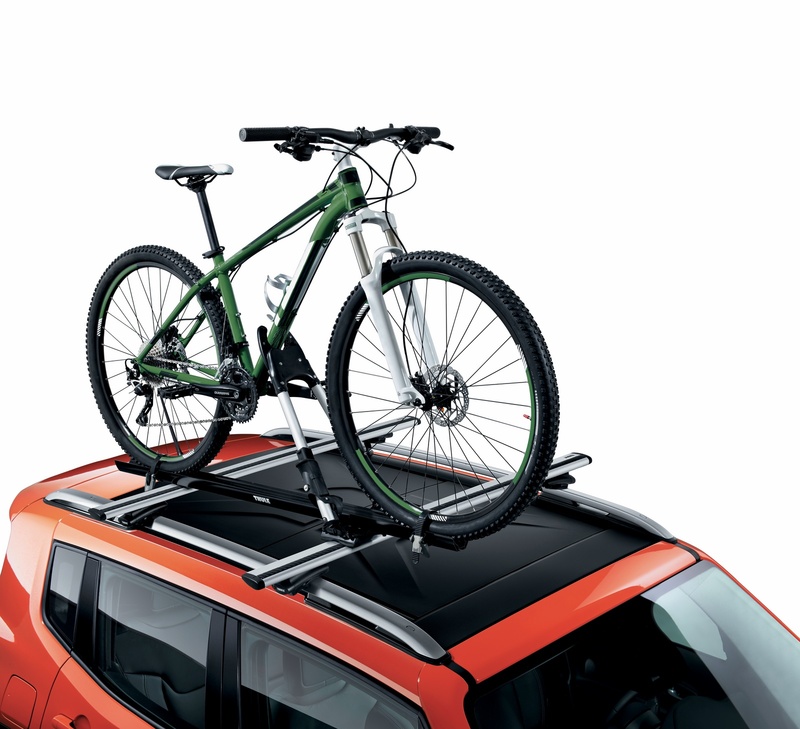 Unique “protective clamp fasteners,” anodized design accents and inspired colors are derived from extreme sports equipment. 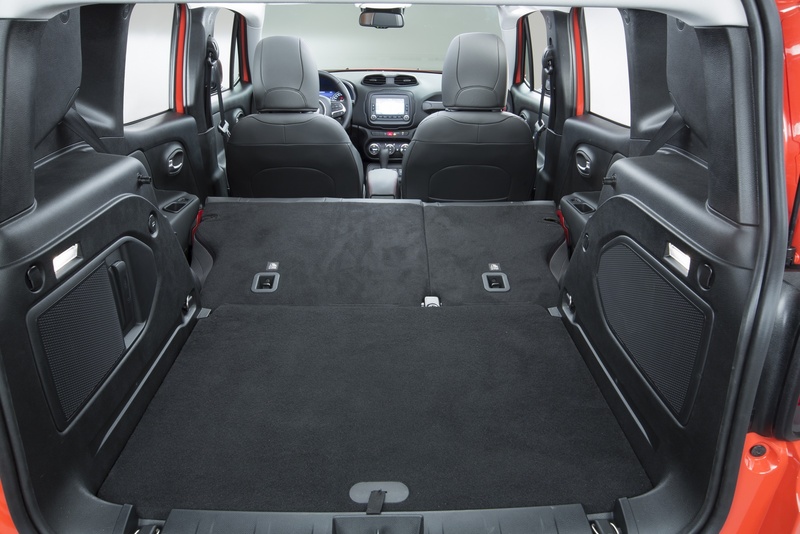 , And to make sure all of the needed passenger gear fits, the Renegade is designed with an efficient and flexible interior package that includes a fold-forward front-passenger seat and class-exclusive removable, reversible and height-adjustableCargo load floor . 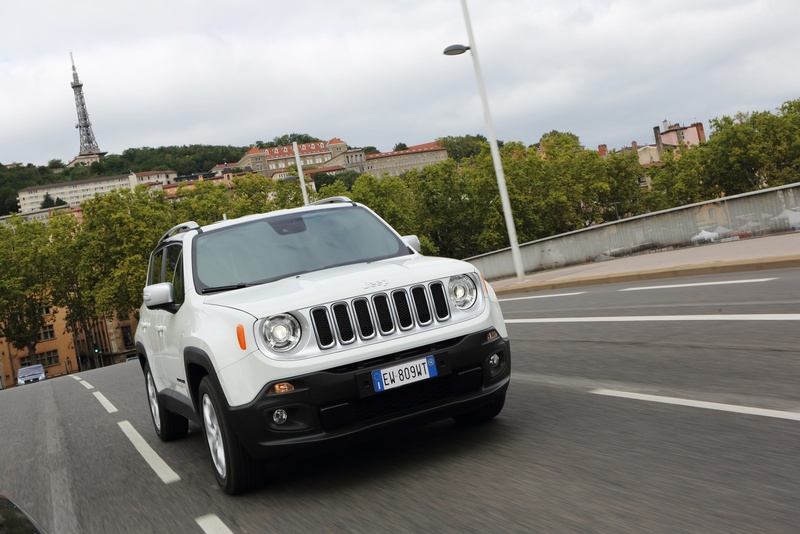 The new Renegade introduces the first nine-speed automatic transmission in its category. When paired with the 170 horsepower 1.4-liter MultiAir2 Turbo petrol engine, the 2.0-liter MultiJet II diesel or the 2.4-liter MultiAir2 Turbo petrol engine, the nine-speed automatic transmission delivers numerous benefits, including great pick-up, smooth power delivery at highway speeds and improved fuel efficiency. The all-new, fully electronic nine-speed automatic transmission features shift-on-the-fly map changing, with AutoStick manual shifting capability for improved fuel economy, performance and driving pleasure. 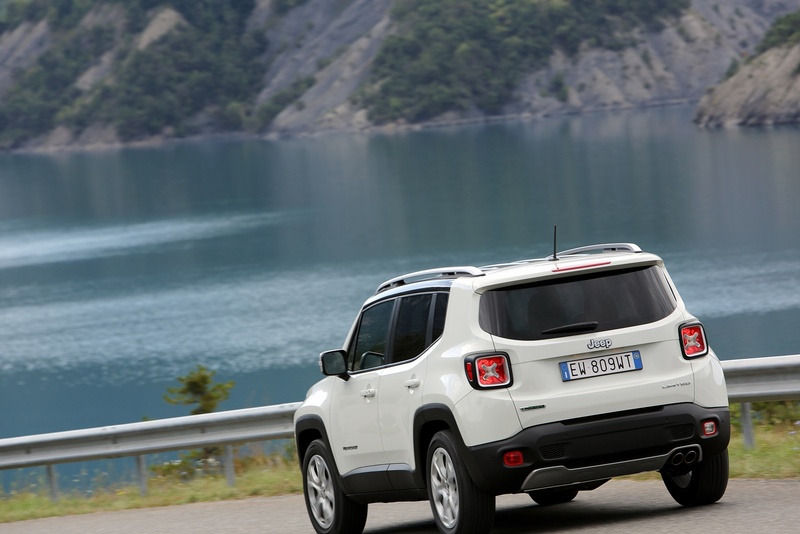 The all new Renegade features two all new four-wheel drive configurations. 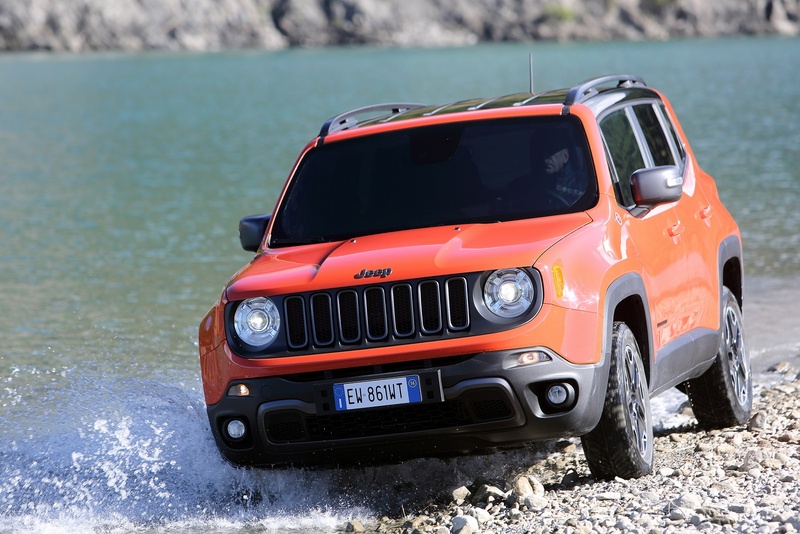 Best-in-class approach and departure angles and two 4×4 systems – ‘Jeep Active Drive’ and ‘Jeep Active Drive Low’ – the latter, thanks to a specific mapping of the gear ratios and the combination with Hill Descent Control function and “Low”, provides an off-road behavior that place the Renegade at the top of its category and offers the legendary off-road capability of the Jeep brand. Both systems supply the proper amount of torque for any driving situation providing enhanced safety in slippery conditions such as rain and snow, as well as optimal traction on aggressive starts.. 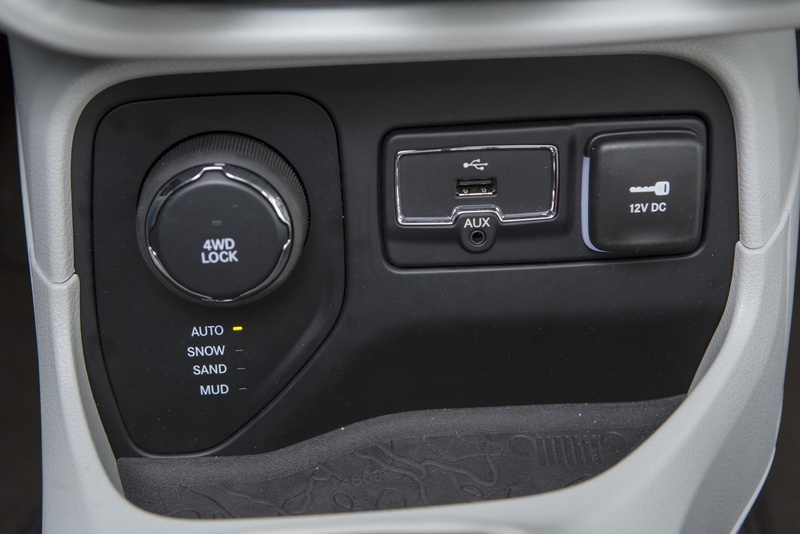 The Jeep Active Drive and Active Drive Low systems are combined with the Jeep Selec-Terrain traction control system with four settings (five for the Trailhawk model, which adds the Rock mode to Auto, Snow, Sand and Mud) that ensures the desired on- or off-road setting for optimum performance on any surface. With independent-wheel suspensions able to guarantee a maximum wheel articulation up to 205 mm and a ground clearance of up to 210 mm for the Trailhawk model, Jeep Renegade sets new standards in the Small SUV segment and offers best-in-class 4×4 capability. 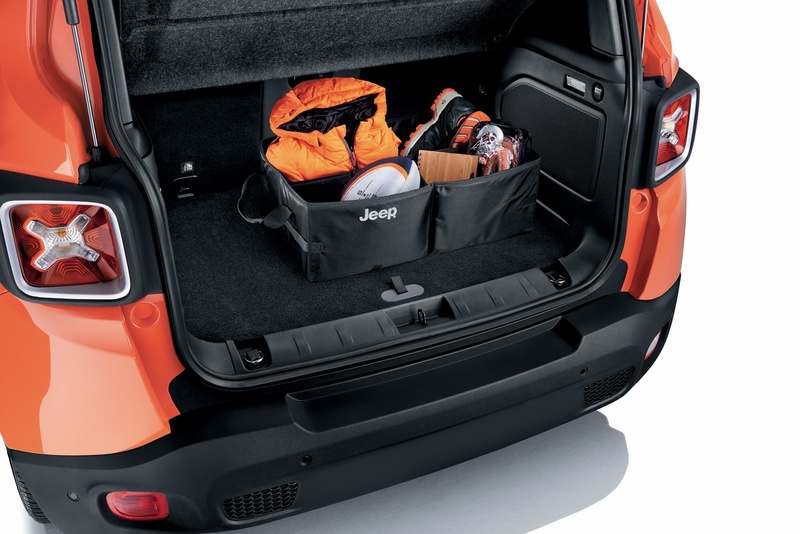 The new Jeep Renegade is also the first Small SUV to be equipped with rear axle disconnect. This system reduces energy loss when 4×4 capability is not needed and delivers 4×2 levels of fuel efficiency. The rear-axle disconnect seamlessly switches between two- and four-wheel drive for full-time torque management without requiring input from the driver. 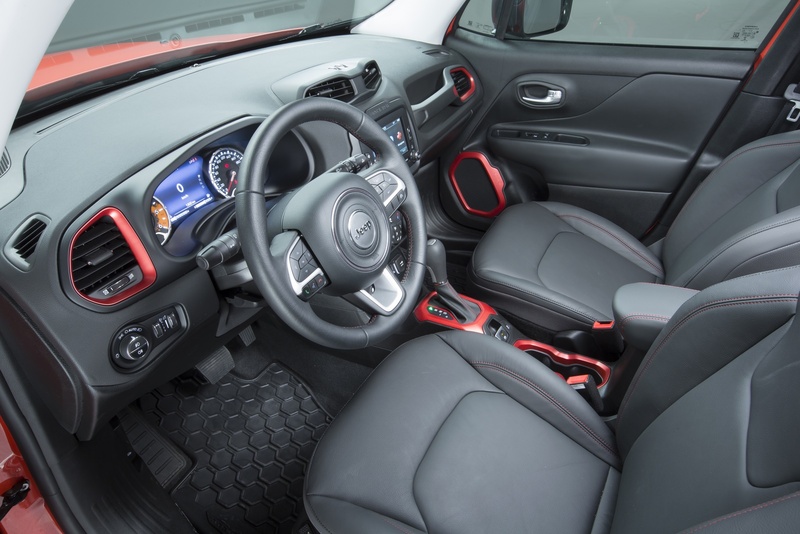 Jeep Renegade is beyond comparison in the segment also when it comes to its equipment providing onboard comfort and infotainment and it offers advanced technology features. 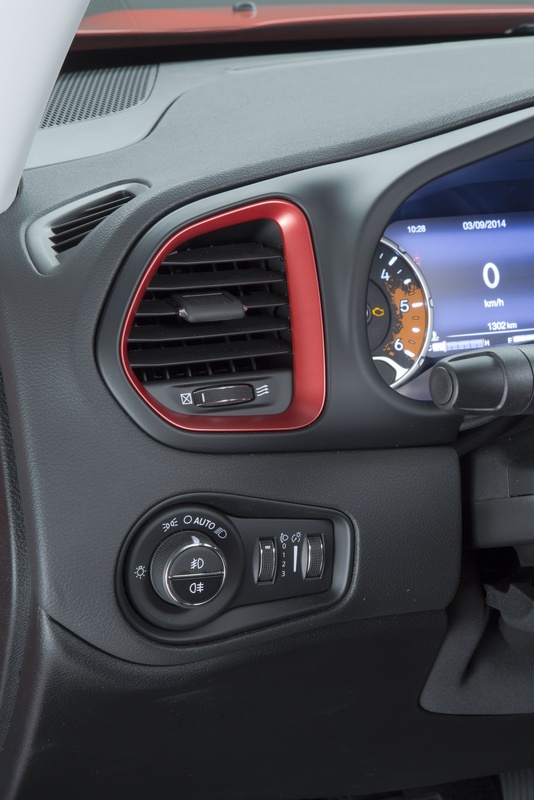 They include the UConnect system with 5 (a standard feature on all trim levels) or 6.5″ touchscreen with navigator, Bluetooth with hands free phone. 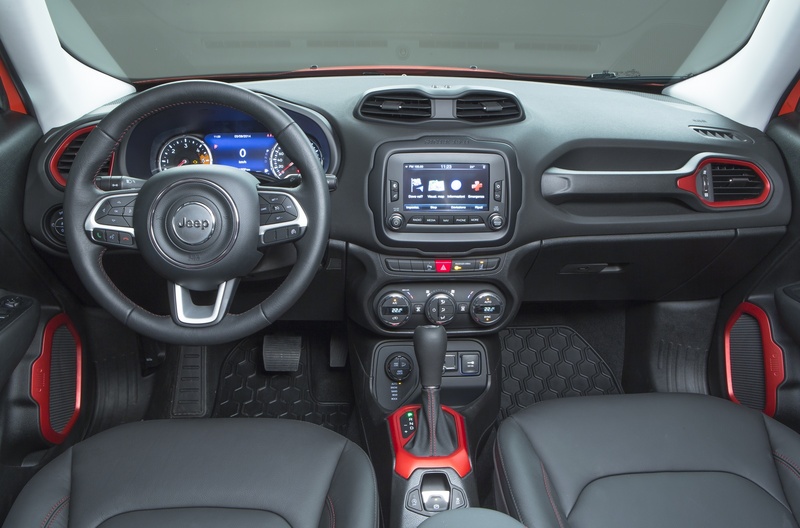 The Limited and Trailhawk versions of Jeep Renegade feature a 7″ colour instrument cluster multiview display, the largest in the segment. 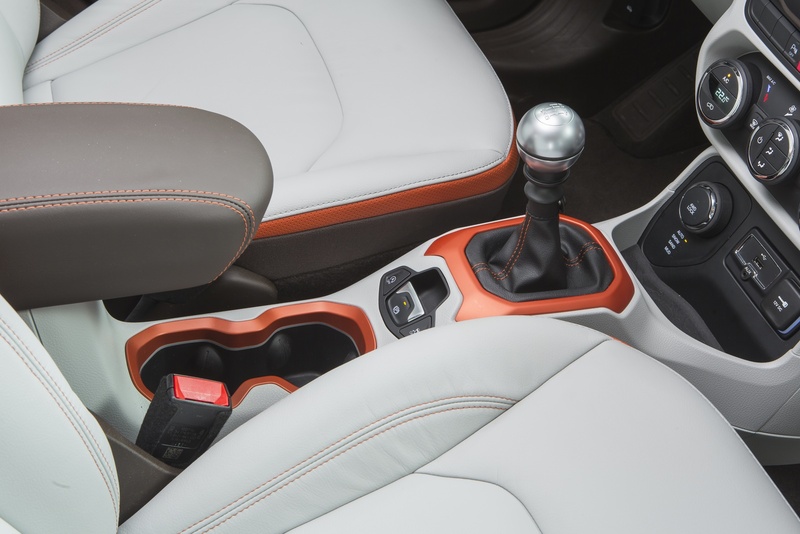 Safety and security were also at the forefront in the development of the all-new Jeep Renegade offering an array of advanced safety features, including 6 standard airbags, ESC with Electronic Rollover Mitigation (ERM), Parkview rear camera, Forward Collision Warning-Plus, LaneSense Departure Warning-Plus-and Adaptive Cruise Control. 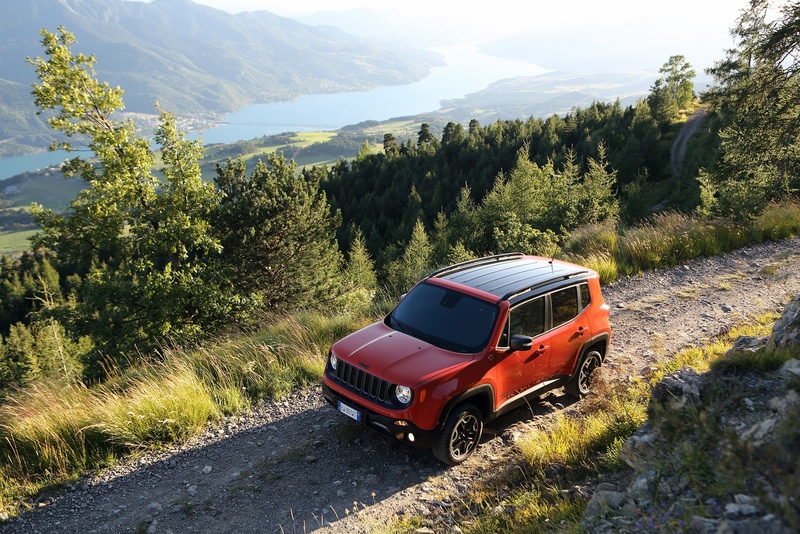 The new Jeep® Renegade offers the open-air freedom and iconic styling Jeep is known for in an all-new efficient, trail and urban-friendly size – designed to take the growing global Small SUV segment head-on with its boxy proportions and purposeful design elements. 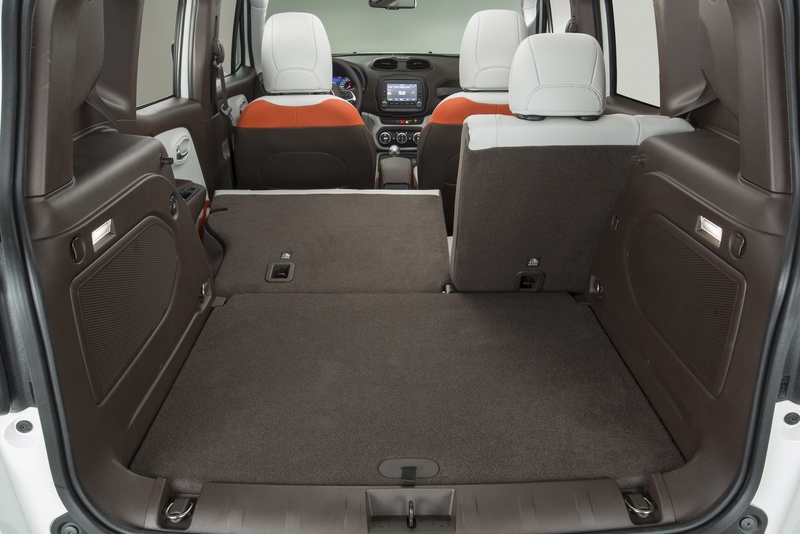 Inside, the Renegade features high-quality materials, useful features and thoughtful storage to maximize versatility and capability. 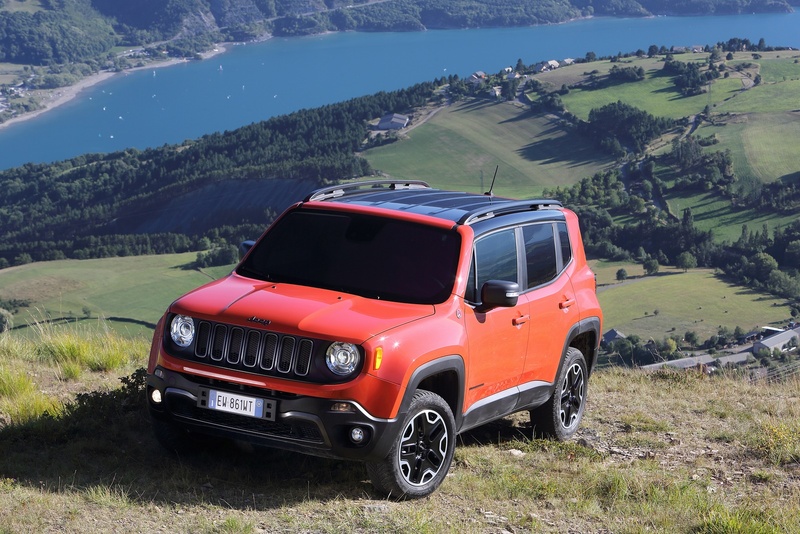 From the start, Jeep designers knew the Renegade would need to deliver best-in-class off-road capability with city-sized proportions that exuded the brand’s rugged, versatile and functional styling. Secondly, designers knew that this new Jeep would symbolize American design and ingenuity as it marks the brand’s first entry into the Small SUV segment in more than 100 markets around the globe. Last, this new Jeep vehicle must provide these youthful and adventurous customers with world-class levels of craftsmanship and efficiency and, more importantly, the open-air freedom of the legendary Jeep Wrangler. 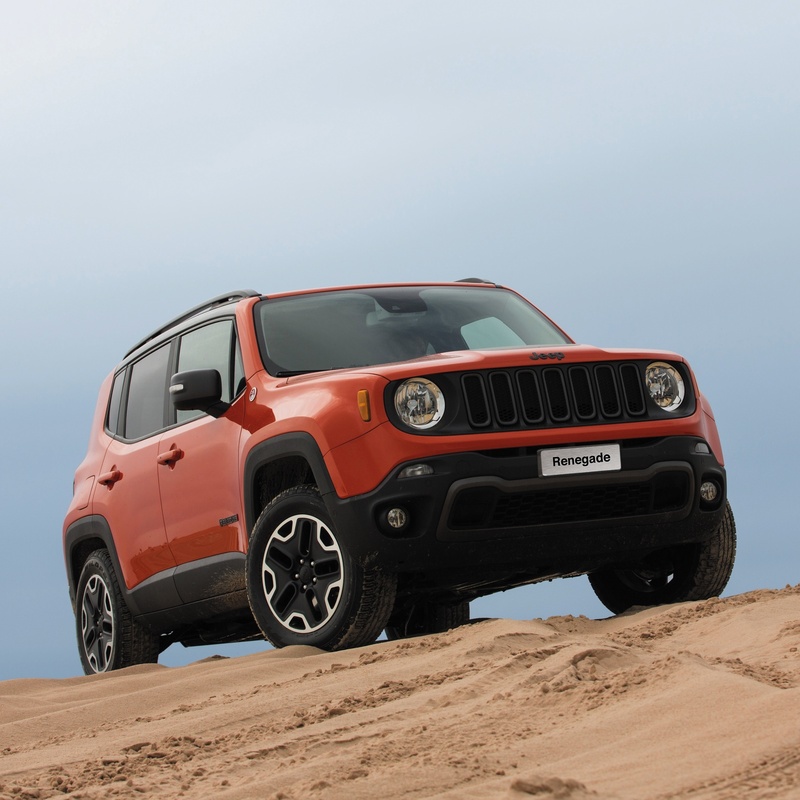 Jeep Renegade builds on the Wrangler’s powerful stance, rugged body forms and aggressive proportions that include best-in-class approach and departure angles purposely designed to deliver best-in-class capability. 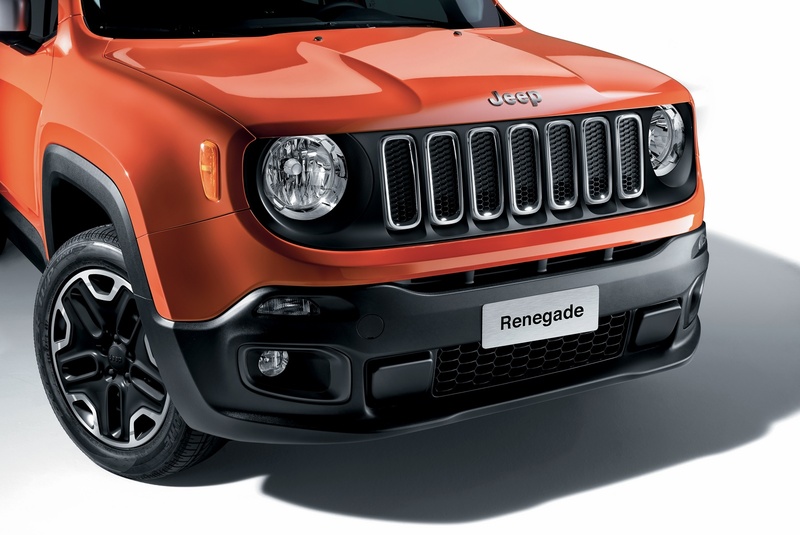 At the front, Renegade is decidedly Jeep with its signature seven-slot grille. 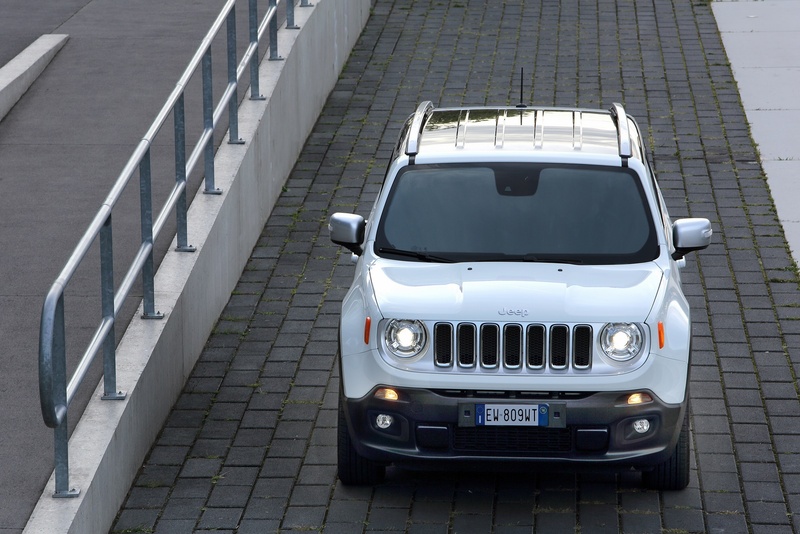 Large circular headlamps on the top of the front convey the typical Jeep look to the Renegade . Below the grille, a two-piece front fascia is aerodynamically tuned and features a body-color upper and molded-in-color lower. Short overhangs, trapezoidal wheel arches and a sculptural blend of fluid shapes interrupted by strong chamfers create Renegade’s rugged bodyside form. Inheriting Jeep Wrangler’s DNA, the Renegade features beefy tires, wide fender forms, and a raised belt line that recalls the icon’s half-doors. 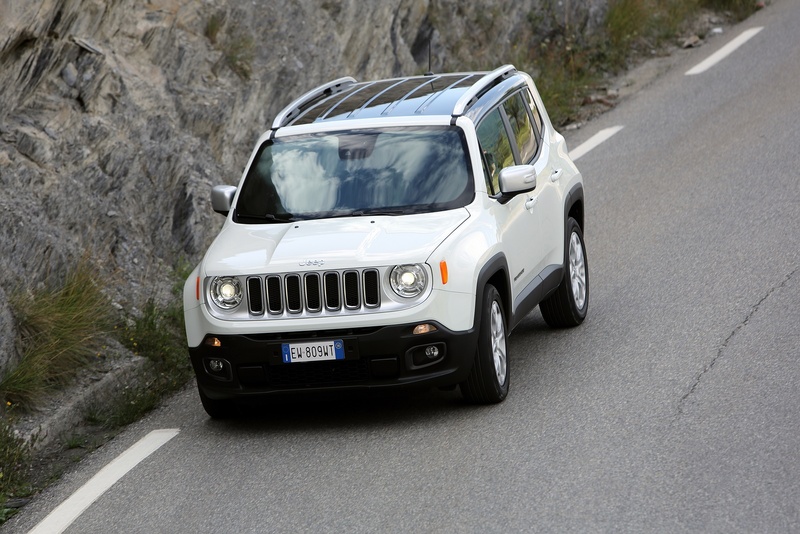 Adding to the Renegade’s contemporary look is an optional daylight openingwhich nods to Wrangler’s classic hardtop. At the sill, this new Jeep SUV features lower molded-in-color accent cladding that adds protection, all while lightening the weight of the vehicle by visually placing more painted body above the wheel centers. 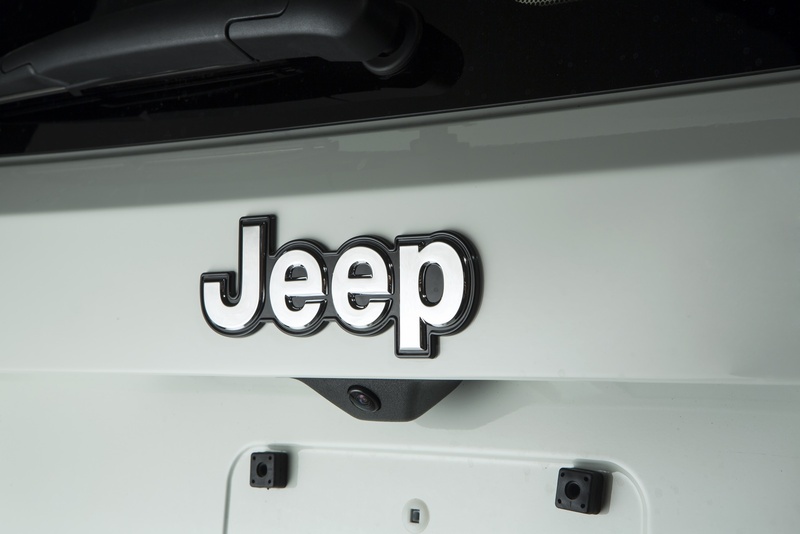 Linking the side profile to the rear is the familiar Jeep shield-shape that ties in the rear backlight and Wrangler-like square tail lamps with black accent surround. For added detail, the tail lamps feature a new “X” form design theme inspired by military equipment (gas can) – exuding strength and playing on Jeep brand’s roots. Just like the first Willys MB Jeep vehicles produced in 1941, the new Renegade offers open-air freedom with two optional open-air roof systems: a large electric dual pane sliding glass roof or the unique to segment ‘My Sky’. 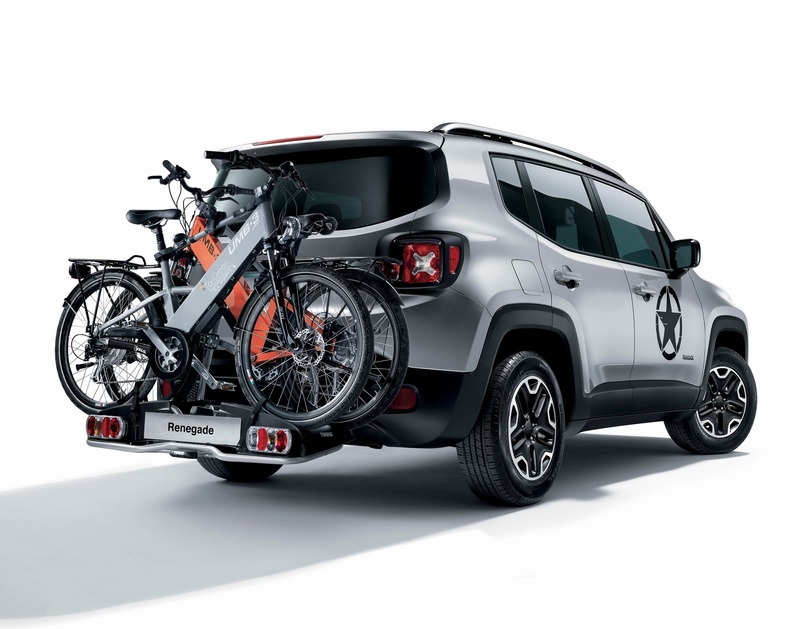 With its two lightweight panels -front and rear – that can be easily and conveniently removed and stowed in the rear cargo area, ‘My Sky’ introduces segment-exclusive panoramic open air experience with the characteristic Renegade X” design theme. 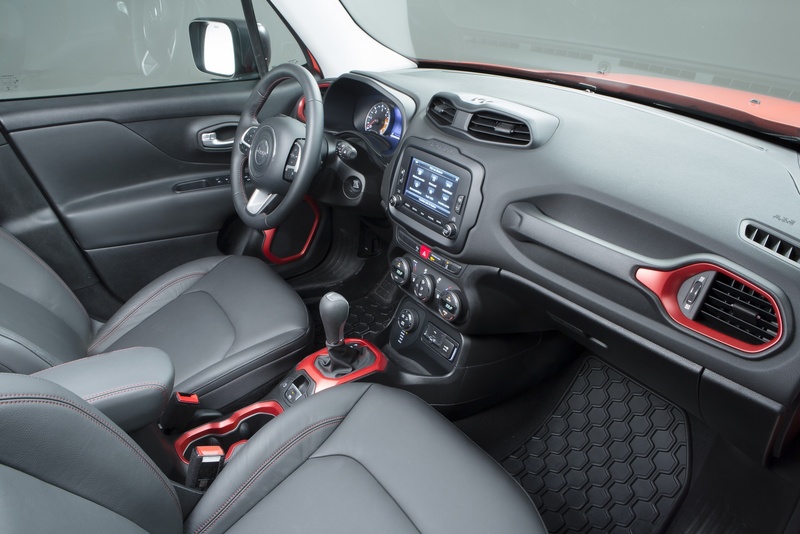 Jeep Renegade interior features a rugged and energetic appearance that builds upon the Jeep brand’s legendary heritage. It’s precisely crafted details, innovative and high-quality color and material appointments, state-of-the-art technology, and clever storage features draw inspiration from contemporary extreme sports gear and active lifestyles. When the Jeep designers began the interior design process, they started with a fresh canvas and simple design brief: create a Small SUV that they themselves would aspire to own. This objective is strikingly apparent in the Renegade’s dynamic lines, hand-sculpted forms, and emotional character. 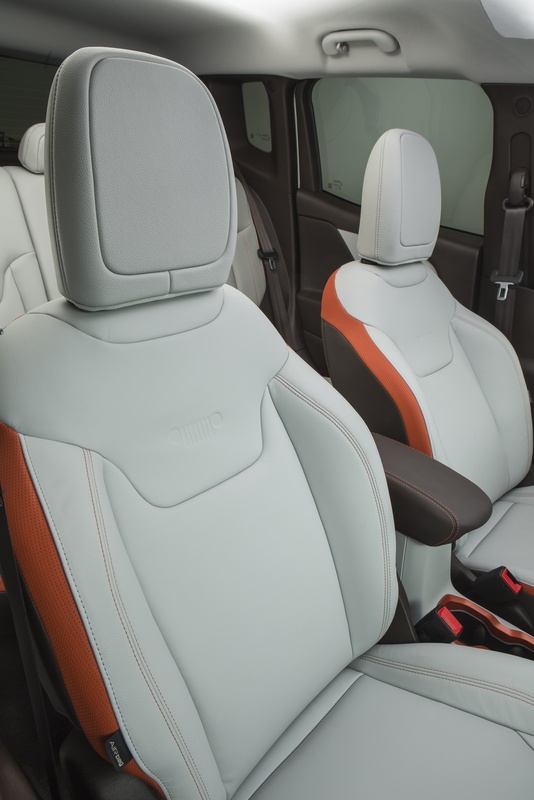 The interior of the new Renegade has a distinctive form language which Jeep designers have titled “Tek-Tonic.” The Tek-Tonic design theme is defined by the intersections of soft and tactile forms with rugged and functional details. Major surfaces such as the sculpted soft-touch instrument panel are intersected with bold functional elements like the passenger grab handle. 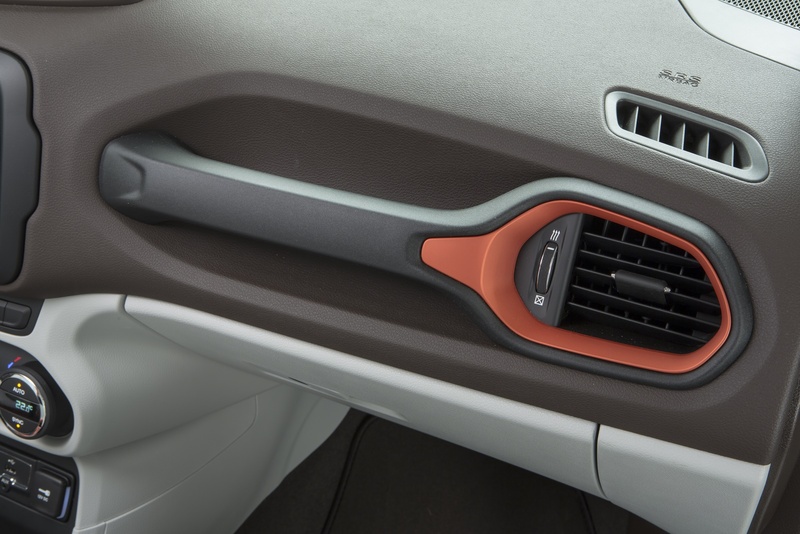 Indispensable for off-road adventures, the robust handle is borrowed from its big brother, the legendary Jeep Wrangler. 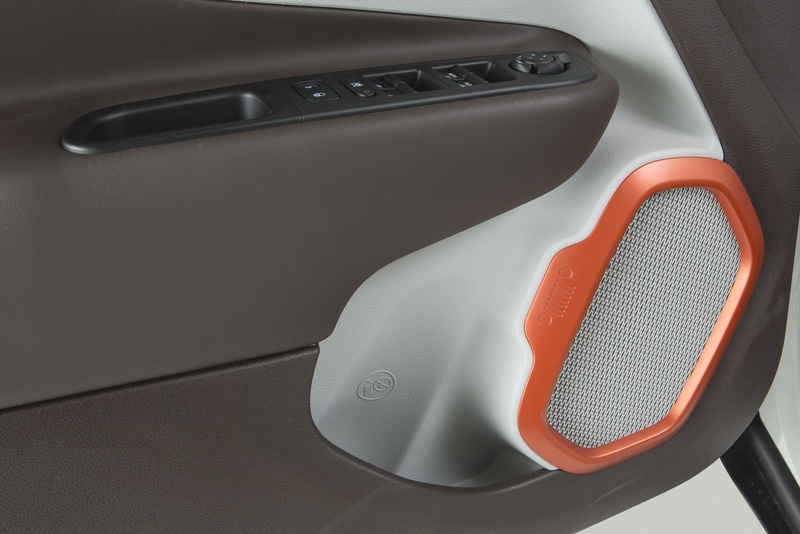 It cleverly integrates into the passenger air vent to create a unique sculpted element. The unique center vent and the anodized bezel accents draw inspiration from performance goggles and boots used in extreme sports. 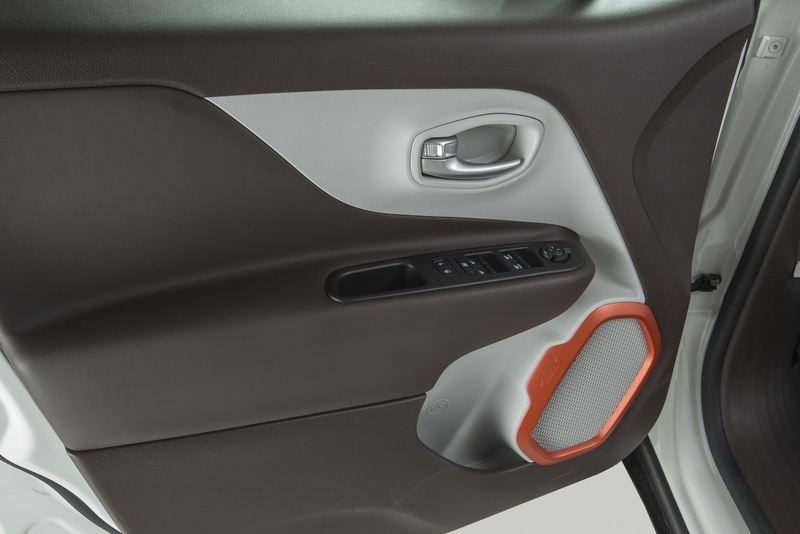 Unique protective clamps that surround the UConnect touchscreens, shifter bezel, and front-door speaker bezels exude strength and precision. The clamp surrounding the touchscreens is embossed with “Since 1941,” paying homage to the Jeep brand’s legendary history. 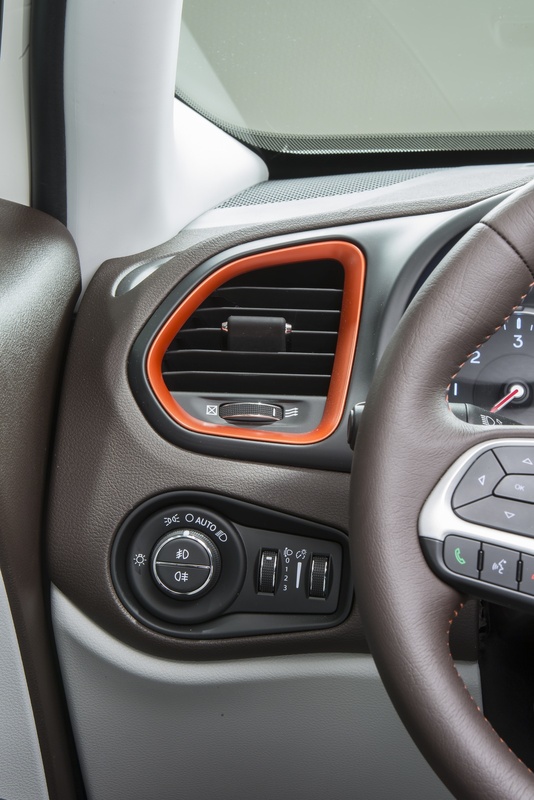 Jeep Renegade features a unique steering wheel with a thick, substantial rim section. Integrated audio, voice, and vehicle controls add a new level of convenience and sophistication. For added driver’s comfort, a segment-exclusive heated steering wheel is available. 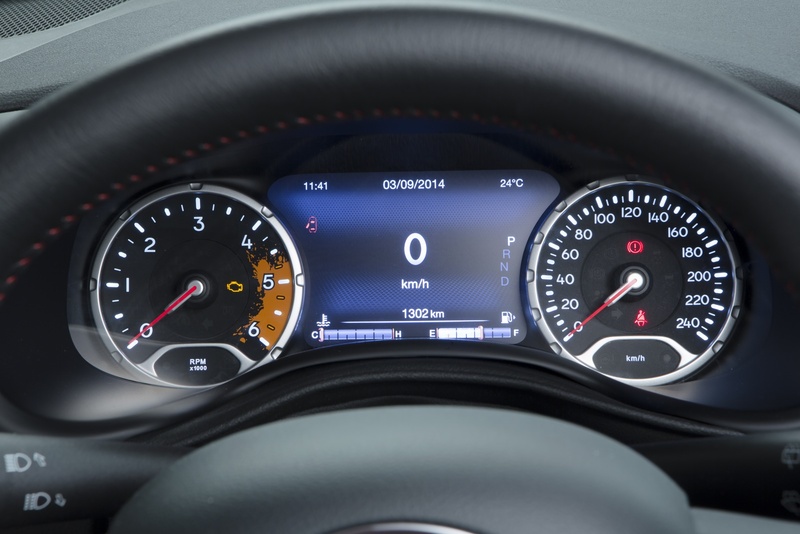 In front of the driver, the instrument cluster design includes a large analog speedometer and tachometer. 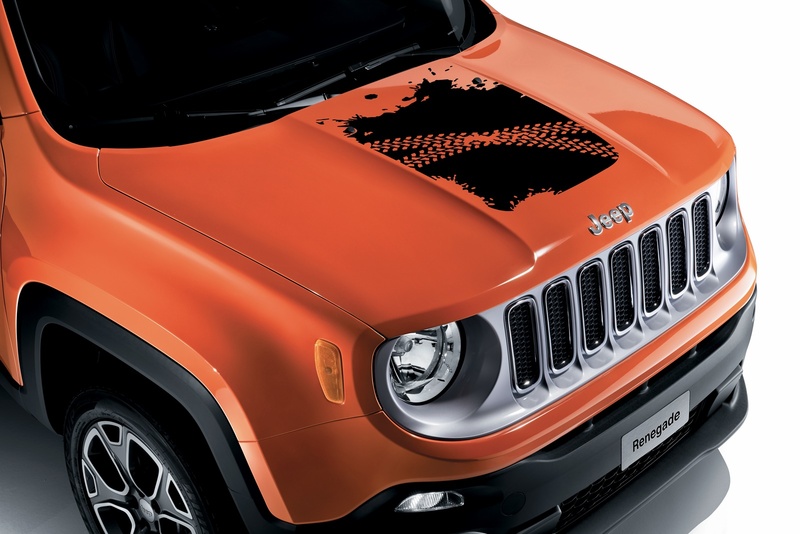 For an added sense of adventure, Renegade’s gauge cluster features a mud-splatter design graphic that originated from one of the Jeep design team’s weekend paintball adventures. Straddling both gauges is a 3.5″ monochrome display or a state-of-the-art 7″ TFT display that provides full-color vehicle information and allows the driver to enjoy a customized user experience. Both screens provide vehicle information and feedback through intuitive design, all to keep the driver’s hands on the wheel and eyes on the road. 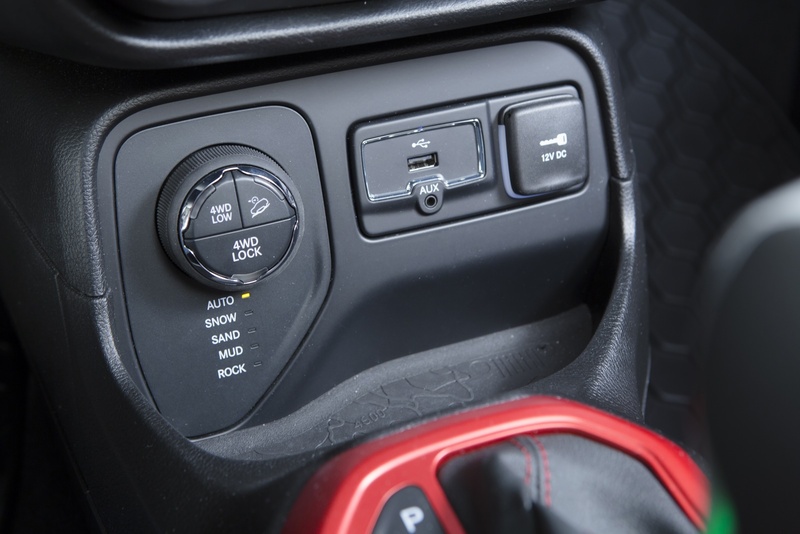 The lower part of the dashboard neatly integrates climate controls, a dampened glove box and the media center with USB, auxiliary input and 12-volt power connectivity for mobile devices. Proudly touting its Jeep design DNA and capability is a rubberized mat in the storage compartment under the media center, molded with a topography map of Moab, Utah – a legendary off-road spot for Jeep enthusiasts. 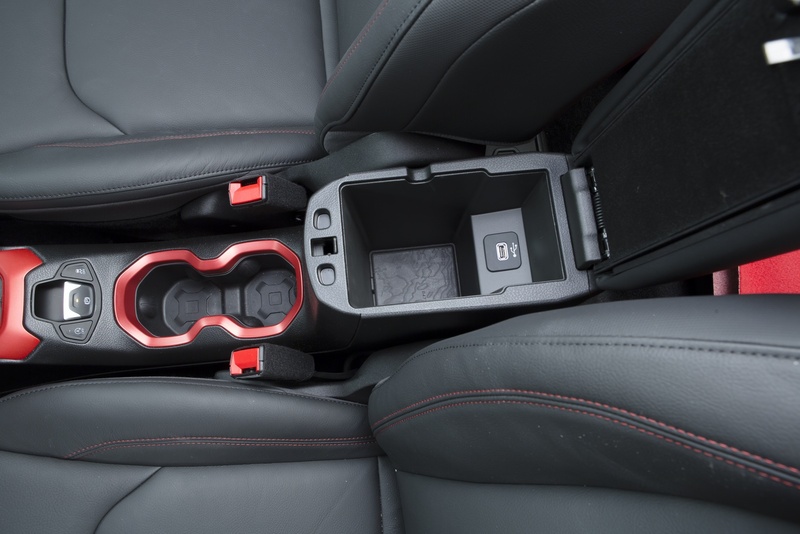 Similar to the X-shape inspired roof and tail lamps are the two front cup holders with the same embossed design detail that also helps to grip and secure different-sized beverage containers. 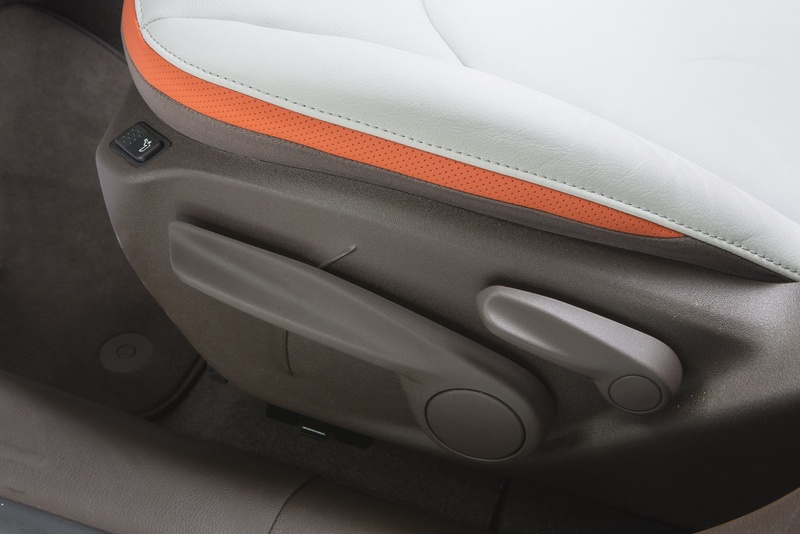 The Jeep Renegade’s center console armrest is wrapped, providing a softer touch, and offers an adjustable position for improved comfort. For added detail, the protective clamp bezel surrounds the transmission shifter and is finished in an anodized accent color to match the frames surrounding the climate control vents, the cup holder and the speakers. 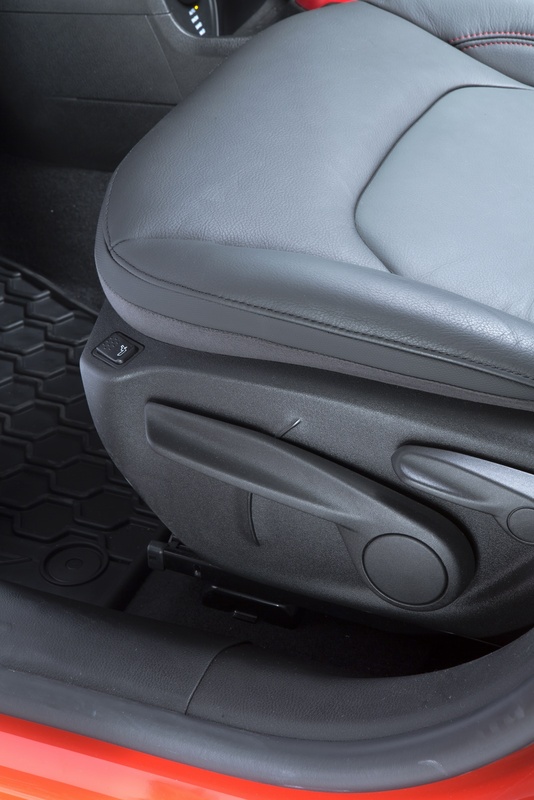 Passenger seats are ergonomically designed to support the contour of the body during longer journeys, and are trimmed with premium cloth or leather. 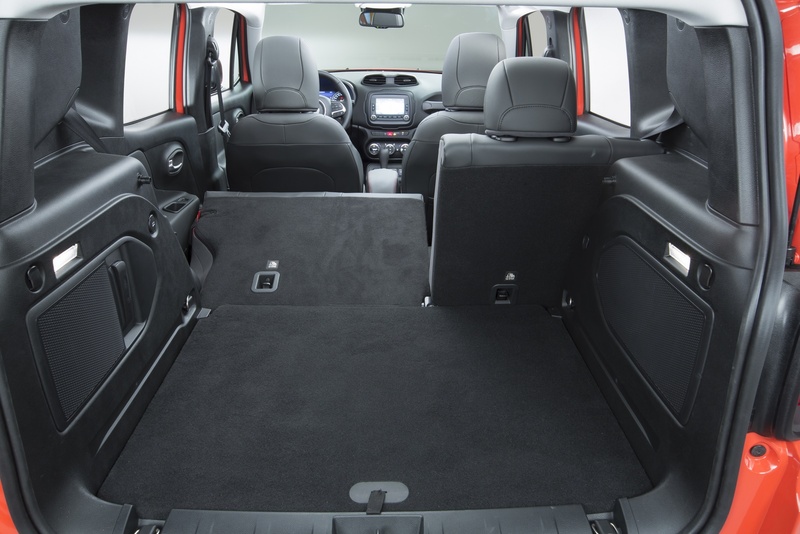 The Renegade includes a second-row 60/40-split seats, or for added convenience, 40/20/40-split seats with cargo area pass-through is available. 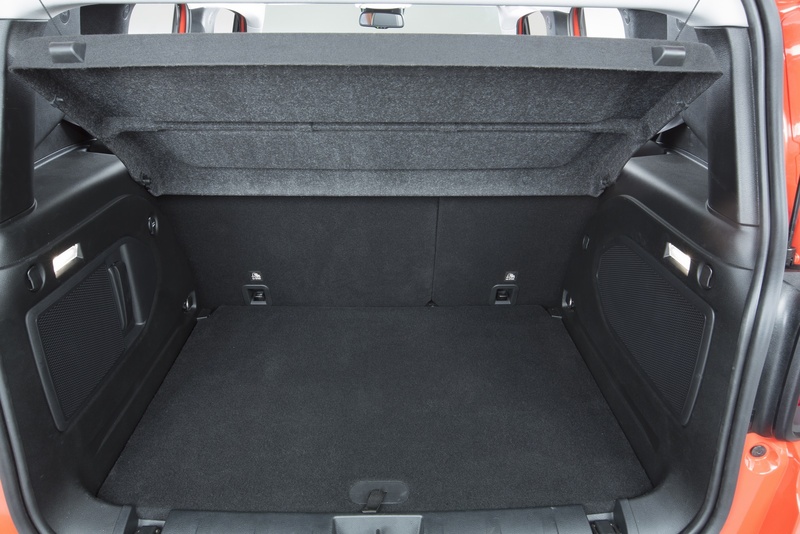 In addition to its 351 liters of storage, or 1,297 liters with rear seats folded flat, the vehicle features as optional equipment a removable, reversible and height-adjustable cargo floor panel which can be used also to neatly stow the removable My Sky roof panels in the lower part of the trunk. 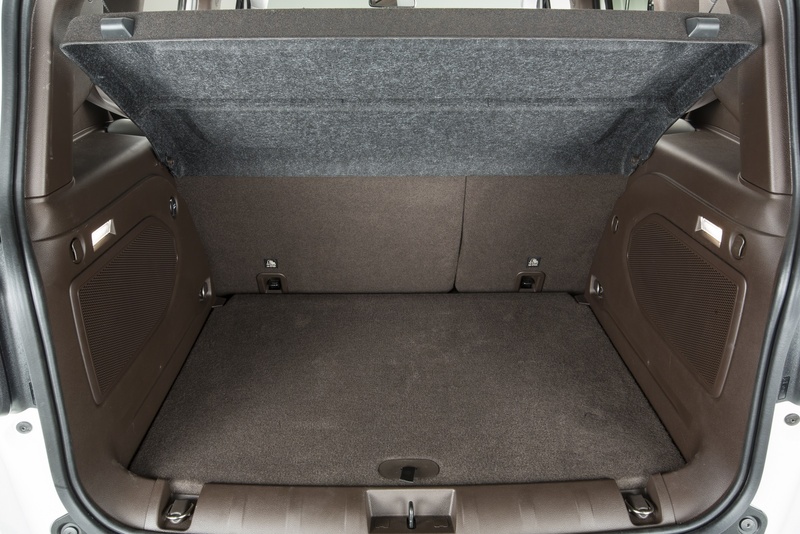 A uniquely designed Jeep My Sky roof-panel bag is included to protect the panels and help keep the cargo area tidy. 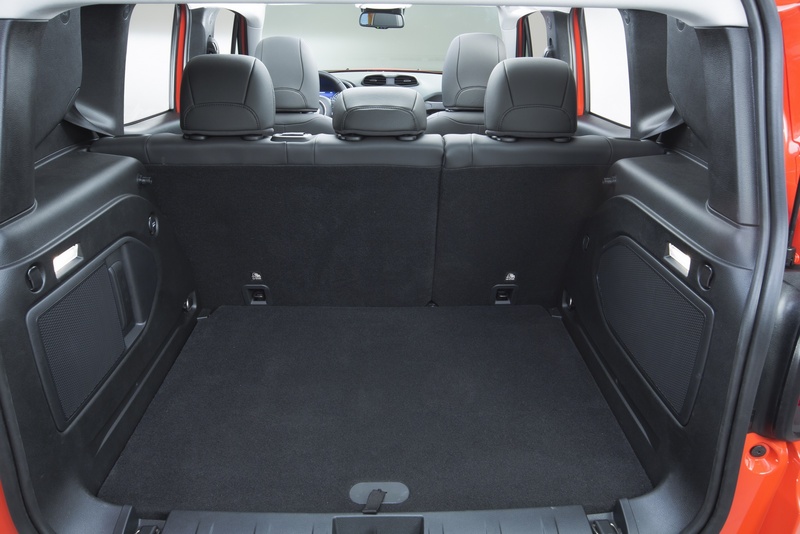 Maximizing versatility is a fold-forward front seat that enables the new Renegade to accommodate long objects. 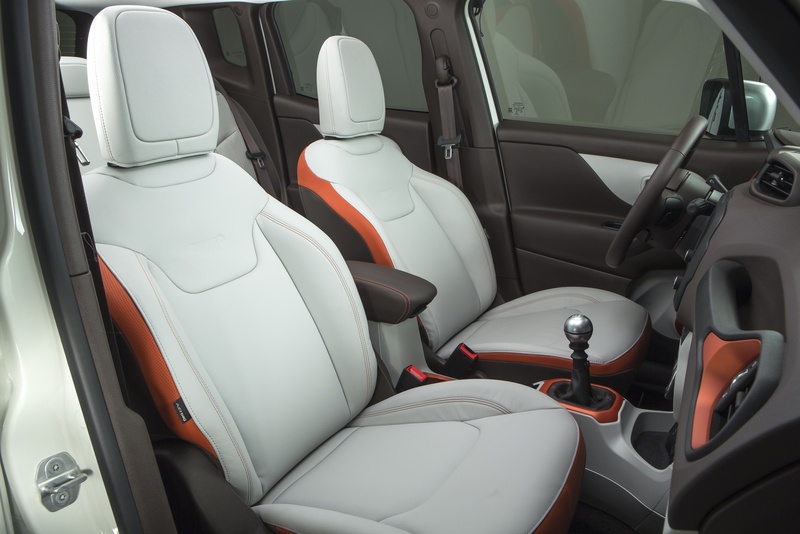 Following the Jeep interior design team’s philosophy for the Renegade, introduced and seen in the Jeep Grand Cherokee and Cherokee, a new approach for color and materials inspiration was obtained through different lifestyle adventures and locations around the world, creating invigorating color and material environments. 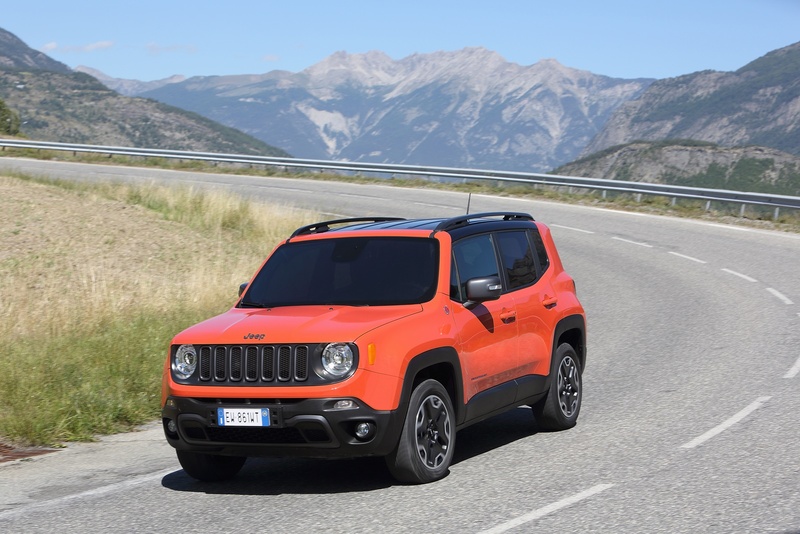 The new Jeep Renegade is available with several interior trim choices: each model of the new Jeep Renegade includes two color/trim combinations, which the exception of the Longitude and Limited, which offers three. The following color/trim options are available per model: Monotone Black with Metal Diamond bezel accents (Sport), two-tone Black/Sandstorm interior with Metal Diamond bezel accents, monotone Black with Metal Diamond bezel accents (Longitude), two-tone Black/Sandstorm interiors with Metal Diamond bezel accents (Longitude), two-tone Interior Bark Brown/Ski Gray with contrasting Anodized Orange bezel accents and stitching (Longitude), monotone black leather with contrasting Ruby Red bezel accents and stitching (Trailhawk), Black Leather (optional) with Ruby Red bezel accents and stitching (Trailhawk), Black Premium fabric with Metal Diamond bezel accents (Limited), Black Leather (optional) with Metal Diamond bezel accents and Beige stitching (Limited) and two-tone Bark Brown/Ski Gray Leather interiors (optional) with Anodized Orange bezel accents and stitching (Limited). 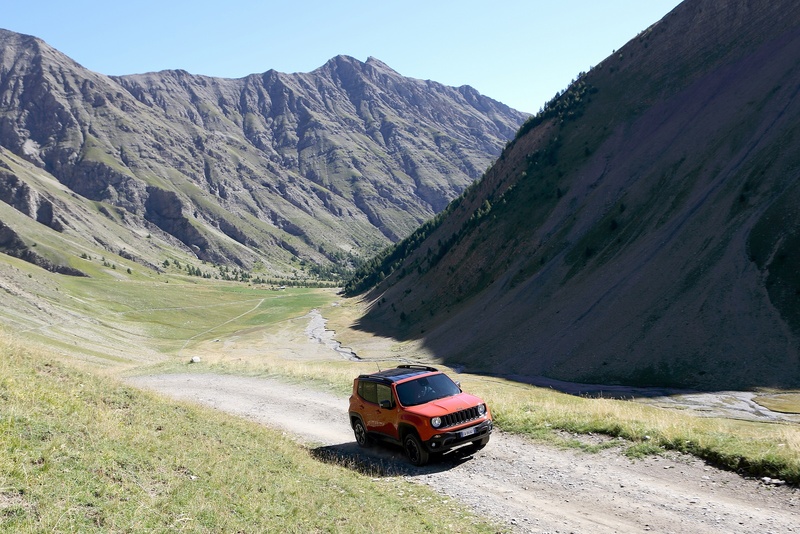 Jeep Renegade offers a choice of two innovative driveline systems – Jeep Active Drive and Jeep Active Drive Low – for best-in-class 4×4 capability in all driving conditions. 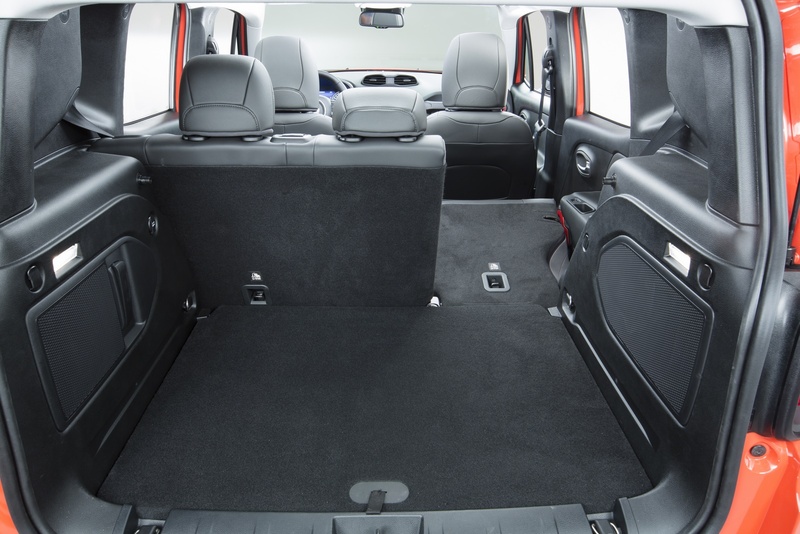 The new model is also the first Small SUV to feature rear-axle disconnect system delivering 4×2 levels of fuel-efficiency and instantly engaging 4×4 when traction is needed. Both 4×4 systems incorporate rear-axle disconnect that automatically and seamlessly switch between 4×2 and 4×4 for full-time torque management and optimal traction when necessary and without requiring input from the driver. Enabled by an innovative power-transfer unit (PTU), Jeep Active Drive is fully automatic and delivers seamless operation in and out of four-wheel drive, and at any speed. This system requires no driver intervention, delivers yaw correction during dynamic events and improves both understeer and oversteer conditions. Jeep Active Drive can provide up to 2,000 Nm of the engine’s available torque to the rear wheels, enabling optimal grip in low-traction conditions. A fully variable wet clutch housed in the rear-drive module utilizes the Jeep brand’s proprietary algorithms to provide the proper amount of torque for any driving condition, including low-traction surfaces, aggressive starts and dynamic driving. Jeep Active Drive Low builds on the Jeep Active Drive system and affords a 20:1 crawl ratio for genuine 4×4 capability. This system in combination with the petrol 2.4 liter and diesel 2.0-liter with nine-speed gearbox and ensures best-in-class off-road capability in extreme off-road driving. Jeep Active Drive Low adds Hill-descent Control to Selec-Terrain and the Trailhawk model features the “Rock” Selec-Terrain function to maximize wheel traction and improve grip. Hill-descent Control (HDC) enables a smooth and controlled hill descent in rough or slippery terrain without the driver needing to touch the brake pedal. When on, the vehicle will descend serious grades using the ABS brake system to control each wheel’s speed to ensure optimal pace and momentum. Up to five customized settings are offered: Auto, Snow, Sand and Mud modes, and exclusively on the Trailhawk model’s Jeep Active Drive Low system – Rock mode. For even greater Trail Rated off-road capability, Selec-Terrain includes Selec-Speed Control with Hill-descent Control. Rock (on Jeep Active Drive Low/Selec-Terrain 4×4 systems) – The system includes 4WD low capability. This mode is available only on Trailhawk models. 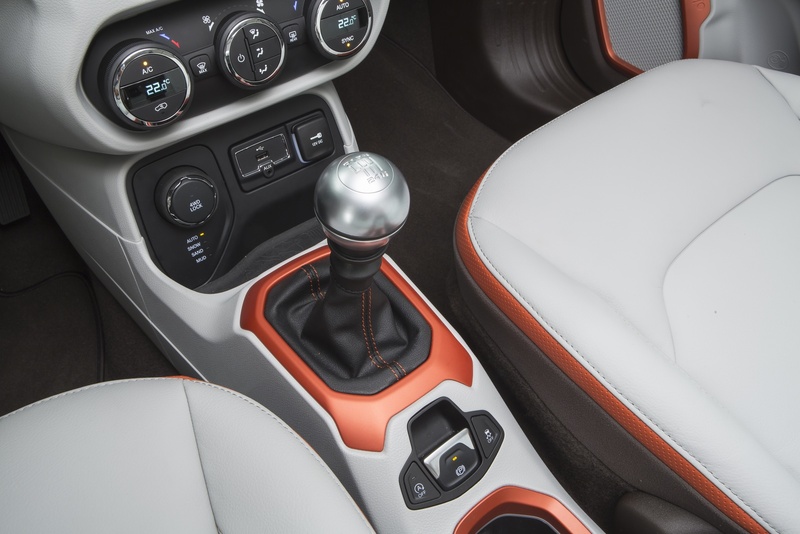 The new Jeep Renegade is the first Small SUV to feature a nine-speed automatic transmission. 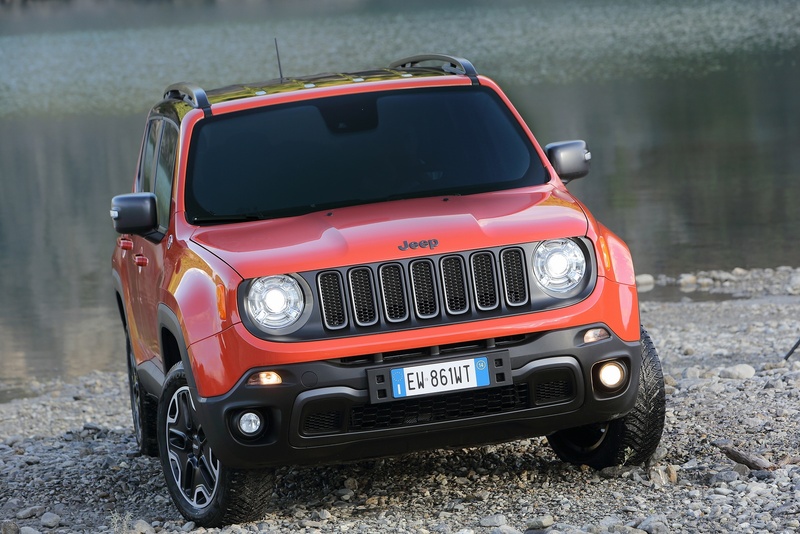 The new gearbox is equipped on the 170 horsepower 1.4-liter MultiAir2 Turbo engine, on the 140 and 170 horsepower 2.0-liter Turbo diesel engine and on the 2.4-liter Tigershark MultiAir petrol engine of the Renegade range. The nine-speed automatic transmission enables the vehicle to optimize engine output and ensures aggressive launches and smooth, efficient power delivery at highway speeds. 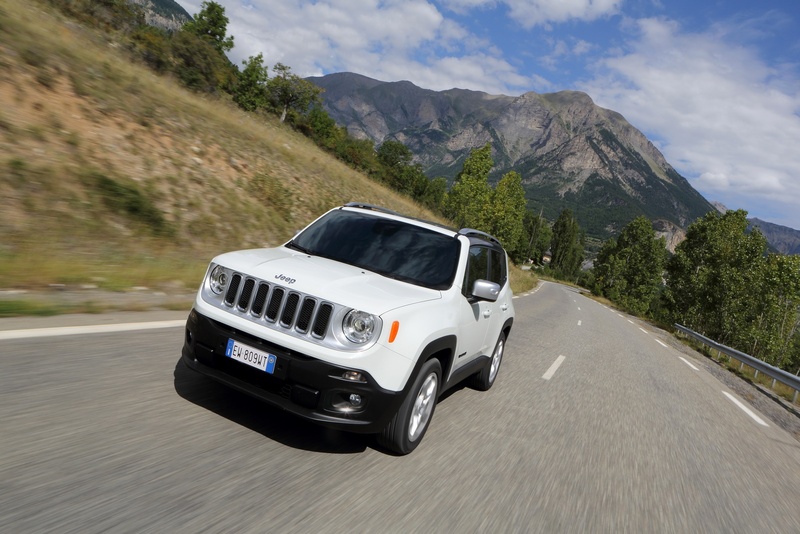 Like the new Jeep Cherokee, the Renegade’s nine-speed gearbox provides a more responsive driving experience with quicker acceleration and smoother shifting. The wide ratio spread delivers a bold first gear ratio of 4.71 for top performance at low rpm and small gear ratio steps affording luxury car levels of shifting refinement. A unique set of four overdrive ratios improve highway fuel economy and reduce overall noise, vibration and harshness (NVH) levels. The all-new, fully electronic nine-speed automatic features on-the-fly shift-map changing with Auto Stick manual shift capability. More than 20 individual shift maps for specific conditions optimize shift quality and shift points for improved fuel economy, performance and drivability. To determine the appropriate shift mode, the transmission software takes into account variables such as employed torque, kick-downs, longitudinal and lateral acceleration and grade changes. 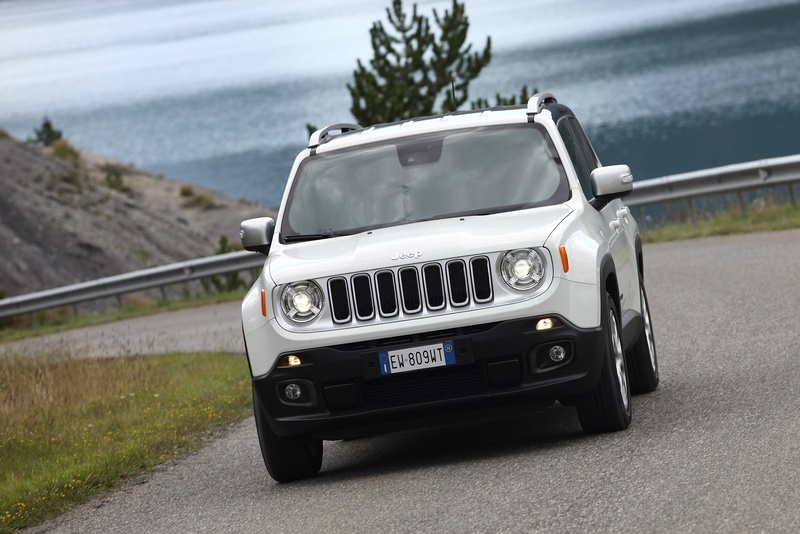 But a Jeep SUV isn’t a Jeep SUV unless it delivers superior off-road performance. 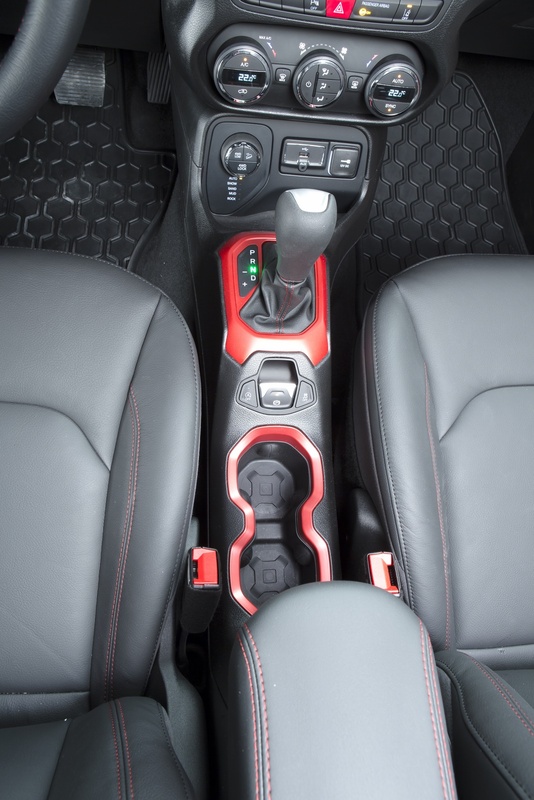 Uniquely suited to the requirements of the Renegade Trailhawk model, the nine-speed automatic transmission accommodates a 20:1 crawl ratio setting. The Trail Rated 4×4 rock-crawl ratio is enabled by a 4.71:1 first gear ratio coupled with a 4.334:1 final drive to deliver its class-leading 20:1 crawl ratio. The advanced nine-speed automatic, it is mated with the 1.4-liter turbo on Limited models, the 2.0-liter turbo diesel on Trailhawk and Limited models, and the 2.4-liter Tigershark on Trailhawk models sold in Russia, the Middle East and South Africa. 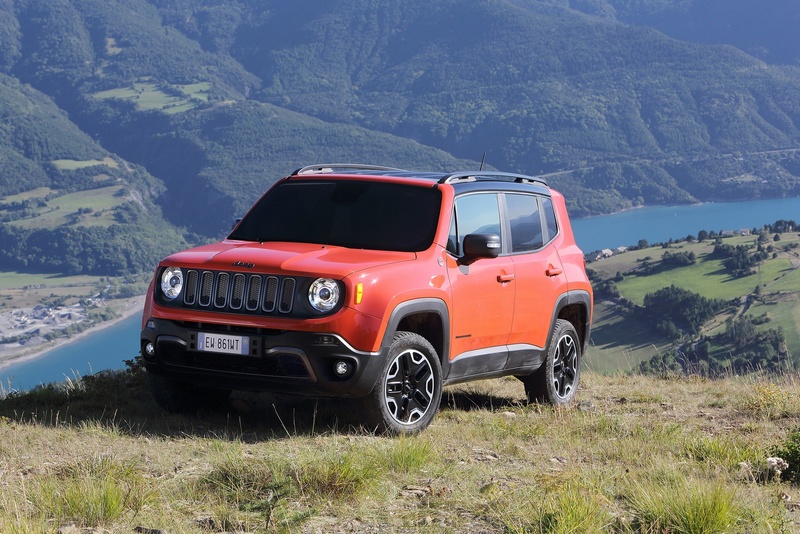 Jeep Renegade models equipped with the 140 horsepower 1.4-liter MultiAir Turbo, the 120 horsepower 1.6-liter MultiJet II and the 120 or 140 horsepower 2.0-liter MultiJet II feature a six-speed manual transmission with 6.68 ratio spread and a 4.438 final-drive ratio for fuel efficiency at faster speeds. And thanks to its first-gear launch ratio of 18.4:1, the gearbox delivers quick acceleration with smooth, precise shift quality. A tubular intermediate shaft with equal-length half shafts helps mitigate unwanted torque steer. 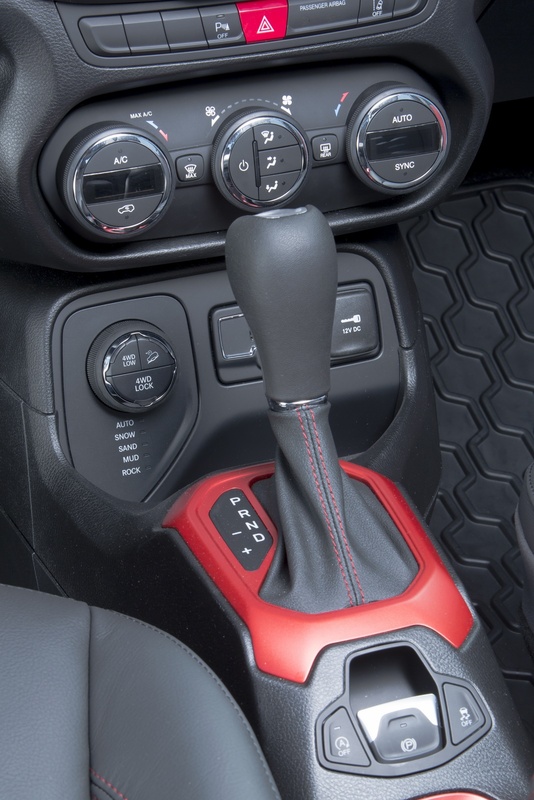 This six-speed state-of-the-art manual transmission is built and designed by Fiat Powertrain Technologies and belongs to a new group of transverse, three-shaft transmissions. These transmissions are more compact than transmissions with two shafts. The six-speed is synchronized in all gears for smooth gear transitions. The shift cables are equipped with an adjust mechanism for enhanced shift feel as well as an enhanced start / stop sensor that picks up movement to the gear (i.e. out of neutral). The clutch system features a dual mass flywheel with pendulum damper for enhanced noise/vibration characteristics at lower speed (i.e. reduced and/or eliminated “rattle). The clutch system is hydraulic for reduced operating effort and reduced pedal vibration. A six-speed automatic Dry Dual Clutch Transmission (DDCT) — mated with the 1.4-liter MultiAir2 Turbo engine – uses two clutches to connect the engine and transmission rather than one. Using two clutches makes it possible to carry out “power shifts” without any break in power transmitted to the ground because the ratios of the second half-gearbox are synchronized while the first is in operation. This means that the transmission of torque to the wheels is not interrupted – even during gearshifts, resulting in improved vehicle performance and driving comfort. The DDCT uses dry clutches that makes it possible to achieve fuel economy ratings that are better than those achieved with a manual gearbox of the same capacity. 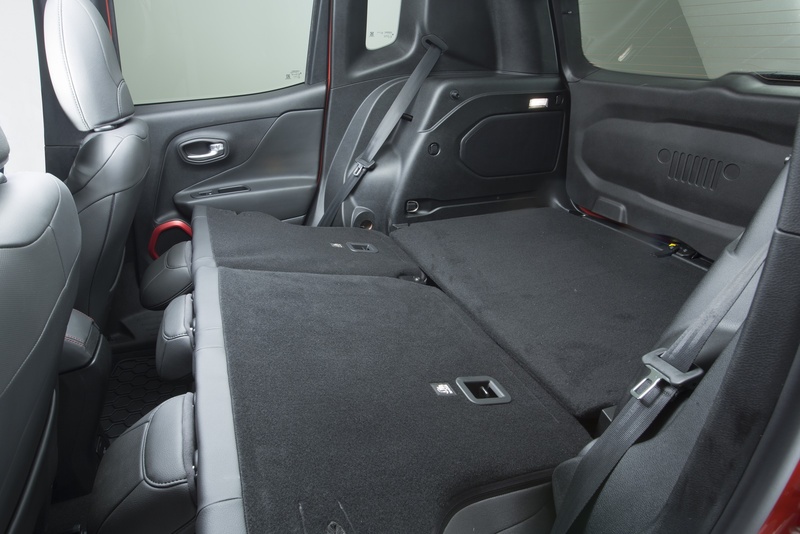 At the same time, passenger comfort levels are comparable with those of a conventional automatic in many cases. Shifts are implemented by means of an electro-hydraulic actuator system that is managed by a dedicated electronic control unit. The clutches are controlled by means of hydraulic CSCs with sensors. Designed to handle the turbocharged engine’s output, the DDCT utilizes a tubular intermediate shaft with equal-length half shafts to mitigate torque steer. 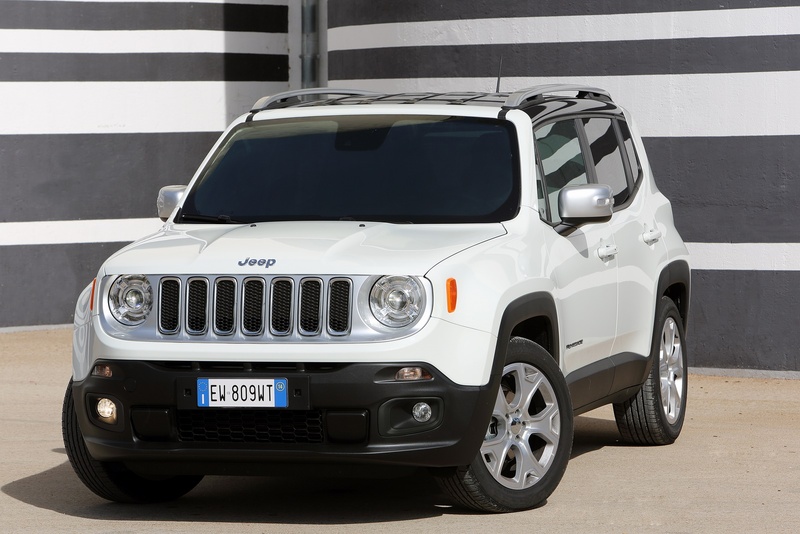 Jeep Renegade models equipped with 110 horsepower 1.6-liter E.torQ engine are paired to a five-speed manual gearbox. Developed for high-output applications, the proven C510 five-speed manual transmission has been upgraded for improved shift quality, and features a 3.929 final-drive ratio to deliver quicker acceleration and faster top speed without compromising fuel-efficiency. Designed to handle increased torque loads, this manual transmission includes an intermediate shaft with equal-length half shafts to mitigate torque steer; and oversized half shafts for increased strength and durability, and to reduce torsional stress in the driveline during performance driving. 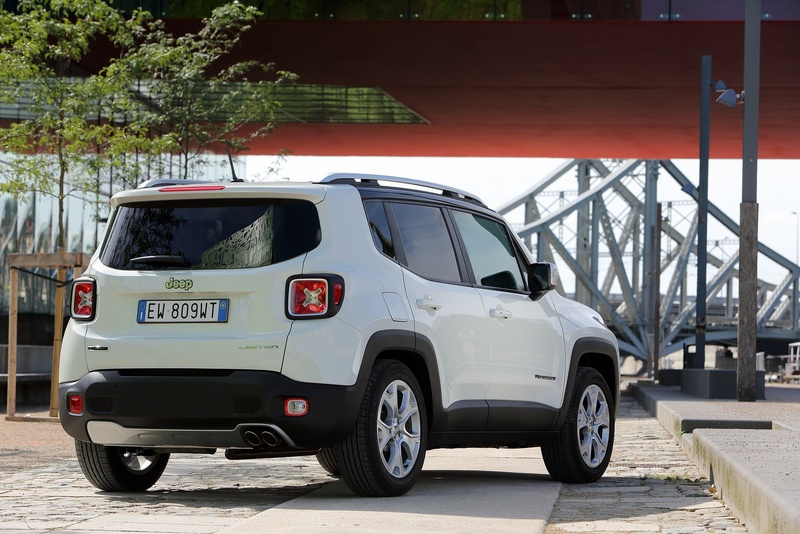 In Europe, the new Jeep Renegade is powered by two petrol and two diesel engines and a total of nine different powertrain combinations. The petrol engine offering includes the 140 horsepower 1.4-liter MultiAir2 Turbo engine with Stop&Start paired to both six-speed manual gearbox and DDCT (dual dry clutch transmission), the 170 horsepower 1.4-liter MultiAir2 Turbo engine with Stop&Start combined with the nine-speed automatic transmission and the 110 horsepower 1.6-liter E.torQ engine with Stop&Start paired to a five-speed manual gearbox. The diesel engine range comprises the 120 horsepower 1.6-liter MultiJet II with Stop&Start and a six-speed manual gearbox, the 120 or 140 horsepower 2.0-liter MultiJet II with Stop&Start and six-speed manual transmission, the 140 and 170 horsepower 2.0-liter MultiJet II with Stop&Start and nine-speed automatic transmission. 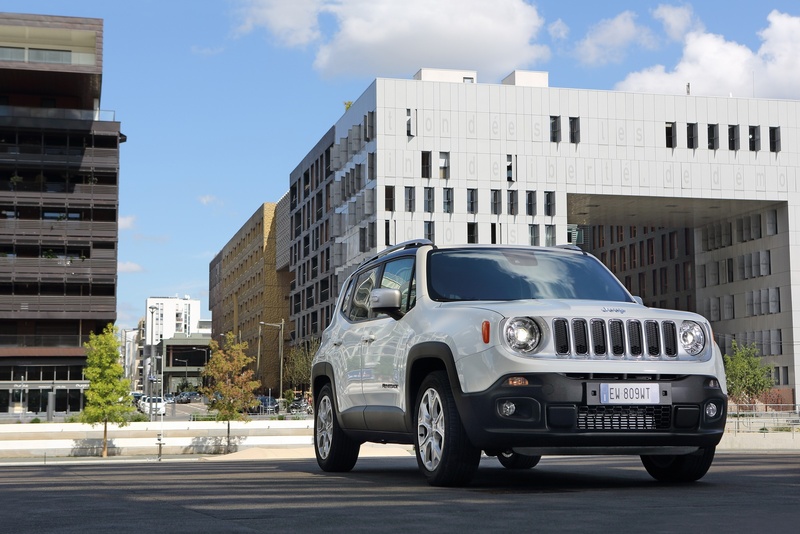 A 2.4-liter Tigershark MultiAir L4 petrol engine is available in the Renegade lineup sold in Russia, Africa and the Middle East and it is paired only to the nine-speed automatic gearbox. 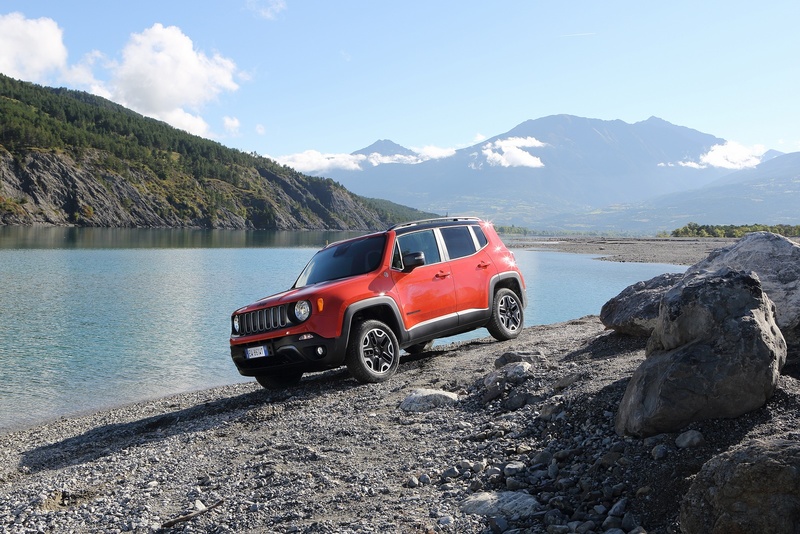 A 1.6-liter and higher displacement 2.0-liter Turbo Diesel engine are offered of the new Jeep Renegade available in Europe. Both feature second generation, MultiJet technology developed and patented by Fiat Powertrain. The MultiJet common rail injection system represents the most technologically advanced solution for independently controlling high injection pressures (1,600 bar) of the engine rotation speed and quantity of fuel injected. The engine management is capable of introducing small quantities of fuel (Pilot injections) in order to optimize engine noise and reduce pollutant emissions, and to manage with the Main injection the amount of fuel injected to provide the performance requested by the driver, thus allowing particularly smooth engine operation in all situations. The 1.6-liter I-4 Turbo diesel MultiJet II delivers 120 horsepower at 3,750 rpm and 320 Nm of torque at 1,750 rpm and is paired with the six-speed manual transmission. Stop&Start technology helps reduce emissions and eliminates fuel consumption that would result from idling. Includes a close-coupled Diesel Particulate Filter (DPF) in order to ensure efficient DPF regenerations and as a concequence lower fuel consumption. 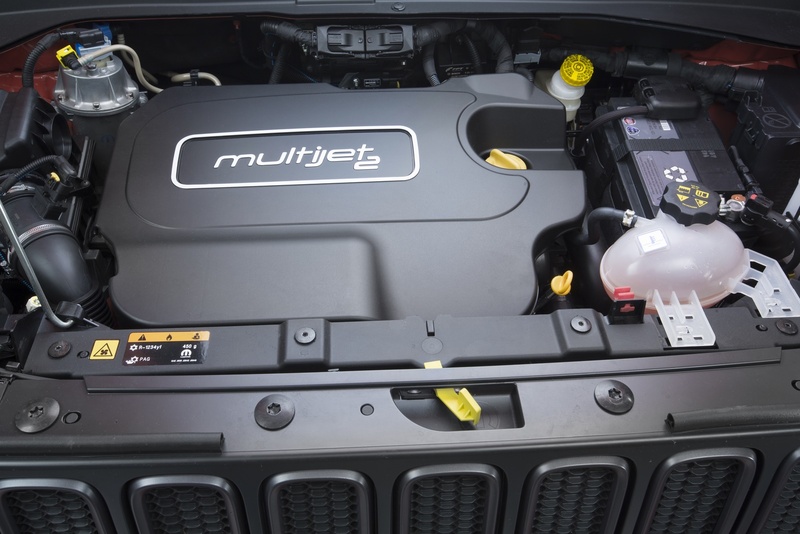 With output offerings of 140 and 170 horsepower, the 2.0-liter MultiJet II I-4 turbodiesel diesel delivers more power and performance, while still meeting Euro 6 emissions standards. An electronically controlled variable-geometry turbocharger improves transient response. The 2.0-liter diesel engine is available with the nine-speed automatic or the six-speed manual to deliver respectively 140 horsepower at 3,750 rpm or 170 horsepower at 3,750 rpm and 350 Nm of torque at 1,750 rpm. Lower engine friction reduces fuel consumption along with Stop&Start technology, which also helps cut emissions. Balance shafts to reduce vibrations at high engine speed and NVH pack to ensure low noise emission. The 1.4-liter “Turbo-MultiAir” I4 engine is the smaller displacement variant from Fiat Chrysler new family of four-cylinder petrol engines and it is applied on Sport, Longitude and Limited models. 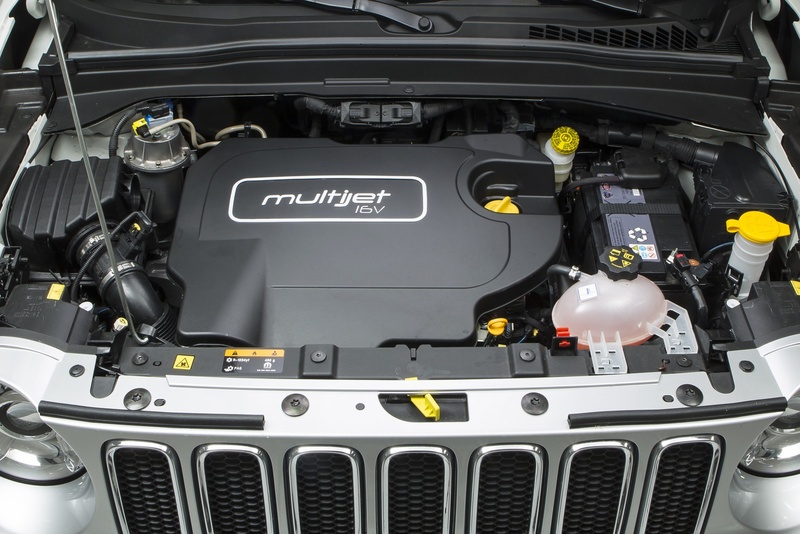 The 1.4-liter MultiAir Turbo engine is designed to take full advantage of the exclusive MultiAir valve train system developed by Fiat Powertrain and includes a host of new engine components designed for reduced friction to enhance the performance and fuel efficiency of Jeep’s first offering in the Small sport utility marketplace. The 1.4-liter MultiAir2 will be coupled with the six-speed manual transmission, the DDCT (dual dry clutch transmission) and the nine-speed automatic gearbox. The 1.4-liter MultiAir2 Turbo produces a maximum of 140 horsepower at 5,500 rpm and torque of 230 Nm at 1,750 rpm in combination with both six-speed manual gearbox and DDCT (dual dry clutch transmission). When paired with the 9-speed automatic gearbox and 4×4 the 1.4-liter MultiAir2 delivers 170 horsepower at 5,000 rpm and torque of 250 Nm at 2,500 rpm. The 1.4-liter MultiAir2 engine also incorporates “Stop/Start” technology that improves fuel efficiency and reduces CO2 emissions and is a engineered to meet E6 emissions standards. Structurally, the 1.4-liter MultiAir Turbo engine starts with a durable cast-iron block and a structural aluminum bedplate. The bore and stroke are 72 mm and 84 mm, respectively, for a total displacement of 1,368 cc. Boost pressure is dynamically managed to provide a broad torque curve over a wide variety of ambient conditions, with a peak pressure of 22 psi at 4,000 rpm. Exclusive MultiAir valve-actuation technology controls intake air, cylinder by cylinder and stroke by stroke. The resulting precision reduces carbon-dioxide emissions and boosts fuel-economy up to 7.5 percent compared with engines equipped with conventional valvetrains. At the bottom end, a forged-steel crankshaft with select-fit main bearings is supported across five main journals. The crankshaft and its counterweights are designed to reduce overall mass. Durability is ensured with the use of lightweight forged-steel connecting rods that have been designed with a unique cross-section to minimize longitudinal and lateral rod-bending. Lightweight cast-aluminum pistons contribute to the overall efficiency of the reciprocating assembly and the engine’s high-rpm capability. Full-floating piston pins are used for added strength. Piston cooling jets, located at the bottom of each cylinder, contribute to fuel economy by squirting oil on the bottom of the pistons. This helps maintain cylinder temperatures and reduce the possibility of hot spots along the cylinder walls or at the top of the piston that could lead to spark knock. 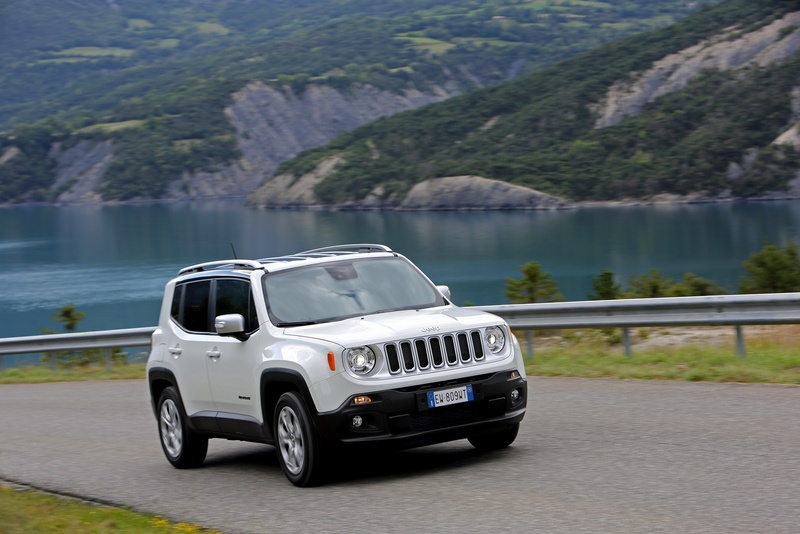 Efficiency and refinement also are hallmarks of the 16-valve, 2.4-liter Tigershark I-4 engine with the MultiAir2 electro-hydraulic, fully variable valve-actuation system available in the Renegade range in Russia, the Middle East and Africa. This high-tech engine produces 185 horsepower at 6,400 rpm with torque of 232 Nm at 4,800 rpm and is mated exclusively with the segment’s first nine-speed automatic transmission on Trailhawk models. MultiAir technology uses a column of oil in place of the traditional mechanical link between the camshaft and intake valves. The resulting precision maximizes intake manifold pressure, significantly reducing pumping losses. MultiAir2 takes the innovation further by simultaneously controlling both valve opening and closing events to more effectively manage combustion quality. This ensures the appropriate, effective compression ratio and efficient internal exhaust-gas recirculation (EGR) for improved fuel economy. Refinement was a key consideration in the design of every Tigershark component, from its fully isolated aluminum head cover with integrated oil-separation system, to its high-pressure, die-cast aluminum block. Sandwiched between the block and the steel oil pan is a lightweight, aluminum ladder-frame with integral oil filter and oil-cooler adapter. This lends additional structural rigidity. The oil pan itself boasts refinement. Acoustic material is sandwiched between its outer and inner stampings. The Tigershark’s polymer-coated piston skirts and tighter piston-to-bore tolerances contribute to reduced NVH. The cast-aluminum piston, combustion chamber and ports align with the MultiAir2 system for optimal combustion and fuel economy. Cast-aluminum pistons with a compression ratio of 10:1 are designed specifically for the engine and MultiAir system. Each bore is fitted with individual oil-squirters in the block that spray oil on the bottom of the pistons and bore walls to maintain cylinder-wall and piston temperatures. 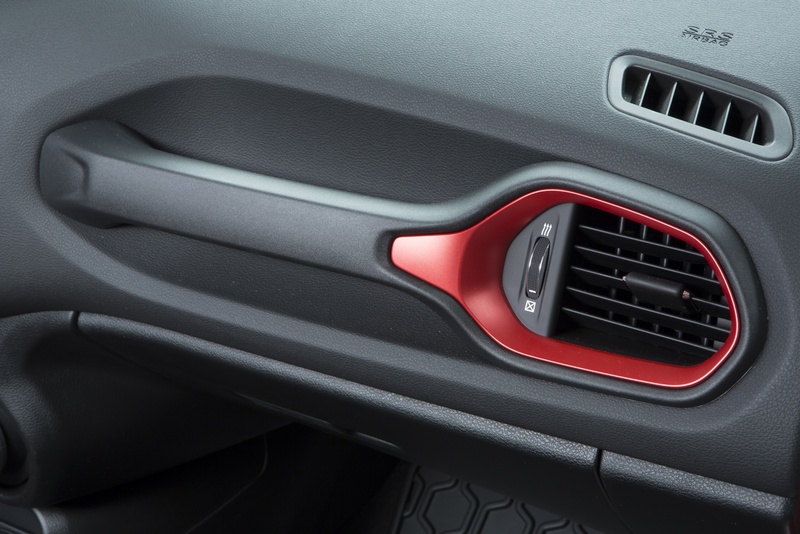 This feature also helps prevent hot spots that could lead to knock, while improving performance and fuel economy. Fitted to the forged-steel crankshaft are powder-forged-steel connecting rods that feature a full-floating piston pin with diamond-like carbon coating. This further reduces friction and improves fuel efficiency. Vibration is minimized with the use of a balance shaft module. And to maintain adequate oiling at all engine speeds, the 2.4-liter MultiAir2 Tigershark features a two-stage oil-pressure relief system that reduces engine-oil pumping loads at low engine speeds for better fuel efficiency. The 16-valve 1.6-liter E.torQ I-4 delivers 110 horsepower at 5,500 rpm and 152 Nm of peak torque at 4,500 rpm. Stop&Start technology helps cut emissions and fuel consumption. Unique components help the lightweight engine deliver high torque at low engine speeds while contributing to reduced fuel consumption. Graphite-coated pistons are optimized to reduce friction and weight. Forged connecting rods and an aluminum oil pan aid weight savings. For increased refinement, the E.torQ crankshaft features eight counterweights. 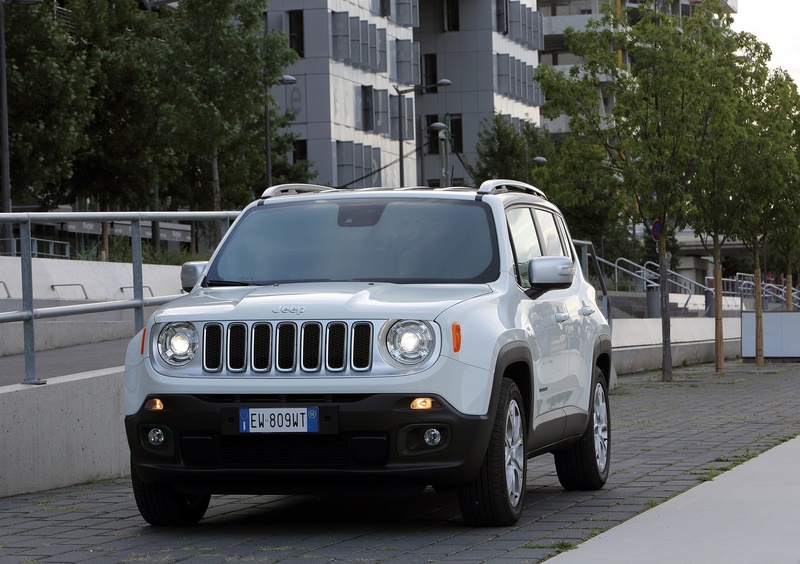 The new Jeep Renegade is equipped with standard Stop&Start technology on all other powertrain configurations. This system automatically shuts down and restarts the engine to reduce the amount of time the powerplant spends idling, thereby reducing fuel consumption and emissions. This is most advantageous for vehicles which spend significant amounts of time waiting at traffic lights or frequently come to a stop in traffic. As a result, fuel economy gains can range from five to ten-percent. Designed and engineered to deliver legendary Jeep capability, the new Renegade is the first Small sport-utility vehicle (SUV) to use the all-new “small-wide 4×4 architecture.” With its fully independent suspension, Renegade raises the bar in the Small SUV segment with best-in-class off-road capability, along with world-class on-road driving dynamics and passenger safety. 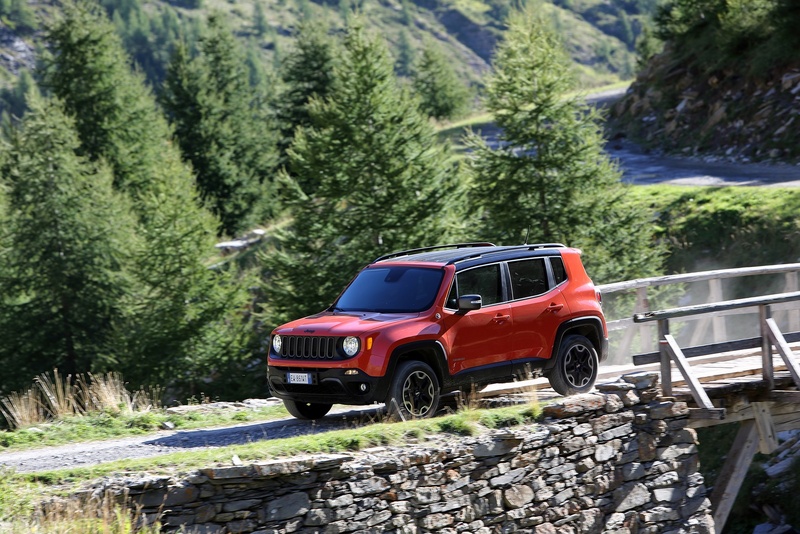 As the first Jeep vehicle built exclusively outside of the United States to target global markets, the development of Jeep Renegade was a global coordination of Jeep engineering and design, with Italian craftsmanship and execution. 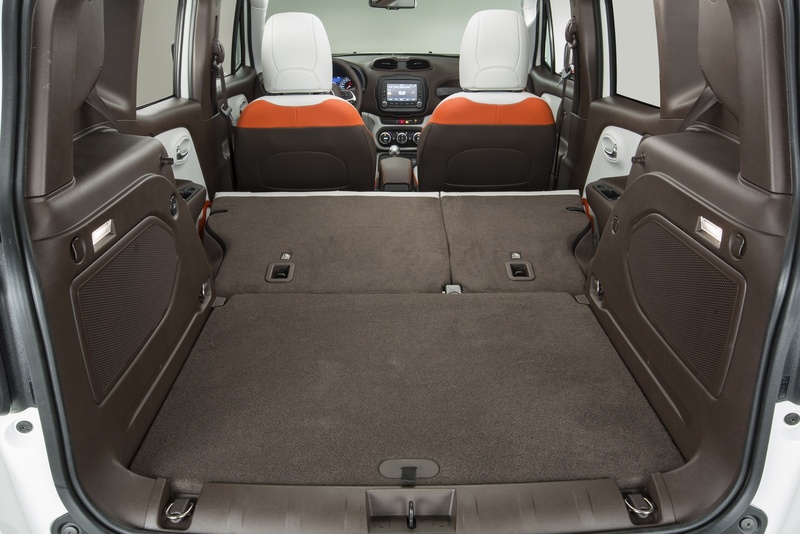 As the first vehicle to use the small-wide 4×4 architecture, the Jeep Renegade’s modular architecture means many models can be built using the same basic underpinnings. The result is better quality and reliability, less development time and improved tooling. The architecture that the Renegade is built on is comprised of common modular and interchangeable components, and allows for modularity of the wheelbase, front track, rear track, front overhang, and length and width across vehicle lines. 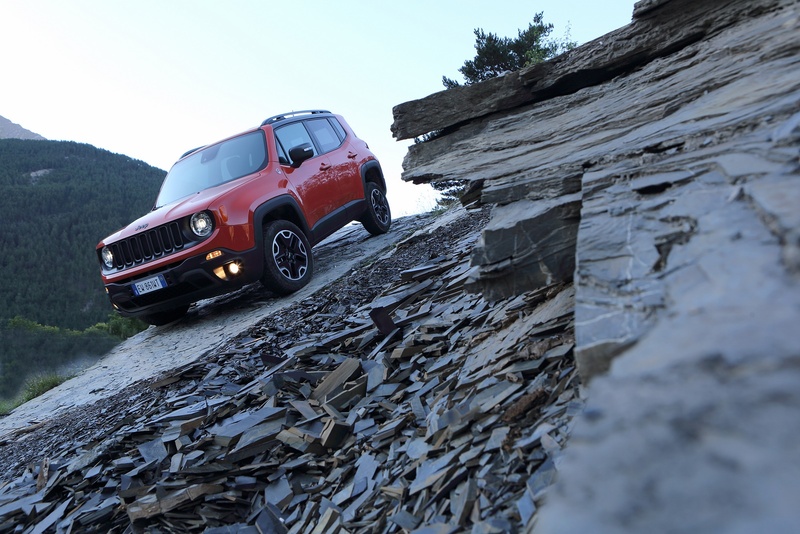 With extensive use of advanced steels, composites and advanced computer-impact simulations, the Jeep Renegade’s architecture delivers world-class torsional stiffness for optimum control of body geometry. For passengers, the new architecture delivers off-road durability and up to 205 mm of rear wheel articulation and 210 mm of ground clearance – all while feeling tighter and stiffer, with an added sense of confidence and control during high speed on-road maneuvers. 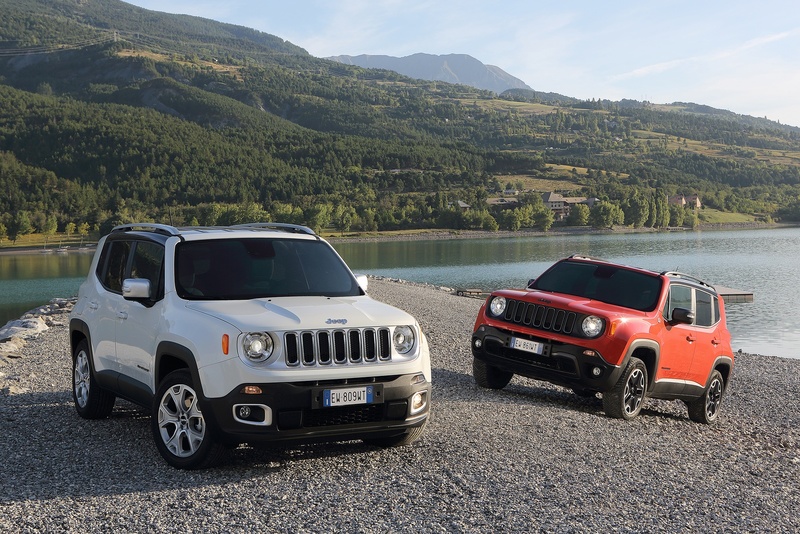 Renegade features a unibody structure based on the all-new small-wide 4×4 architecture, with the upper body structure and frame engineered as a single unit for a stiff and more mass-efficient structure. Its rigid foundation can be credited to the extensive use of high-strength steel and liberal use of structural adhesives. The new Small SUV utilizes approximately 70 percent high-strength steel for maximizing vehicle dynamics and crash performance while optimizing weight efficiency – the first Jeep vehicle to use high-strength steel to this extent. 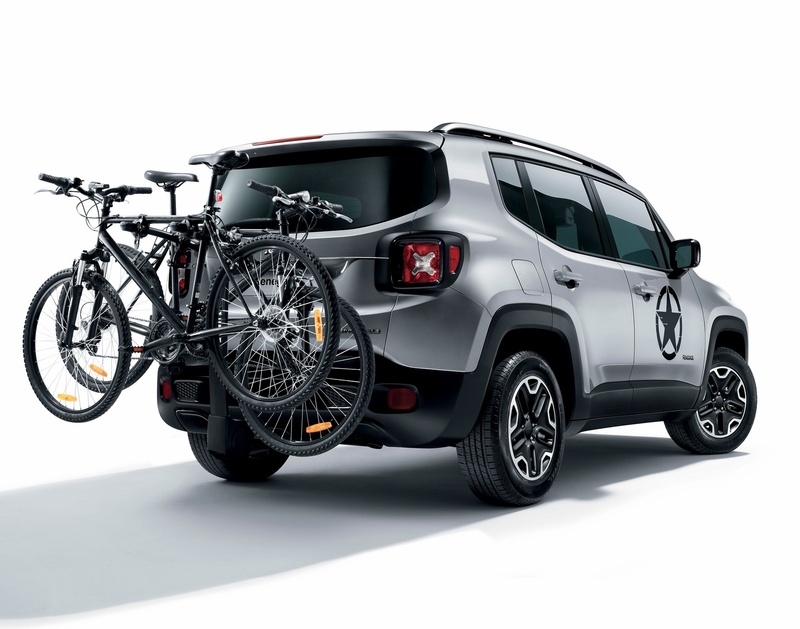 For additional weight and strength optimization, Renegade features an aluminum hood, front-cross beam and hybrid rear crash box. One of the most notable body structure features is the application of advance high-strength and “hot-stamped” steels in the upper- and under-body, A- and B-pillars, front header, sills and rails. 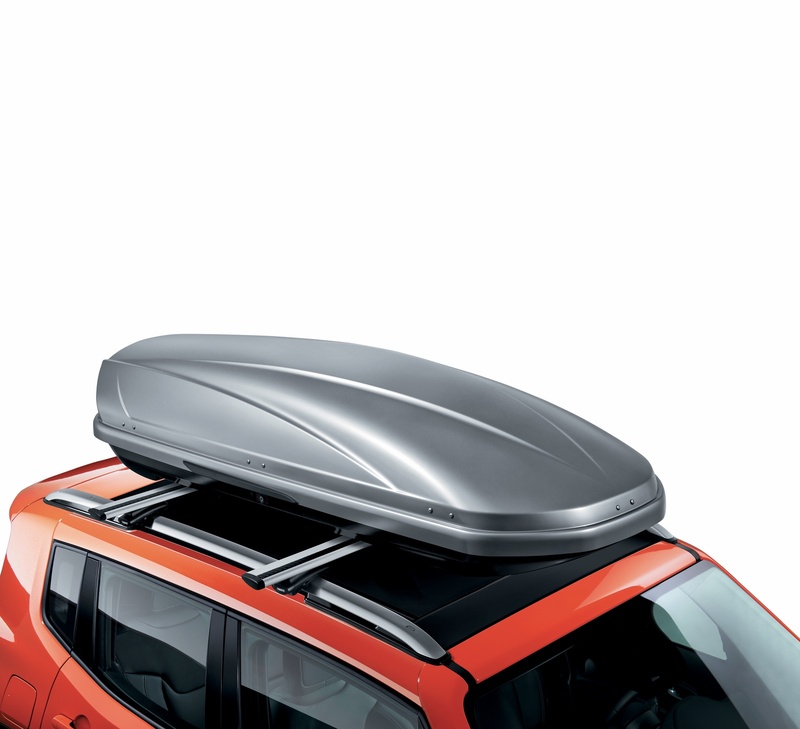 Combined, these structural attributes enable the Jeep Renegade’s roof strength, as well as enhanced visibility via thinner pillar sections. Enhanced chassis-to-body structure interfaces, including suspension brackets and cradle attachments, are designed to ensure high stiffness at those points and minimize low-frequency noise into the cabin. 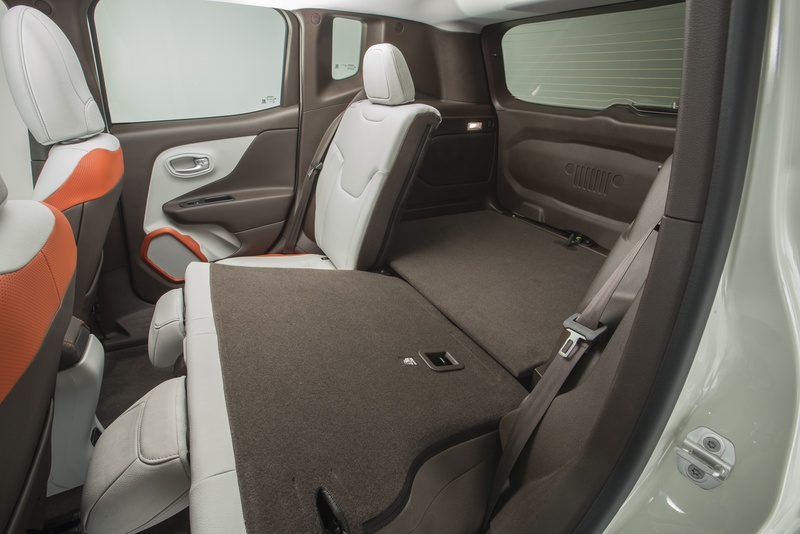 Additionally, this rigid body structure enabled engineers to dial-in the Jeep Renegade’s chassis tuning. 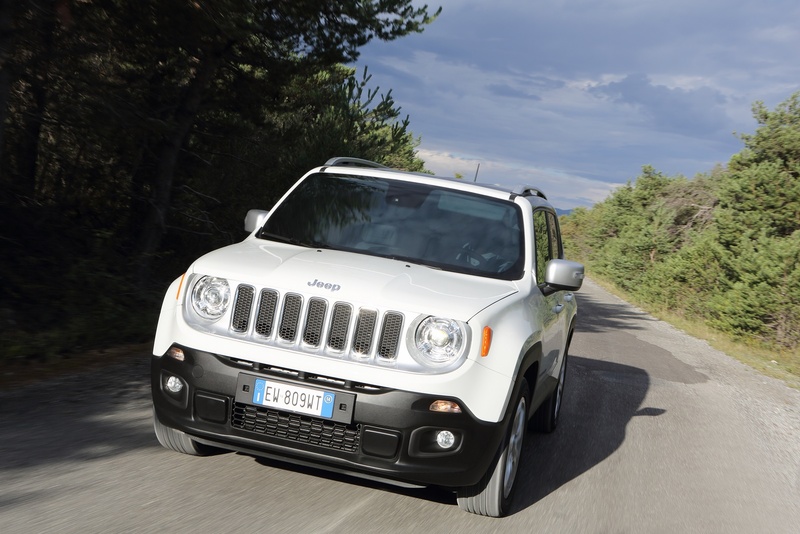 The overall result is Jeep Renegade’s solid, confident and refined feel on the road or trail. 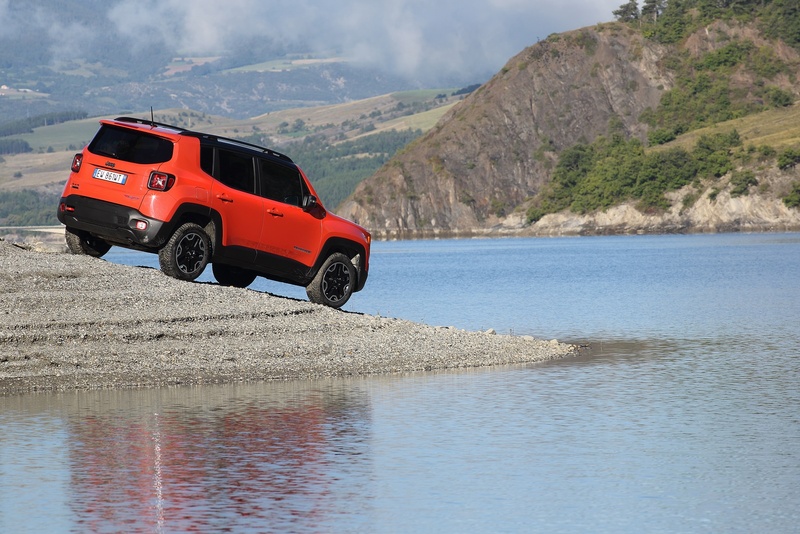 To deliver best-in-class off-road performance with the dynamics and comfort expected in a Small SUV, Renegade features a MacPherson front-suspension design with exceptional rigidity for up to 170 mm of articulation, increased cornering performance and reduced weight. A specially designed front cross member serves two roles by providing rigidity to achieve greater acoustic comfort and to integrate a third-load line to improve energy absorption in the event of a crash. A new innovation is the adoption of a “split” type shock absorber mounting that transmits road vibrations to the body structure through two different routes for improved acoustics and better efficiency of the shock absorber. Designed to dampen unwanted harshness into the cabin and help handle the driveline’s torque, the Renegade’s chassis architecture features an isolated rear cradle. 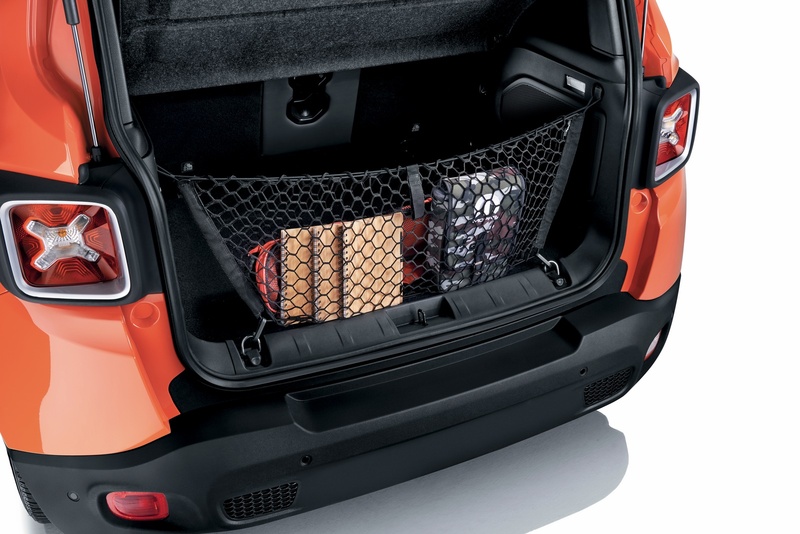 Additionally, the rear cradle provides the attachment points for Jeep Renegade’s lightweight Chapman suspension design’s two lateral links and half-shafts. With its high-mounted strut-type shock absorbers and coil springs, this rear suspension design enables Jeep Renegade to maximize spring rates, improve its roll-steer for on-road performance and offer up to 205 mm of rear-wheel articulation for off-road adventures. Jeep Renegade is the first Jeep to integrate Koni’s frequency selective damping (FSD) front and rear strut system. 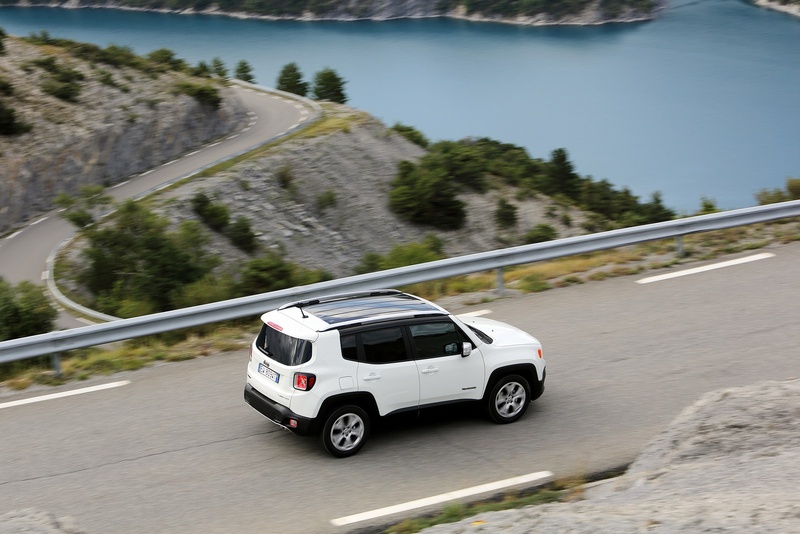 This damping system enables the Renegade to deliver world-class road-holding and handling characteristics. In addition, the Koni FSD system actively filters out high-frequency suspension inputs from uneven road surfaces and adjusts for comfort and smoothness while maintaining excellent ride control. 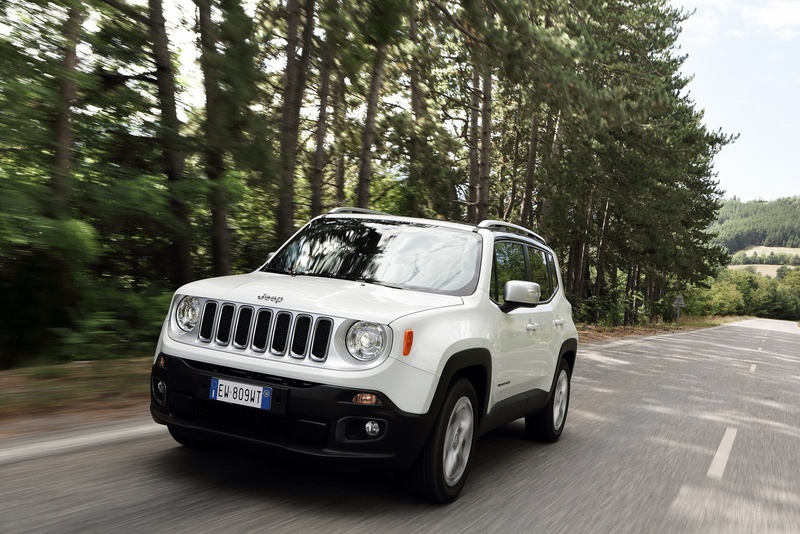 Jeep Renegade features precise steering, thanks to its electric power steering (EPS) and driving steering torque (DST) systems, which improve both handling and performance. The vehicle features an advanced steering-column-mounted EPS system that utilizes the latest EPS system technology available, which delivers sporty handling by managing significant loads at all steering wheel operating speeds and power assist curves modulated according to driving conditions, and up to a 3 percent improvement in fuel efficiency when compared with a conventional hydraulic system. All of the power boost, or assist, is provided via an electric motor, and because the system is fully electronic, the driver experiences optimal steering effort at all vehicle speeds with improved fuel efficiency, since there is no parasitic loss from a power steering pump. 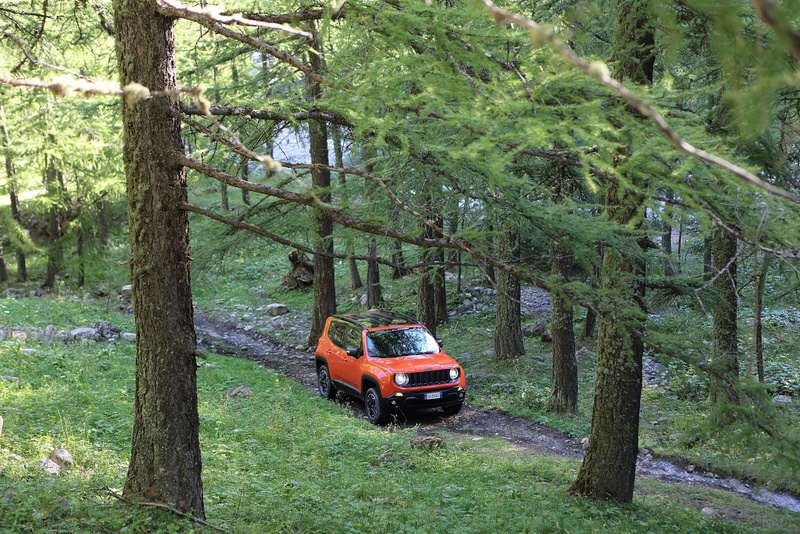 The Renegade’s DST system improves both driving safety and handling performance by actively carrying out corrections, and automatically controls oversteer over surfaces with low grip in all driving conditions. Moreover, the steering system is fully integrated with the vehicle’s electronic stability control (ESC) system to help compensate in split-traction, torque steer and pull-drift (crowned road) situations. 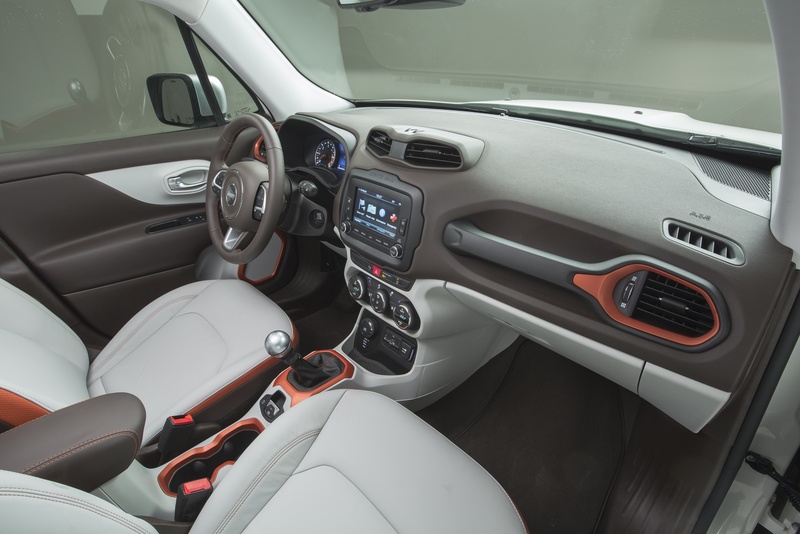 For Jeep Renegade to deliver a quiet interior cabin, engineers maximized the vehicle’s structural design and tuned the interior environment for sound quality and sound level by isolating powertrain, wind and road noise. This city-friendly sized Jeep features a noise, vibration and harshness (NVH) package that includes laminated acoustic windshield glass, body-cavity silencing foam, under-flush rolled-framed doors with triple seals and acoustic wheel-well liners to absorb road noise and quiet the cabin. 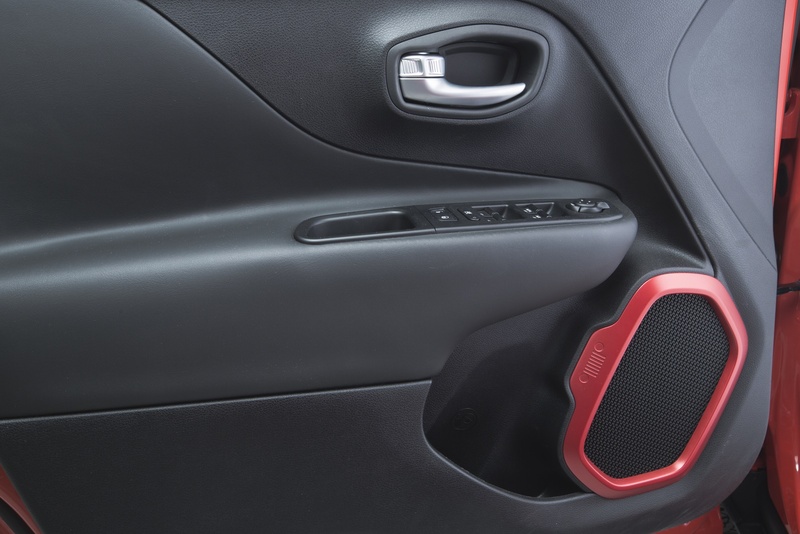 Combined, these design improvements provide the Renegade high levels of interior sound quality. 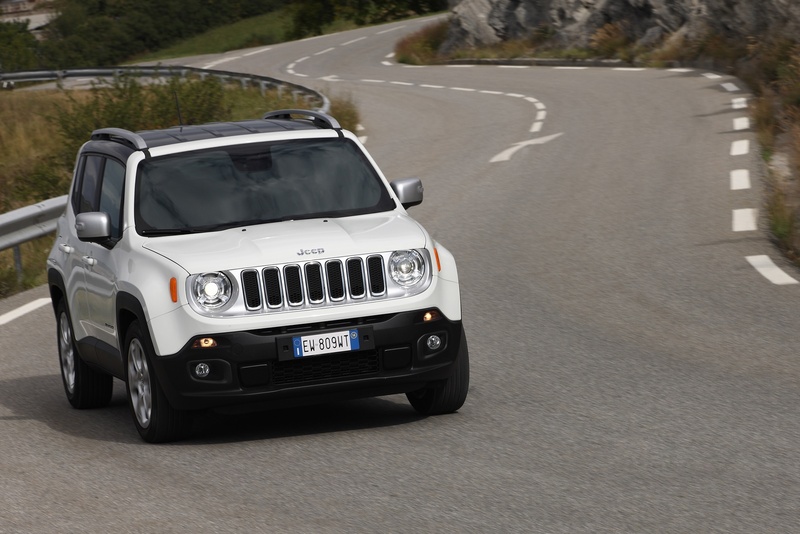 Safety and security were at the forefront in the development of the new Jeep Renegade. The new Small SUV offers more than 60 available safety and security features, including the segment’s first availability of Forward Collision Warning-Plus and LaneSense Departure Warning-Plus. 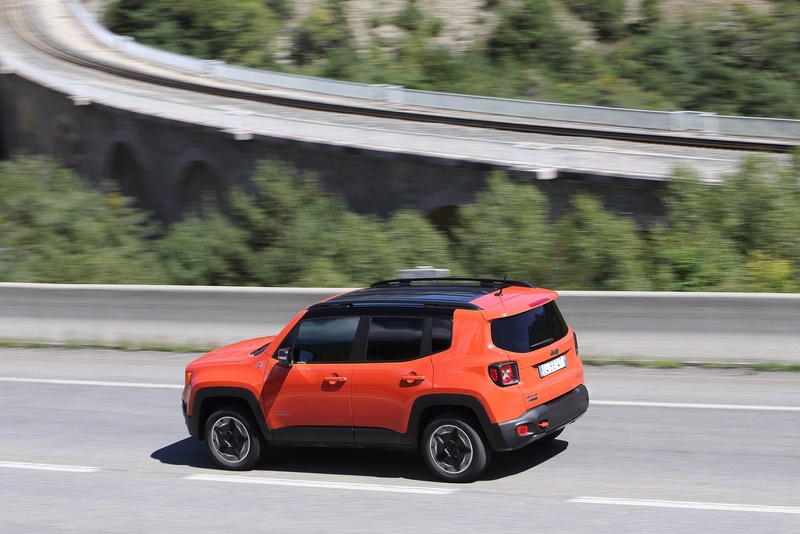 Standard safety features on the new Jeep Renegade consist of six standard airbags (advanced seats multistage air bags, all-row full-length side-curtain air bags, side bags,), ESC (Electronic Stability Control) with rollover mitigation (ERM). 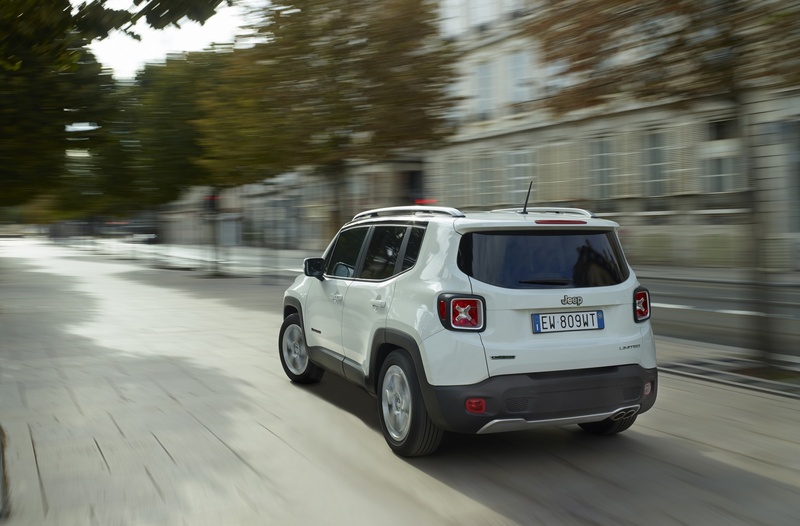 To ensure maximum protection, the complete offering of safety features available or optional on the new Renegade also includes Blind-spot Monitoring, Rear Cross Path detection, Adaptive Cruise Control and ParkView rear backup camera with dynamic grid lines. 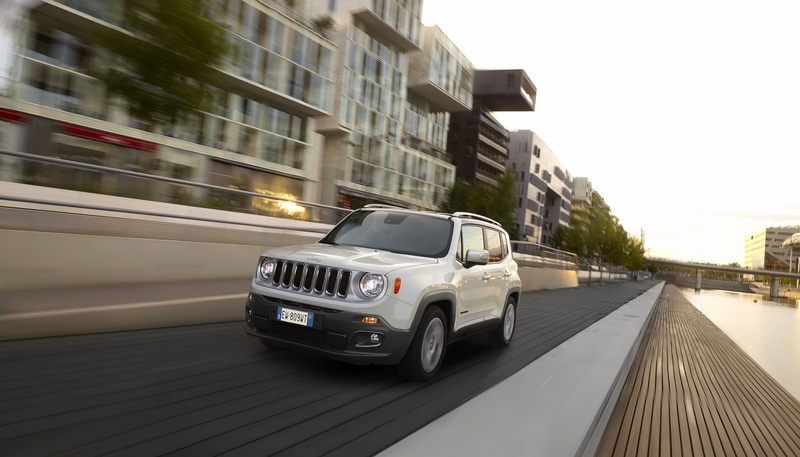 One of the most innovative systems fitted on the new Jeep Renegade is the Forward Collision Warning-Plus braking assist system – a first in the category. 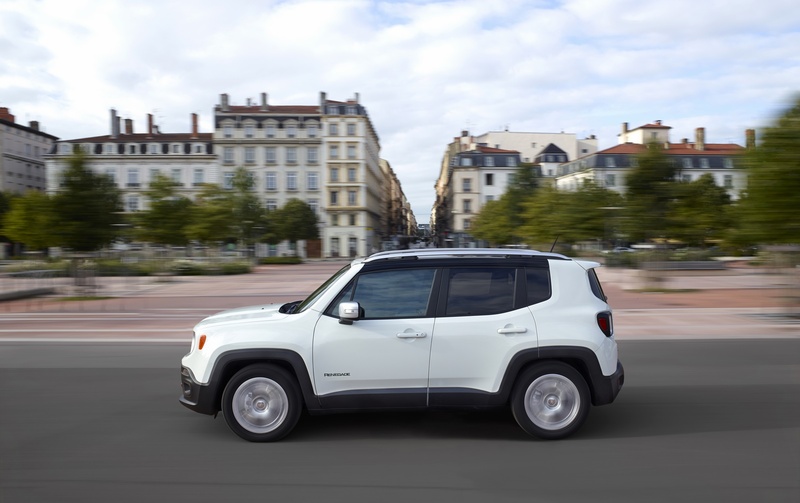 This system utilizes radar and video sensors to detect whether the Renegade is approaching another vehicle or large obstacle in its path too rapidly and warn or assist the driver in avoiding/mitigating the incident. 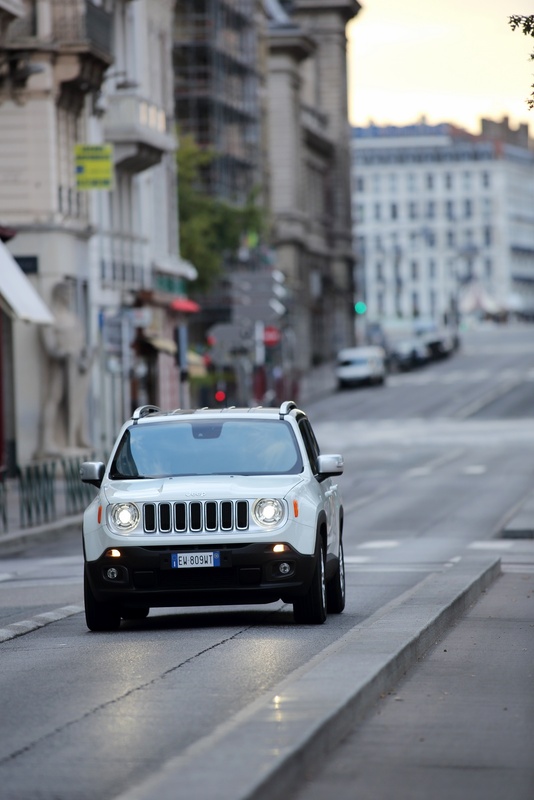 The LaneSense Departure Warning-Plus system uses a camera-based vision sensor to establish the Renegade’s position on the road. If an unintentional lane drift occurs, determined by trajectory change and the absence of turn-signal activation, the system will deliver a visual warning and a haptic warning – the subtle introduction of torque from the electric power steering (EPS) system. If the driver unintentionally drifts too far, the system provides a secondary visual warning. The Blind Spot Monitoring uses dual ultra-wideband radar sensors to aid the driver when changing lanes or if being passed by or passing unseen vehicles. 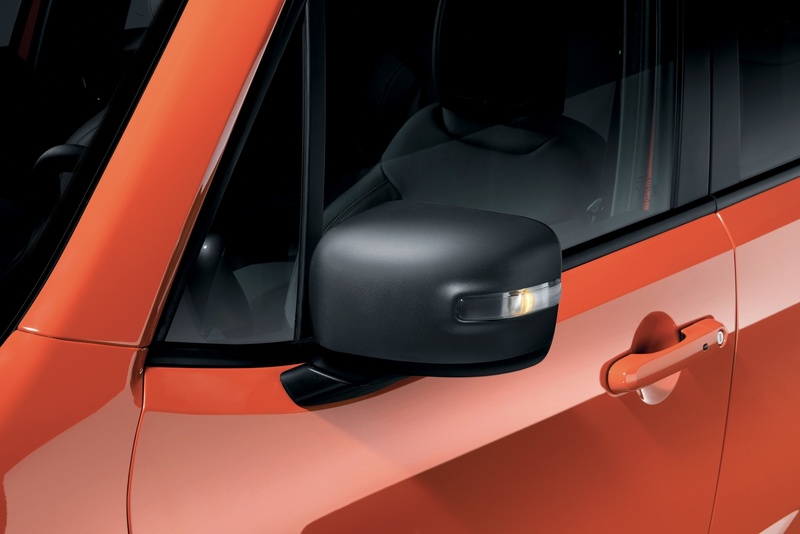 The system notifies the driver of vehicle(s) in their blind spot via illuminated icons on the side-view mirror and with a driver-selected audible chime. Adaptive Cruise Control, when activated, decreases the vehicle’s pre-set cruise-control speed when closing in on another vehicle in the same lane, or when another vehicle pulls into the same lane. ACC will accelerate to the pre-set speed when the vehicle in front speeds up or moves into another lane. The system will also maintain a driver adjustable distance between the vehicle and the one in front of it and is particularly useful when driving in adverse meteorological conditions or in situations of reduced visibility. 63. UConnect Voice Command: An in-vehicle, voice-activated communication system that allows drivers to operate a Bluetooth compatible phone with their hands on the wheel and eyes on the road. When the Bluetooth phone is initially connected, the contact list is automatically downloaded, synchronizing as many as 1,000 phone book entries, which can then be selected by simply saying a contact name. 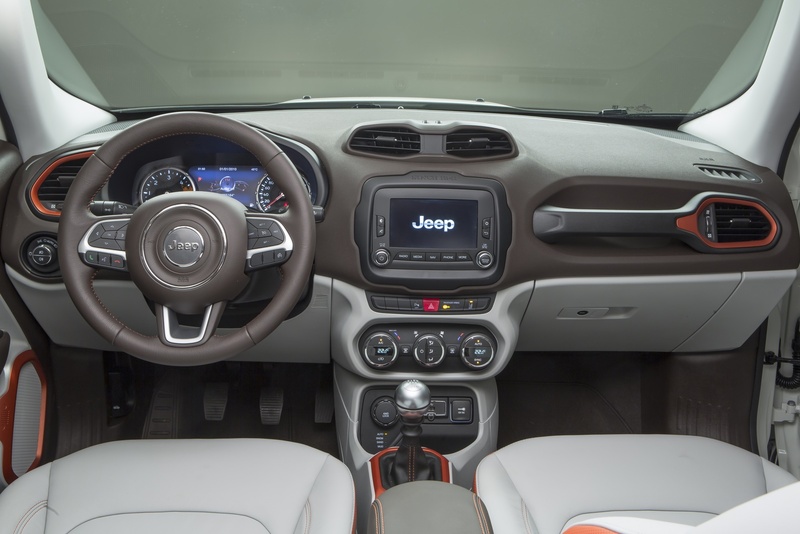 Jeep Renegade offers a range of communication, entertainment and navigation features and the segment’s largest full-color instrument cluster. Its thoughtful, state-of-the-art, high-tech features and amenities are intuitive, easy-to-use and provide on-board comfort and infotainment. 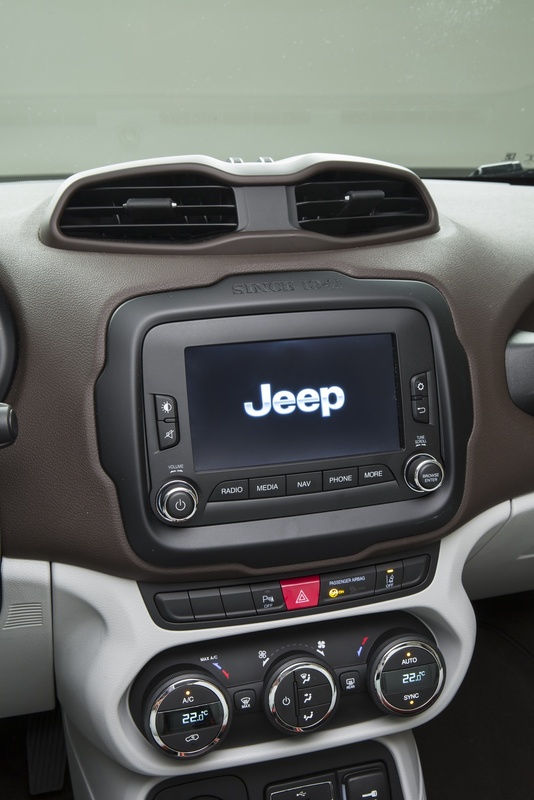 The new Jeep Renegade showcases UConnect’s in-vehicle handsfree communication, entertainment and navigation. UConnect 5.0 with 5.0″ touchscreen: The UConnect 5.0 system features a 5″ touchscreen that enables handsfree calling via Bluetooth-equipped phones, as well as voice-command control of AM/FM. Compatible smartphones, equipped with Bluetooth and MAP, can receive text messages and send from a list of 18 pre-defined messages. The system announces receipt of the message, identifies the sender and then “reads” the message aloud. In addition, digital music can be streamed wirelessly from compatible Bluetooth smartphones or audio players supported by a media hub equipped with an auxiliary jack and USB port that enables recharging and seamless operation of portable devices. 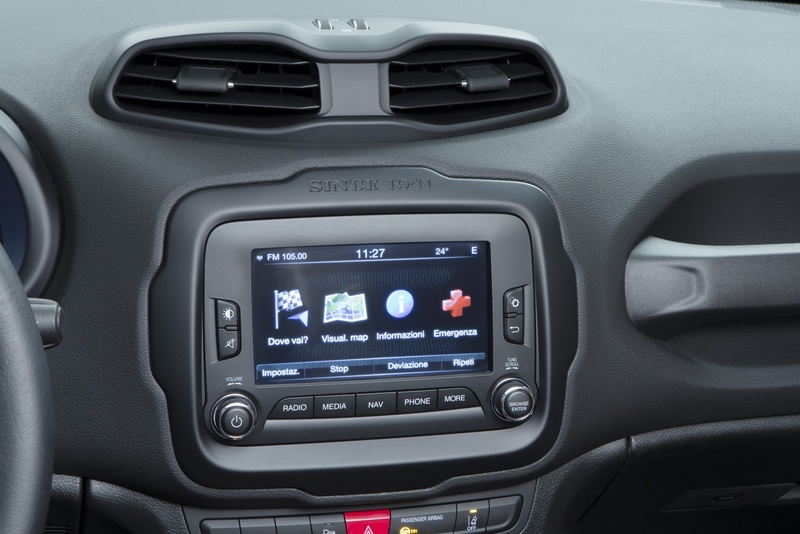 UConnect 6.5AN with 6.5″ touchscreen: UConnect 6.5AN model with a 6.5″ touchscreen display, voice operation of AM/FM, mobile phones and navigation system will be available for Limited and Trailhawk trims. UConnect 6.5AN’s well-designed maps help drivers slip through traffic, while merging and turning using sensor assisted GPS. Drivers can identify points of interest quickly and easily with stunning 3D graphics and detailed views of landmarks, cities and terrains. Audio directions and voice prompts provide turn-by-turn guidance. Sensor-assisted GPS helps ensure accurate positioning for the vehicle all while traveling through tunnels, indoor parking garages and other areas where GPS signals can become obstructed. Additional features include handsfree calling, text messaging and audio streaming via compatible Bluetooth-enabled phones, personalization settings and a premium media hub with USB and auxiliary ports. 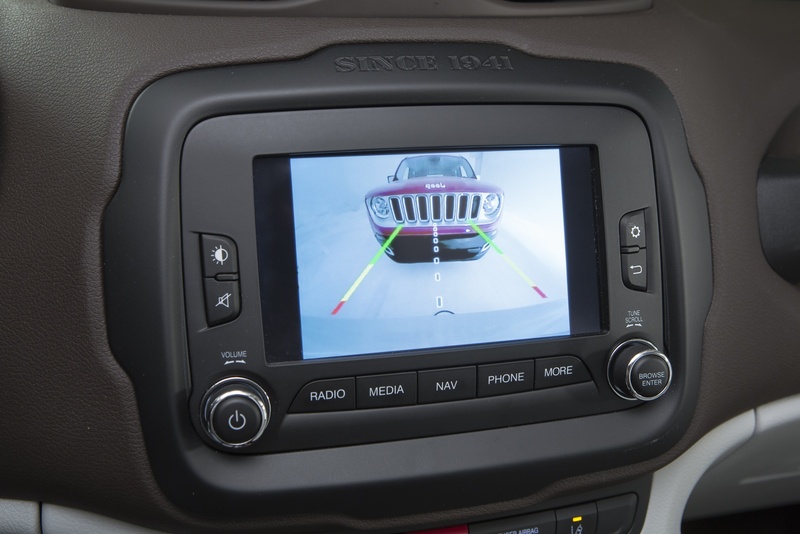 The UConnect system is available with an optional ParkView rear backup camera. 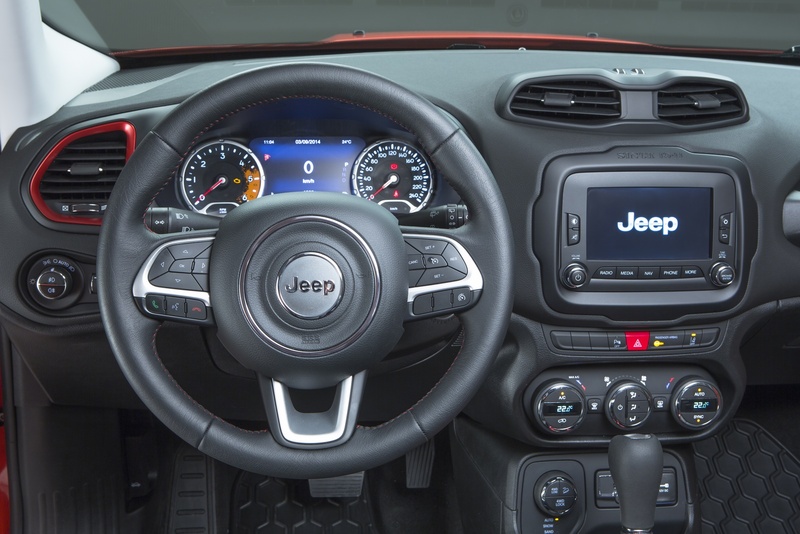 Filling the Jeep Renegade’s gauge cluster in front of the driver is an available 7″, full-color, premium multiview display, featuring a reconfigurable function that enables drivers to personalize information inside the instrument cluster. Information display is designed to visually communicate information, using graphics and text, quickly and easily. The display offers drivers a wide range of customization options, from a basic speed readout to specific vehicle status information. Operation of the display is clearly communicated to users with easy-to-understand icons and instructions. Using buttons on the steering wheel, drivers can customize the screen with as much or as little information as they desire. 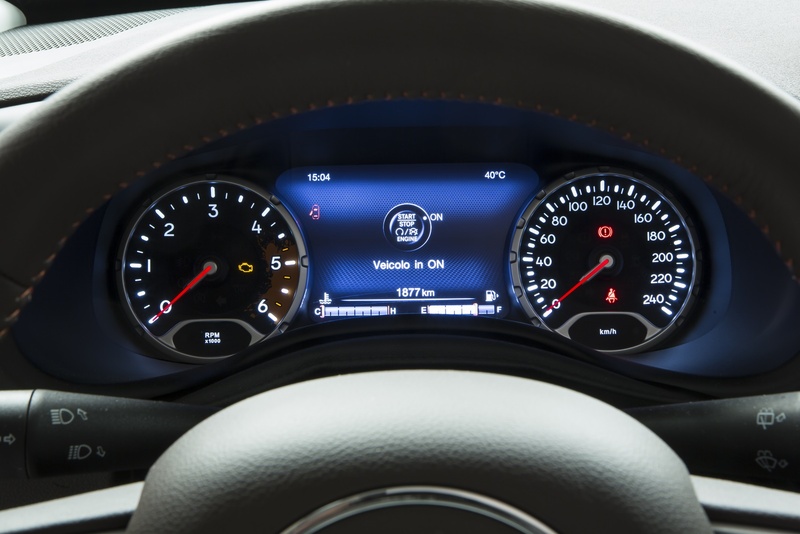 Additionally, the four corners of the display can be customized to show information at a glance, including current fuel economy, outside temperature, time and compass direction. Vehicle concerns are instantly reported to the driver via pop-up warning messages on the display. And for added convenience, text message warnings are automatically stored so a driver can review them when it is safe. 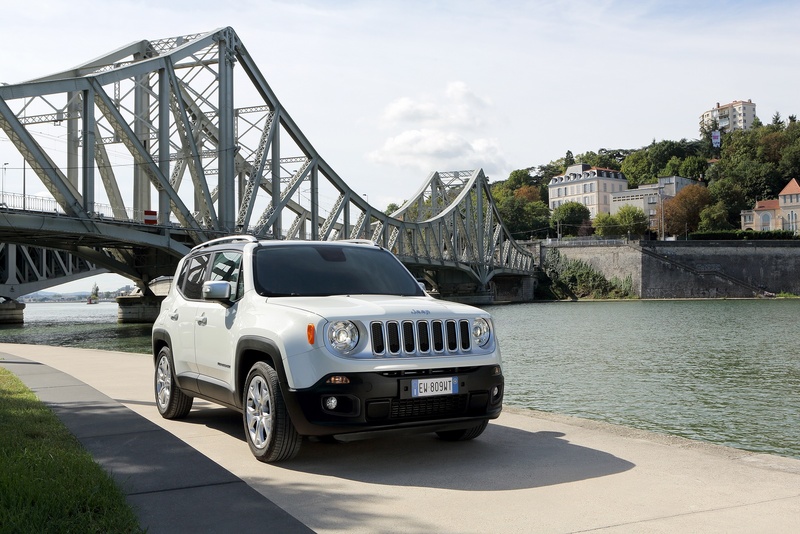 The global launch of the Jeep Renegade highlights the intense, fruitful cooperation that links the Jeep brand to Mopar®, the reference brand for the services, Customer Care, original parts and accessories for the brands of Fiat Chrysler Automobiles. A wide range of aftersales services and products has been created for the new Small Jeep SUV, to satisfy all use requirements and desires for customisation. This is the best demonstration of the comprehensive service that Mopar reserves for its customers and which today is encapsulated in the communication slogan: “Mopar. More care for your car”. The accessories business represents a global market worth 70 billion dollars: this is Mopar’s sphere of activity, offering more than 25,000 top-quality accessories in more than 130 countries. Developed in collaboration with the vehicle design team, all products are exclusive and blend in seamlessly on the various models, in line with their technical, stylistic and mechanical characteristics. 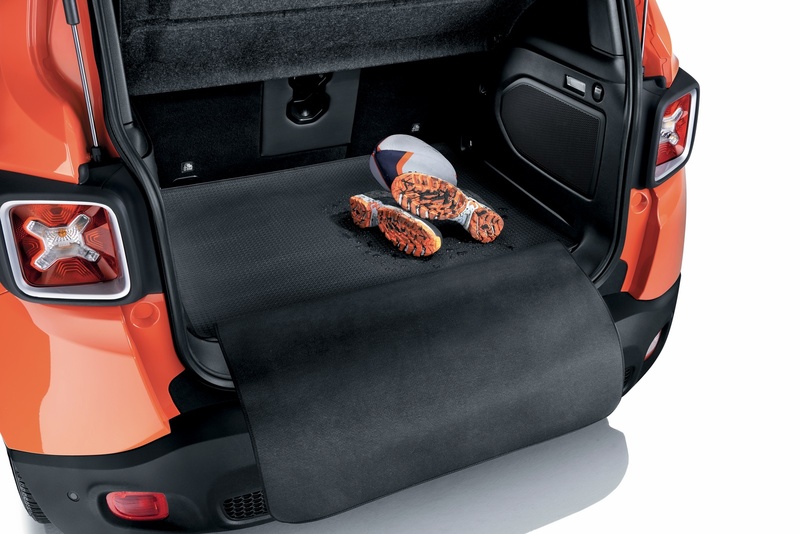 Specifically, more than 100 accessories are available for the new Jeep Renegade, permitting many distinctive levels of customisation. These include the original stickers for the bonnet, doors and side rear area (one among many, the iconic “US Army Star”, available in black or white), the mirror covers and front grilles in four different shades, in addition to the 17” alloy wheels in four colour versions and the distinctive headlights on the roof, which further emphasise the model’s off-road calling. 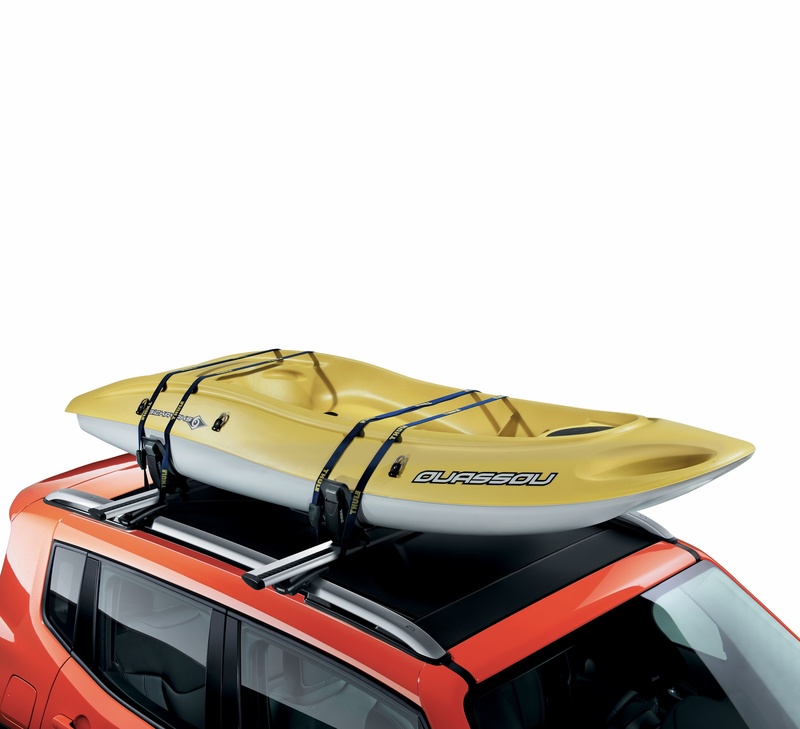 Additionally, to increase the functionality of the vehicle, a wide range of roof boxes and various systems is available – for fitting on the roof or tow hook – for transporting winter and water sports equipment (bikes, surfboards, skis, snowboards, etc.). 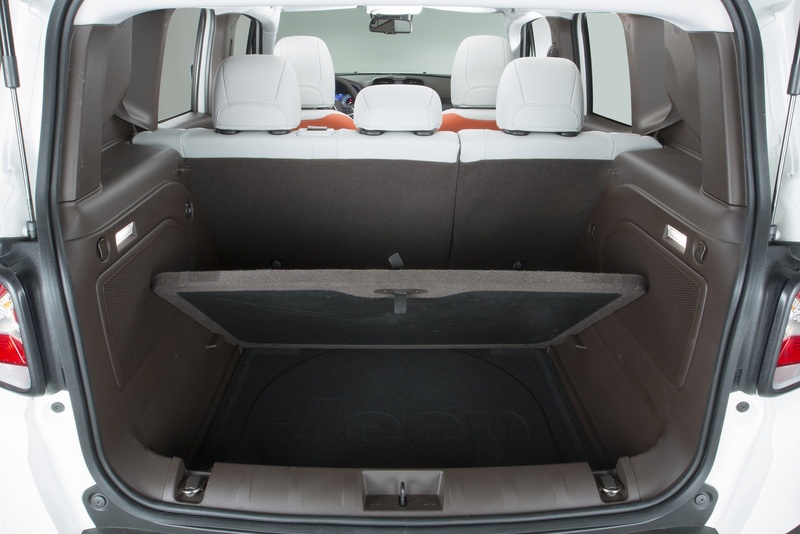 The offer is completed by various internal mats and many accessories dedicated to protecting and getting the most out of the luggage compartment (protections, nets and organizer). What’s more, further content linked to the world of electronics is available – from the parking sensors to “Mopar Wi-Fi” – developed and offered by the brand. 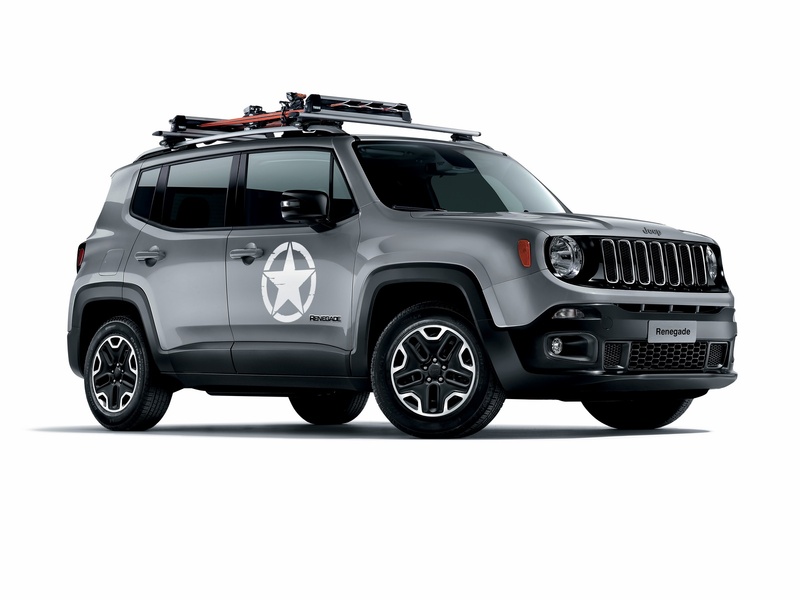 Mopar, in collaboration with the Jeep brand, has developed and produced a collection of items dedicated to those who drive and who love travelling on board the new Renegade. They are all articles of extremely high quality intended to express and promote a lifestyle that allows customers to live out a unique brand experience, in tune with the authentic values of the Jeep brand in terms of design, functionality and materials used. “Mopar Vehicle Protection” (MVP) offers the only service contracts guaranteed by Fiat Chrysler Automobiles, which ensure the utmost peace of mind for customers, thanks to very extensive coverage for mechanical components and dedicated servicing plans, in addition to an assistance and repair service provided by highly specialised technicians who use original parts exclusively. 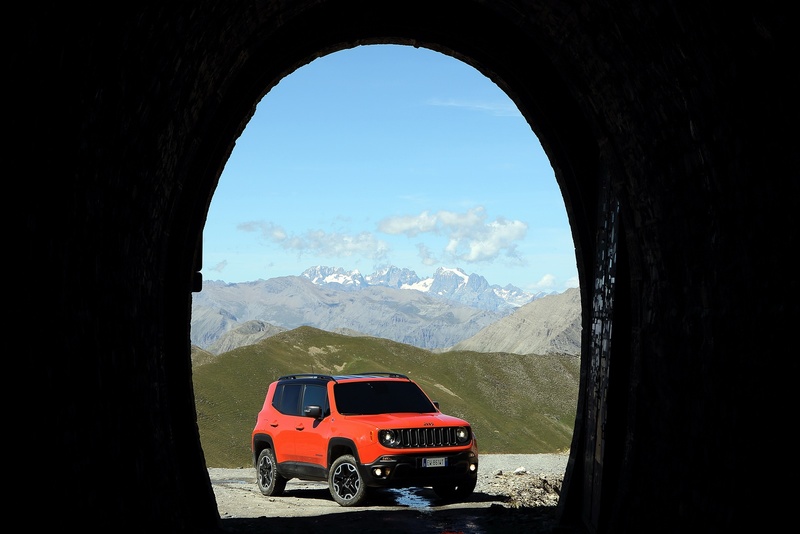 Currently available in more than 30 countries in the EMEA region and with a portfolio of more than 50 products, the “Mopar Vehicle Protection” programme has developed a specific offer – called “Freedom Pack” – to meet the requirements of new Jeep Renegade customers. In detail, the proposed solution puts the stress firmly on coverage for mechanical and electrical damage – extending the manufacturer’s warranty from three to five years and with the mileage most appropriate to the customer’s needs and use of the vehicle – and offers various competitively priced servicing and assistance plans to guarantee a vehicle which is always in perfect condition. 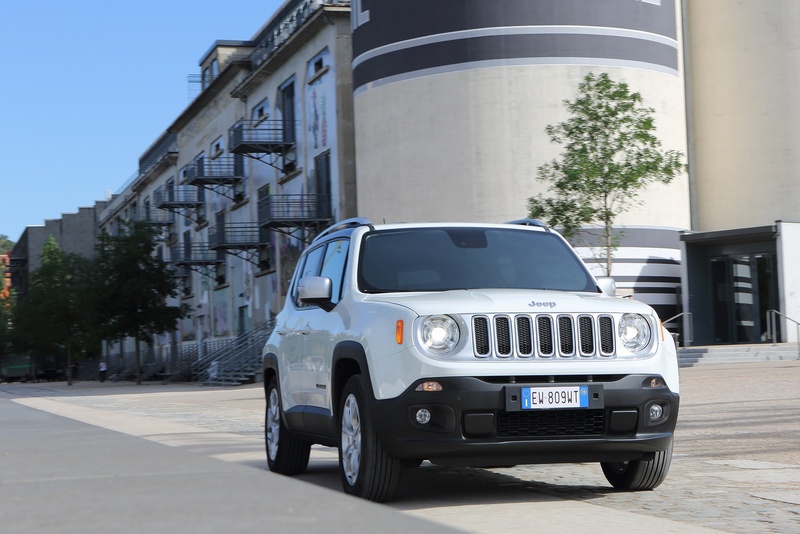 Ever attentive to the new frontiers that digital technologies have to offer and for the launch of the new Jeep Renegade, the Mopar brand presents some new features for the ‘Mopar Owner Centre’ web platform, the “I am Jeep Mobile” application and the latest generation of digital supports for the service network. 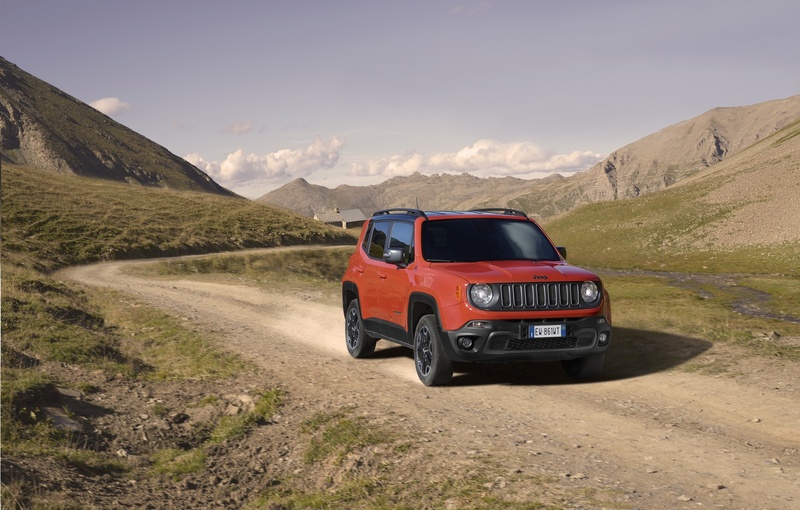 Jeep Renegade customers can enjoy all the potential of the Mopar Owner Centre, the new integrated aftersales platform that offers a complete range of content and information for Fiat Chrysler Automobiles models. The innovative digital tool therefore represents a valuable communication channel between Mopar and its customers, and it offers two navigation levels: one that is “public” and another that is “private” with a personal login. On the first level, all users can find information on original parts and on how to personalise Fiat Chrysler Automobiles vehicles, directly access all Customer Care channels, learn about warranty and servicing plans, read about the roadside assistance services, select direct links to virtual stores and access the complete list of authorised dealers and service centres. In a nutshell, it’s a genuine showcase where the Group’s know-how is openly shared in an attractive way, also owing to its simple and intuitive graphics. The second is the new personal area of Jeep, where all customers can find personalised advice, dedicated tools and exclusive promotions. After registering and entering their VIN (Vehicle Identification Number), customers find a wealth of useful services for managing their vehicles, such as servicing plans based on the number of km travelled, the vehicle’s equipment, and management of an online diary. Starting from the homepage of the official Jeep site, the user can reach the “Mopar Owner Centre” under the header “Services and Assistance” and/or directly by pressing the “my Jeep” button. Mopar provides Jeep customers – as for all FCA brands – with dedicated Customer Service with information on models and services, on the sales and service network, solutions to reported issues and roadside assistance, active 24 hours a day, 7 days a week, which can be accessed from major European countries through the Universal Freephone number 00 800 0 426 5337 or the “Contact us” form on the Jeep site. Drawing on the increasingly widespread use of digital technology and social channels, in recent years the traditional customer service has been renewed, with the “I am Jeep Mobile” application, the official Jeep fanpage on Facebook and the @JeepCareIT contact for Twitter. 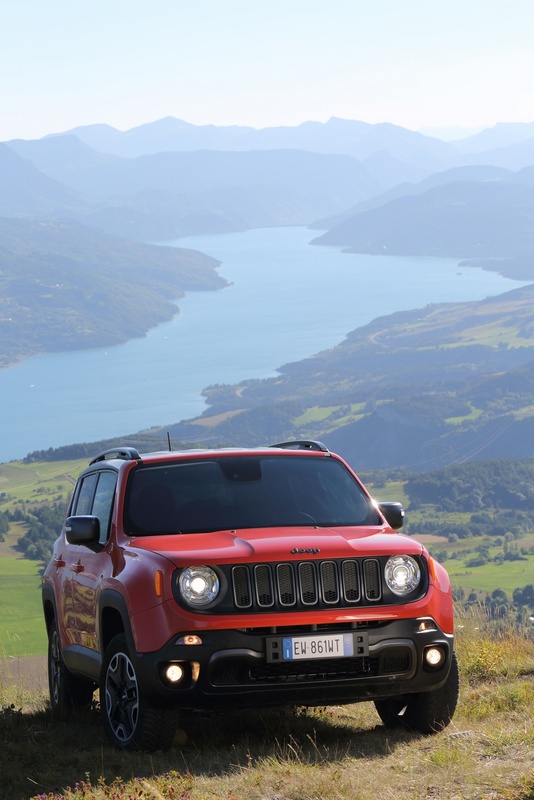 In detail, the “I am Jeep Mobile” app offers services and assistance in 12 European countries and five languages (Italian, French, German, Spanish and English). Available for download free from Apple Store and Google Play, at the end of July 2014 it had been downloaded more than 25,000 times and 20% of Jeep customers are already using it. Among the more advanced characteristics of the app is the possibility of viewing multimedia content in product catalogues and posters in Augmented Reality. 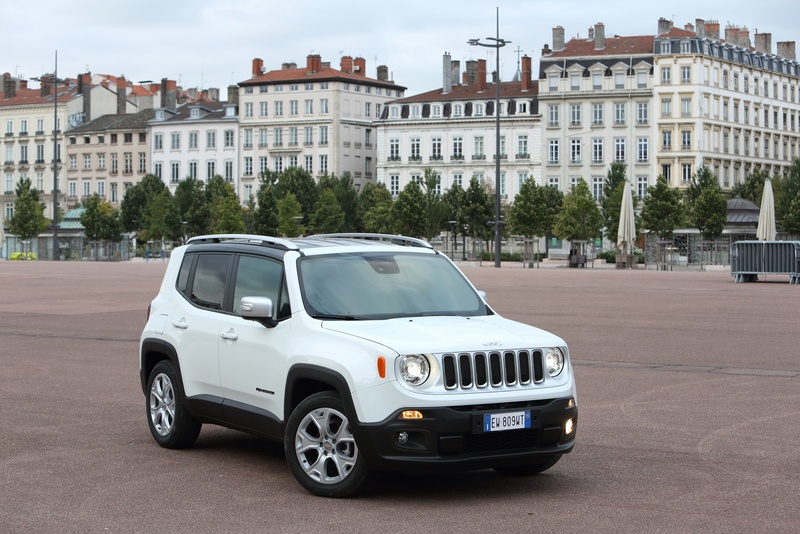 Moreover, it will also be possible to use the same sophisticated technology to consult the Jeep Renegade Owner Handbook within the first months of 2015. Finally, by sending a public tweet or private message to @JeepCareIT, Jeep customers can receive support for their needs thanks to a team of dedicated operators (service currently available in Italy and subsequently in France and Germany) while Italian users can access Jeep Customer Care directly through the dedicated section on the official Jeep fanpage on Facebook. With the launch of the new Jeep Renegade, the activities of Technical Service too – provided by Mopar through the Service Network of Dealerships and Authorised Workshops and Body Shops – have been updated to offer a premium service that always keeps pace with technological innovation. 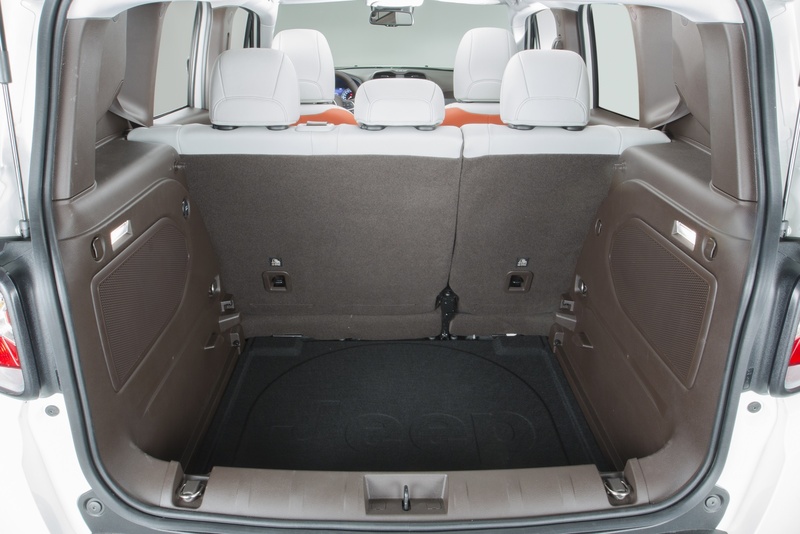 For instance, the sales launch of the Small Jeep SUV sees the début of the microPOD at servicing centres. This is a new electronic diagnosis tool, totally wireless, which will subsequently be extended to the other Jeep models. There’s also wiADVISOR – computerised reception based on use of a tablet – which represents the new frontier of the workshop 2.0 according to Mopar. A genuine revolution for the whole Authorised Network, which allows receptionists to work with a cutting-edge tool for inspecting the vehicle, checking its state of health quickly, efficiently and transparently. By using wiADVISOR technology combined with a tablet, the technician can graphically show the customer any anomalies and where they will intervene. In this way they improve quality and speed of service. With this new approach, the customer is at the centre of the entire reception phase. They can ask questions and clarifications at any time in the interest of transparency, precision, clarity and uniformity of treatment. Widely used by the Italian service network, the project is expanding rapidly throughout the EMEA region. Finally, to complete the service package and support dealers and workshops through its own training division, Mopar Technical Service organises targeted courses for all roles in the network, assessing and certifying the various skills. 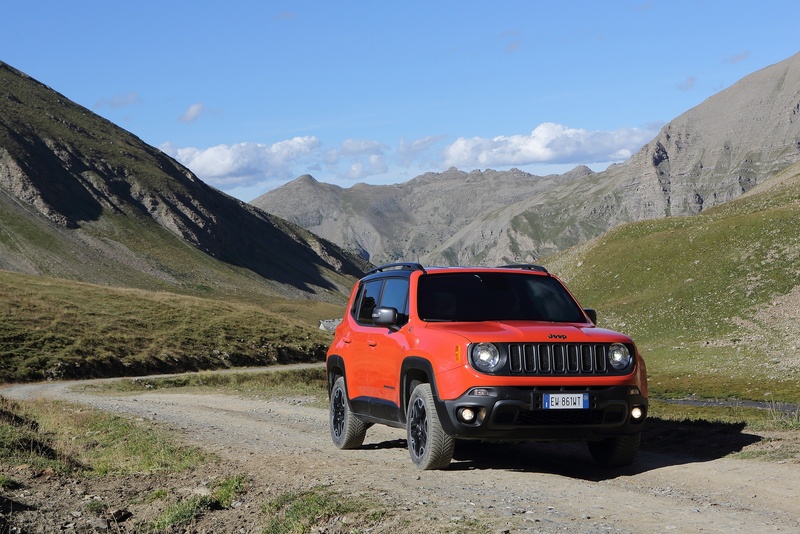 A wide-ranging and varied task, and – for the launch of the new Jeep Renegade – it too has been updated in terms of processes and procedures to make training another pièce de résistance of the Mopar brand. To support the market launch of the Jeep Renegade, FGA Capital has extensively redefined its range of financial solutions to cater for the new model’s target market and to meet the specific needs of each customer type: from freelancers to new couples to the young. Thanks to the flexibility of their content, the three solutions described below can be adapted to the various European markets on which FGA Capital operates directly. 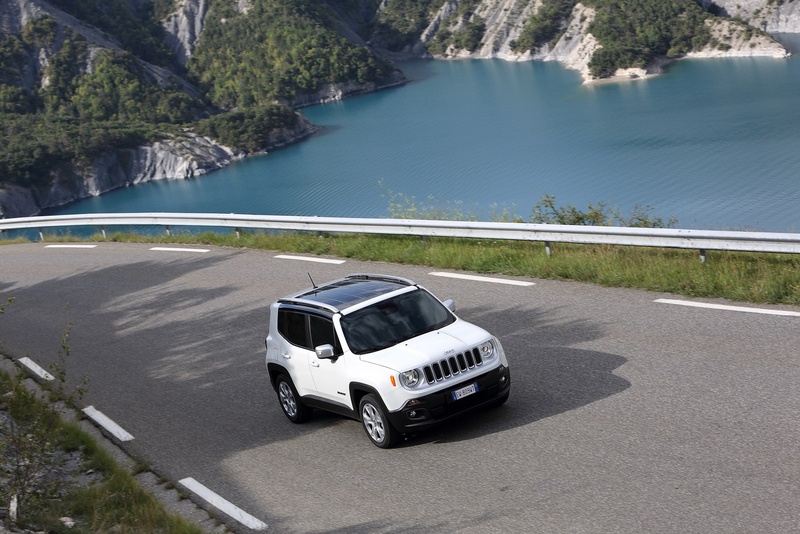 Starting with the “JEEP VALUE” formula, a leasing or renting package with a range of additional services which allows the customer to drive away a new vehicle in total freedom and enjoy insurance content with high added value, such as Extended Warranty, Servicing and Auto Insurance, all available for the entire duration of the contract. This is the ideal formula for entrepreneurs and freelancers who prefer not to part with their cash, instead opting for a monthly payment linked to the use of the vehicle. At the end of the contract, the customer can choose to renew the leasing agreement with a new vehicle, return the vehicle with nothing to pay, or purchase it. The second solution is “JEEP FREE”, an innovative, convenient financing option for those who prefer to pay in cash with the tried-and-tested no-interest scheme. 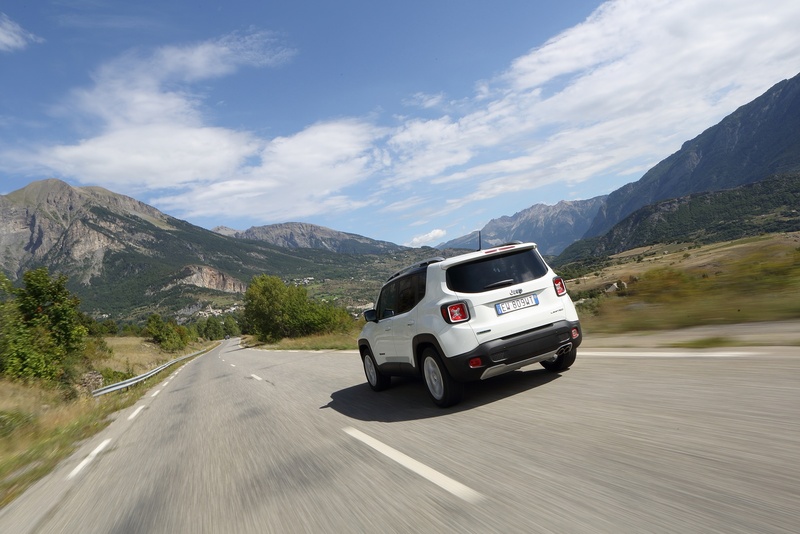 The buyer pays just half of the promotional price upon purchase and, with no intervening payments, after two years can opt to return the vehicle and choose a new Renegade at half price. 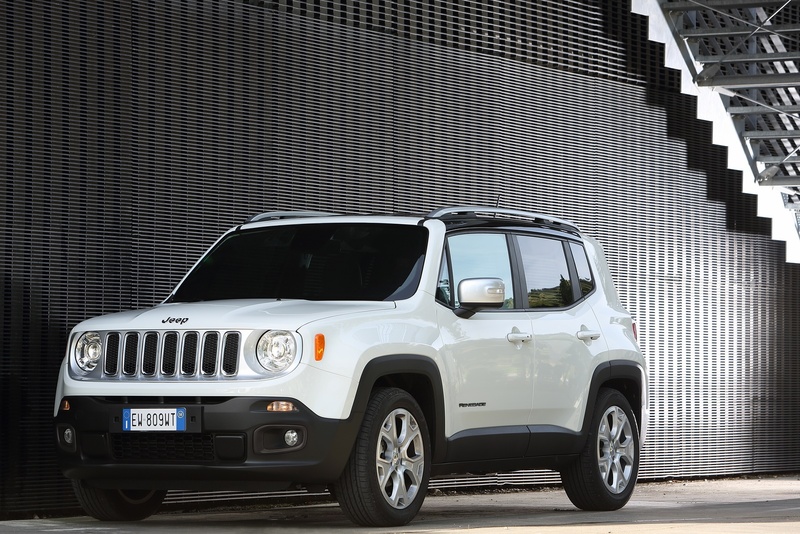 With Jeep Free, customers can enjoy “two new vehicles in four years”. 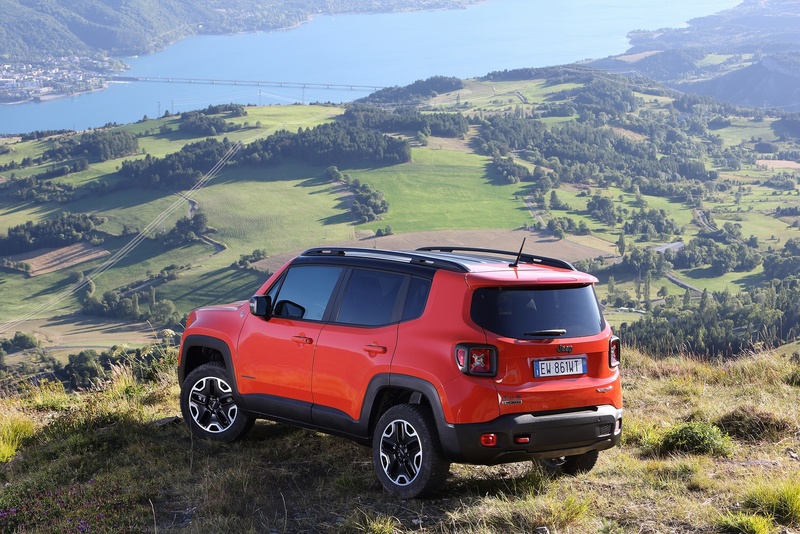 Finally there’s “JEEP EASY”, the finance package for the young to make purchasing a Jeep Renegade easier, with an instalment-based finance structure which offers low payments thanks to the long contract term and the beneficial rate. In addition to the insurance services mentioned above, the customer can also add additional safety and security features to all finance packages, from personal protection solutions such as Prestito Protetto protected loan which covers the payment of part of your finance in the case of unforeseen circumstances such as losing your job – or vehicle protection services such as Kasko (fully comprehensive insurance), Collision, GAP and Window Marking. 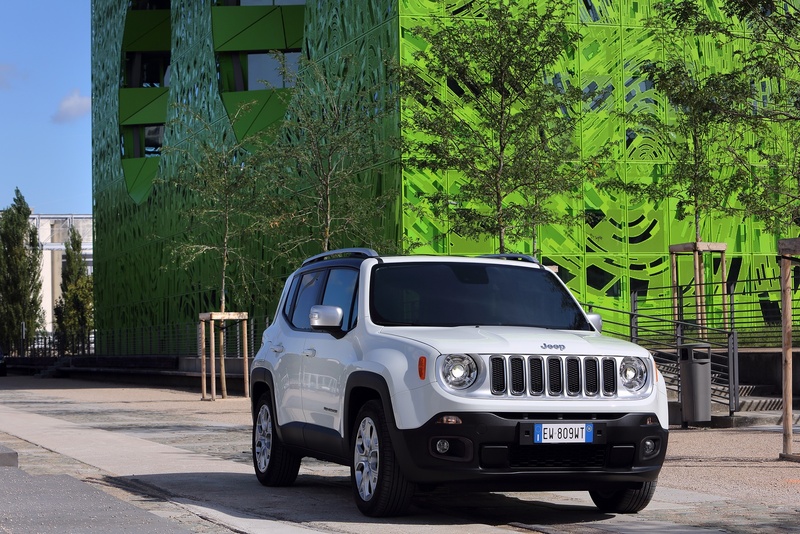 The renewed SATA (Società Automobilistica Tecnologie Avanzate) plant of Melfi is the proud “home” of the new Jeep Renegade. The nearly 1.9-million-square-metre assembly plant, was built in 1991 and the first vehicle rolled out of the assembly line in October 1993. Over the last 20 years the plant has hosted the production of several model of the Fiat and Lancia brands including the Fiat Punto (1994), Lancia Ypsilon (1995), new Ypsilon (2003), Grande Punto (2005) and Punto Evo (2009) reaching a total of 5,645,275 cars produced until 2013. 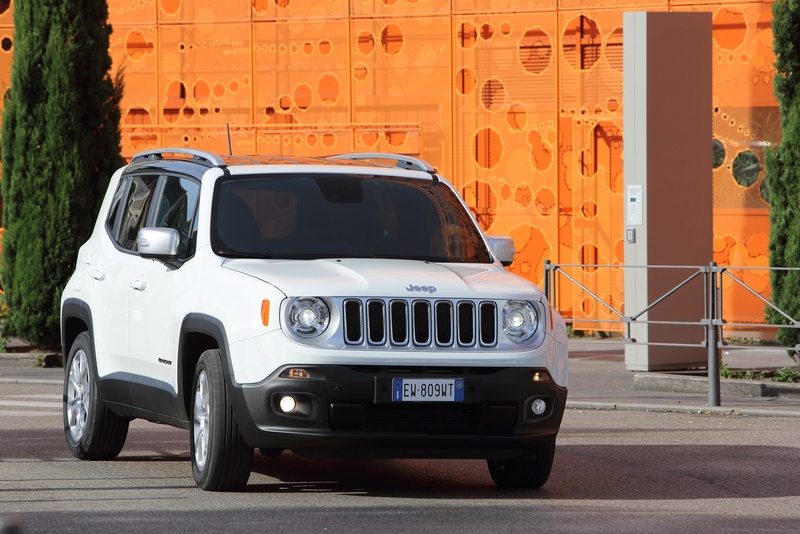 In preparation for the production of the all-new Jeep Renegade and to ensure that the new model – the first Jeep ever produced in Italy and outside the United States- launched with the best possible quality, the SATA plant implemented and aligned all of the best practices and technologies from the Fiat Chrysler Automobiles group. Today the complex consists of a Press, Body, Paint and Assembly shop and employees a total of 5,941 workers. 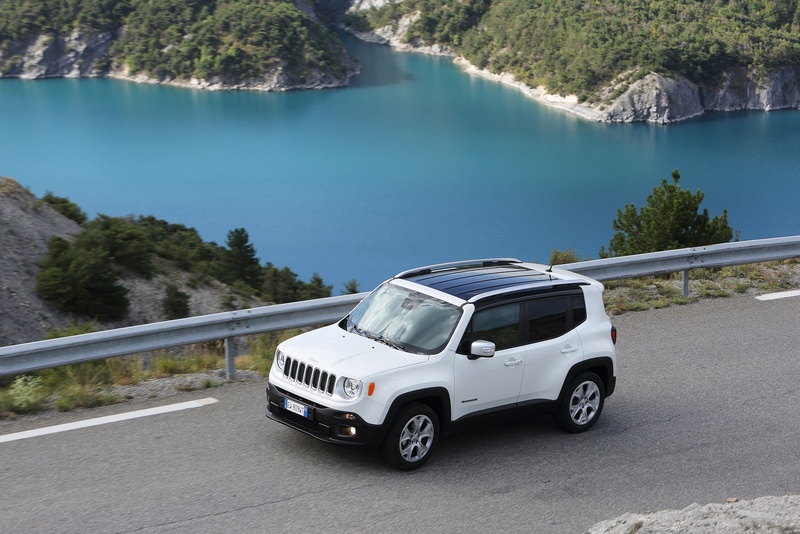 Production of the new Jeep Renegade in Melfi began in July 2014. 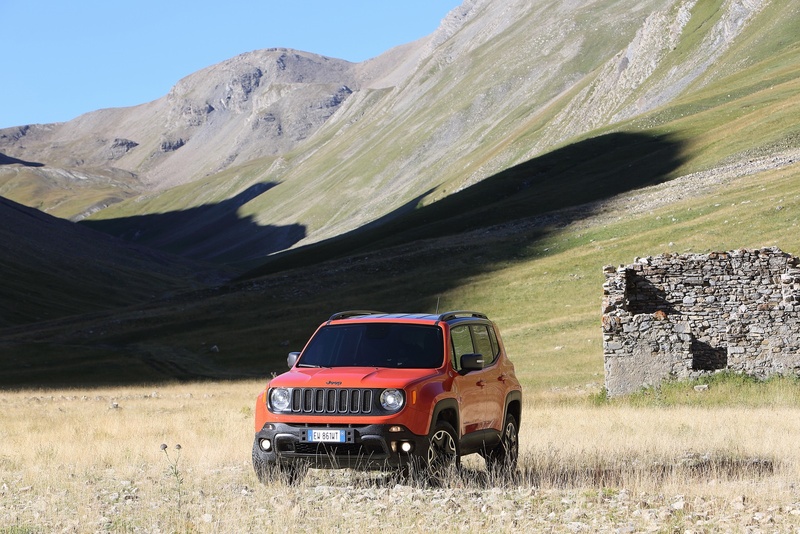 The all-new Jeep Renegade is available in Europe in four different trim levels: the Sport, Longitude, Limited and Trailhawk, each featuring specific equipment and customization in order to meet all customers’ needs. 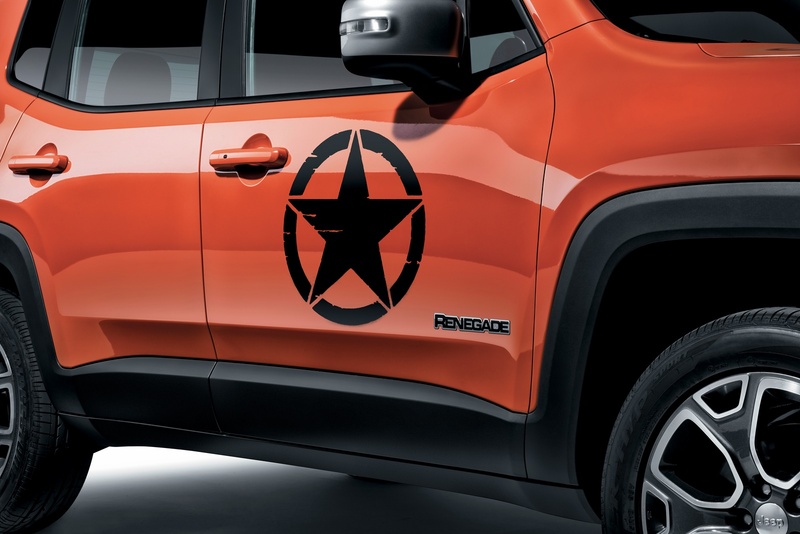 The exclusive ‘Opening Edition’ limited-edition model will join the Renegade lineup in the launch phase and will be made available only to the first customers that will purchase the new model. The Sport trim level is the entry model in the range, the Longitude is the one offering high levels of functionality and comfort, and the Limited is the top-of-the-range trim level in terms of both technological contents and personalization and featuring standard equipment normally found on higher segment vehicles..
For customers who demand the most off-road capability from their Jeep vehicles, the Trailhawk version delivers best-in-class Trail Rated 4×4 capability with unique standard equipment. Standard Jeep Active Drive Low, Selec-Terrain system with exclusive Rock mode (that automatically activates the locking of the rear differential and splits the torque between the two axles), increased ride height of 20 mm to reach 210 mm, skid plates, red front and rear tow hooks (available in selected markets), unique fascias that deliver 30 degree approach, 23.5 degree breakover and 34 degree departure angles are all specific for the Trailhawk model. 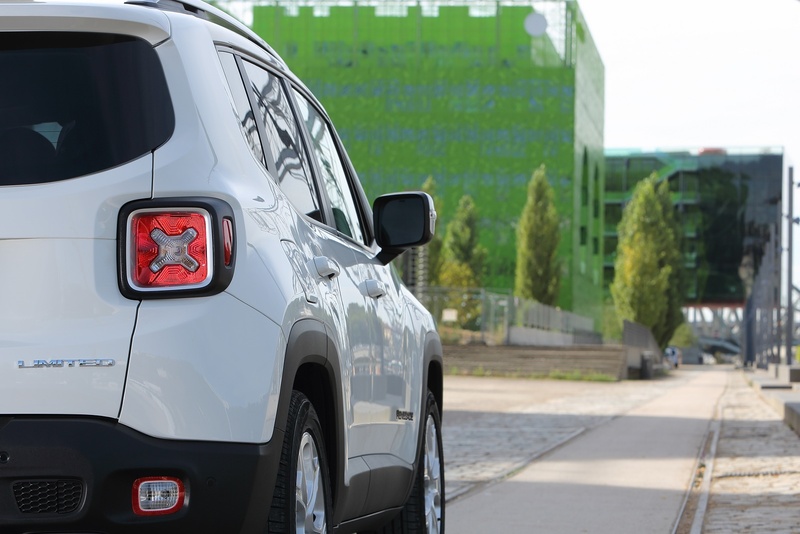 A total of seven wheel designs are available on the new Jeep Renegade. 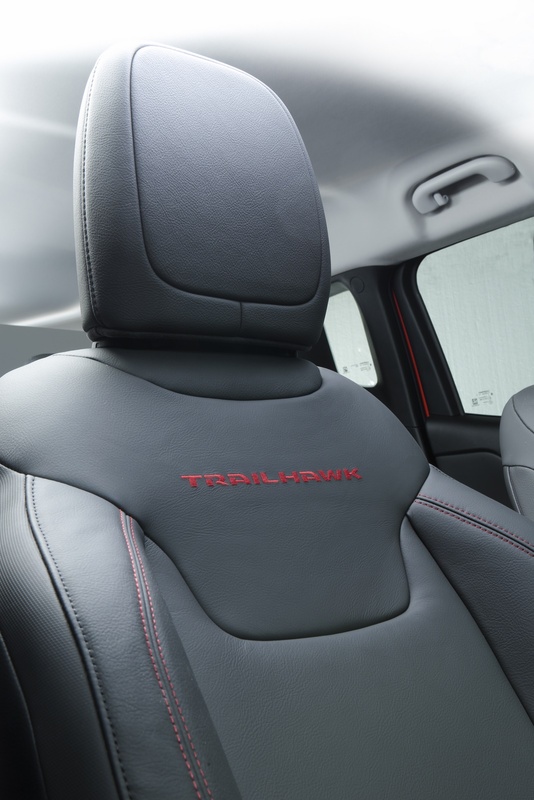 The new model rides on 16″ (Sport and Longitude), 17″ (Trailhawk and Limited) or 18″ tires (Opening Edition and optional on Limited) providing drivers with confident traction in all road conditions. The configuration may change according to markets needs. Exterior paints include 11 different colors options, including many named after Jeep brand’s legendary heritage. In addition to Black accented roof, available exterior body colors include: Colorado Red, Omaha Orange, Solar Yellow, Mojave Sand, Commando, Sierra Blue, Carbon Black Metallic, Glacier Metallic, Black, Alpine White and Anvil. 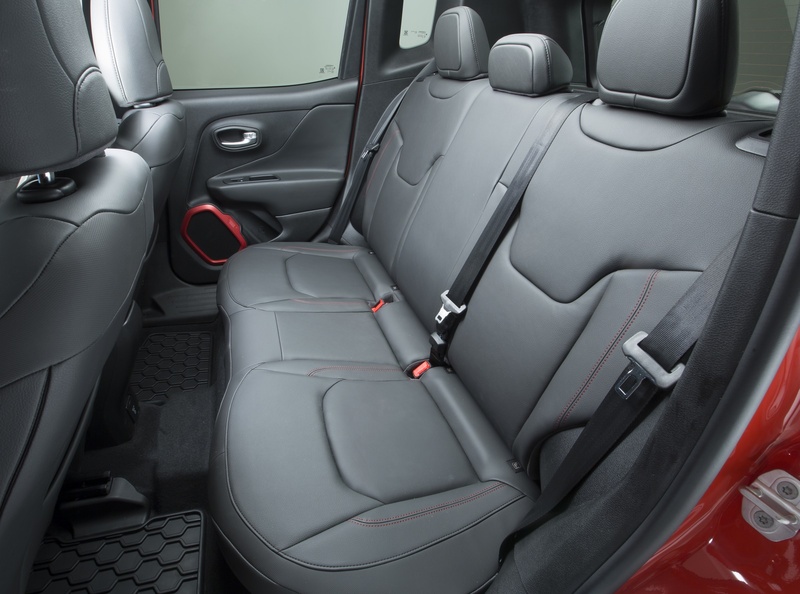 The interior of the new Jeep Renegade is offered in seven trim choices and each of them is specific to a trim level in the range. They include: Black with Metal Diamond bezel accents (Sport), Black with Metal Diamond bezel accents (Longitude), two-tone Black/Sandstorm interiors with Metal Diamond bezel accents (Longitude), two-tone Bark Brown/Ski Grey interiors with contrasting Anodized Orange bezel accents and stitching (Longitude), monotone Black fabric with Ruby Red bezel accents and stitching (Trailhawk), Black leather (optional) with Ruby Red bezel accents and stitching (Trailhawk), Premium Black fabric with Metal Diamond bezel accents (Limited), Black leather (Optional) with Metal Diamond bezel accents and Beige stitching (Limited) and a two-tone Bark Brown / Ski Grey Leather (optional) interiors with Anodized Orange bezel accents and stitching (Limited). 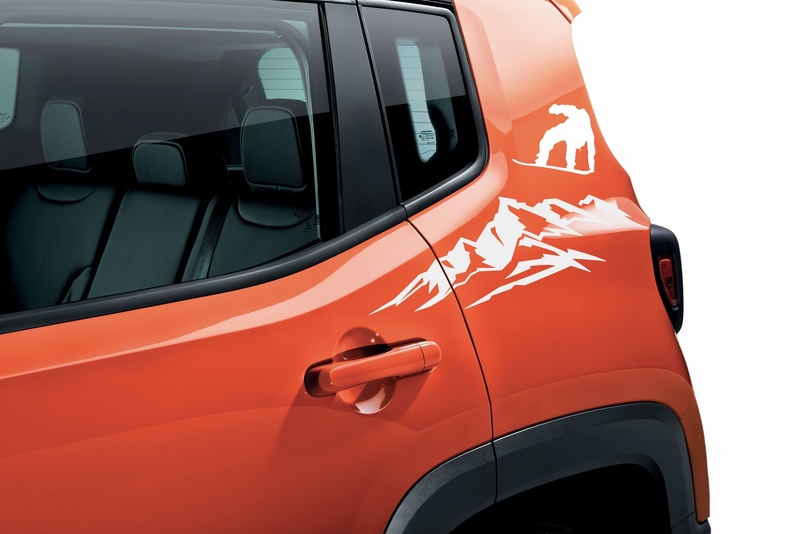 The exclusive “Opening Edition” will join the four trim levels of the Renegade range during the launch phase. This limited-edition model will be made available exclusively to the first customers who will order the car. 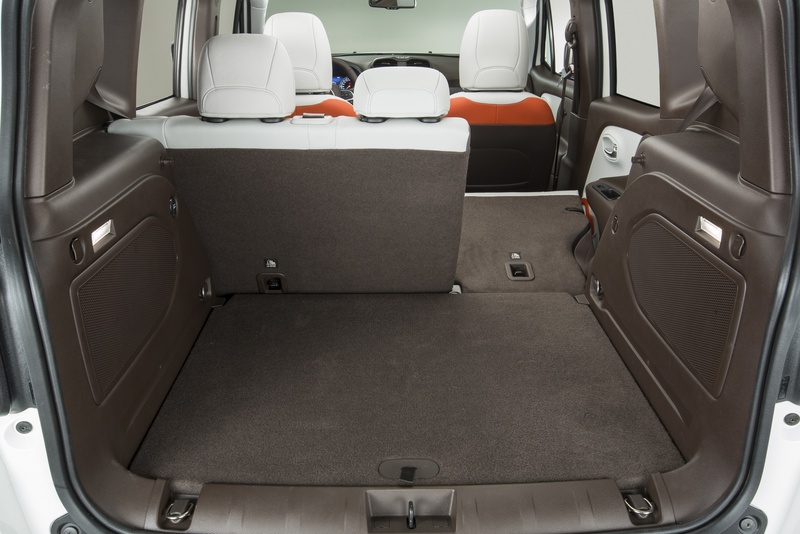 Based on the top-of-the-range Limited model, the “Opening Edition” will be available as a 4×2 or 4×4 model. It will be offered exclusively in the two-tone combinations: Alpine White with black painted roof or Omaha Orange with black painted roof. Exclusive diamond treated 18″ wheels and the dedicated badge will complete the unique look of the ‘Opening Edition’ model. 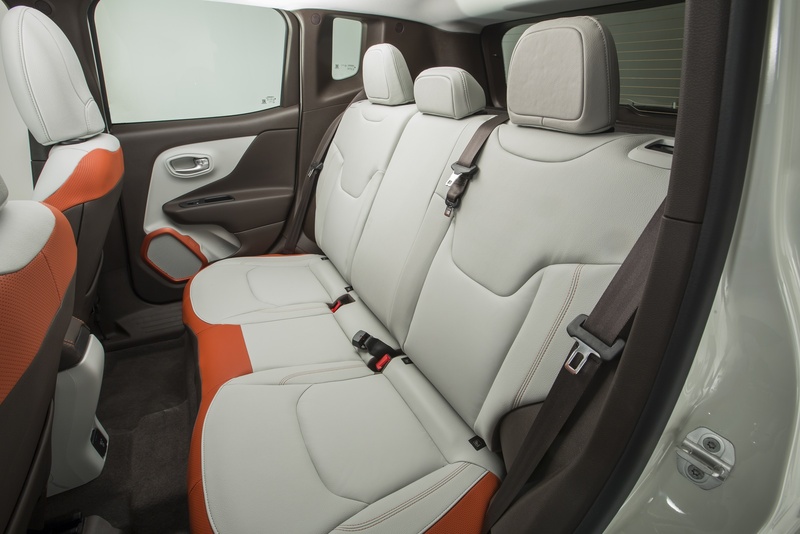 The interior features Black leather seats with contrasting orange stitching that will further enhance a cabin already full of comfort and advanced technological contents. In terms of infotainment, comfort and safety, the Opening Edition features standard UConnect navigation system and 6.5″ touchscreen, dual-zone automatic climate control, Passive entry with Keyless-Go, rear parking sensors, Cruise control, fog lights and electrically foldable rearview mirrors. The engine offer available on the Opening Edition includes the 120 horsepower 1.6-liter MultiJet II diesel engine with six-speed manual gearbox combined with the front-wheel drive configuration, the 140 horsepower 2.0-liter MultiJet II with six-speed manual gearbox and four-wheel drive and the 140 horsepower 1.4-liter MultiAir2 petrol engine with six-speed manual gearbox and front-wheel drive. The Renegade Sport model is powered by the new the 140 horsepower 1.4-liter MultiAir2 petrol engine with DDCT and front-wheel drive configuration, the 110 horsepower 1.6-liter E-TorQ with 5-speed manual and front-wheel drive configuration, the 120 horsepower 1.6-liter MultiJet II with six-speed manual and front-wheel drive and the 185 horsepower 2.4-liter Tigershark with 9-speed automatic transmission and front-wheel drive. Standard equipment of the Sport trim level includes: 16″ wheels black painted finish, body color upper fascia, chrome grill slot inserts and halogen reflector headlamps, matte black finished grille surround bezel, daytime running lamps, body color steel roof, entry remote control, satin chrome plated knob (on manual gearbox only), ABS, ESC, Traction Control, Hill Start Assist, six airbags, electric power steering, electric park brake, tire pressure monitoring system, UConnect 5.0 radio with four-speaker audio system, touchscreen and Bluetooth, AUX Jack (auxiliary jack) and USB, 3.5″ Electronic Vehicle Information Center, Audio / EVIC steering wheel controls, power windows with express up/down, manual air conditioner and side repeaters on outside rearview mirrors. Optional equipment on the Sport model includes: 16″ wheels, Diamond-cut with Crystal Granite painted finish. The Renegade Longitude model is available with all engine versions except for the 140 and 170 horsepower 2.0-liter MultiJet II with 9-speed automatic transmission and all-wheel drive and the 170 horsepower 1.4-liter MultiAir2 Turbo engine with nine-speed automatic transmission and 4×4 configuration. 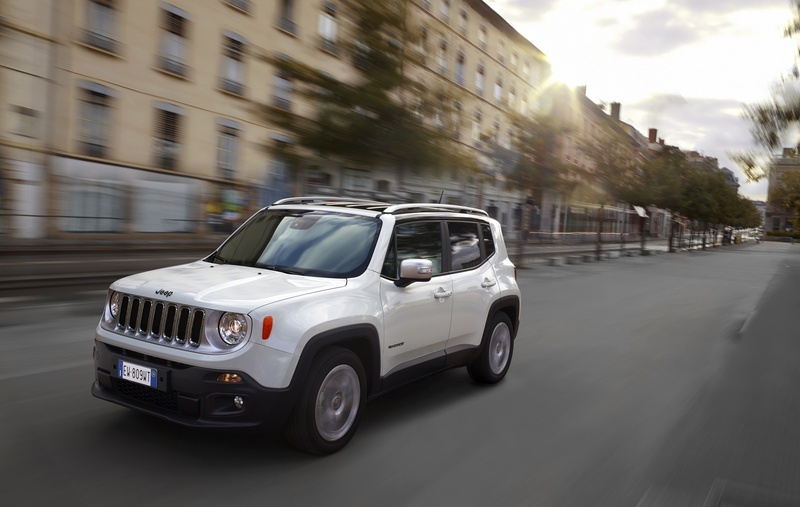 The Jeep Renegade Longitude features a full line of standard and available features. The Longitude includes as standard equipment 16″ aluminum wheels, diamond-cut with Crystal Granite painted finish, Cruise control, 3.5″ monochromatic instrument panel, Speed limiter, six speakers, body color power/heated outside rearview mirrors, body color door handles, front halogen fog lamps with Neutral Grey Satin gloss painted accent bezel, roof rack rail, black stanchions with gloss black painted rail finish, front fog lamps, adjustable driver seat, leather wrapped steering wheel, ambient LED lighting, illuminated sun visors and Uconnect 5.0 touchscreen radio with 5.0″ color display and Uconnect Voice Command Bluetooth® capability. Optional equipment on the Longitude model includes: 17″ aluminum wheels with Silver tech painted finish, sunroof with electrical drive, heated front seats and steering wheel, and rear parking sensors, Safety, Function and Trailer Tow pack. 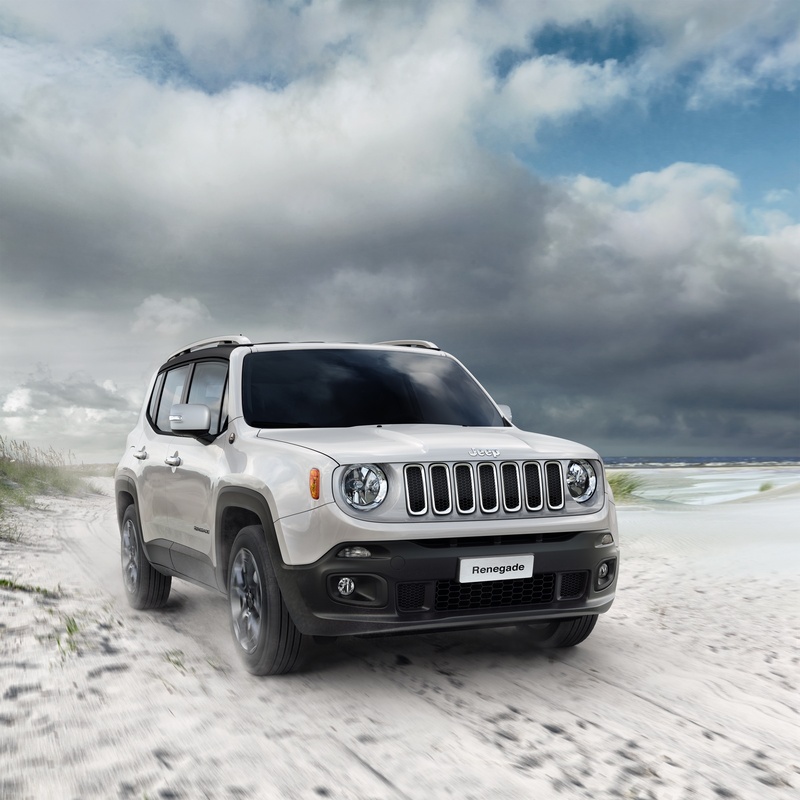 The Renegade Limited is available for all engine versions of the line-up, except for the 170 horspower Multijet II 2.0 with nine-speed automatic transmission (which is exclusive for the Trailhawk version) and offers a full-optional equipment level with premium amenities. The engine offer includes the 170 horsepower 1.4-liter MultiAir2 Turbo engine with nine-speed automatic transmission and 4×4 configuration and the 140 horsepower 2.0-liter MultiJet II with nine-speed automatic transmission and 4×4 configuration. Optional equipment includes: 18″ aluminum wheels, diamond-cut and Satin Silver or Grey Granite painted finish, power 8-way front seats including 4 way lumbar adjustment, heated steering wheel and front seats, leather seats, Adaptive Cruise Control (ACC), UConnect 6.5AN touchscreen radio with 6.5″ color display, Navigation with 3D landmarks, city models and digital terrain, standard UConnect Voice Command with Bluetooth®, the removable My Sky open-air roof system and the Safety, Infotainment, Winter, Visibility, Function and Trailer Tow Packs. With its distinctive, aggressive look, standard special off-road equipment including the Jeep Active Drive Low system with 20:1 crawl ratio, Selec-Terrain system with exclusive Rock mode and Hill descent control, the Trailhawk stands out as the most capable Renegade model and the most capable Small SUV in its category for off-road driving. It is powered by the 170 horsepower 2.0-liter MultiJet II with Stop&Start, with nine-speed automatic transmission and the 185 horsepower 2.4-liter “Tigershark” MultiAir, with nine-speed automatic gearbox. The specific off-road equipment of the Trailhawk includes increased ride height of 35 mm compared to 4×2 model, off-road suspension and skid plates, and unique front / rear fascias with enhanced approach/departure angles. Additional styling cues and equipment of the Trailhawk include 17″ aluminum wheels, diamond-cut and Low Gloss Black painted finish, Mud and Snow tires with snowflake, Black accent roof rails, neutral Satin Gray grill surrounds, , “Trail Rated” badge forward of front door line, front halogen fog lamps, 7″ TFT color premium multiview display, EVIC, leather shift knob, removable flashlight, rear parking sensor, deep tint “privacy” glass, rear t tow hook, red front tow hook (on available in some markets)and dual zone automatic temperature control. Optional equipment includes: hood decal, leather seats, power 8-way front seats (driver/passenger) including 4 way lumbar adjustment, Lane departure warning plus Uconnect 6.5AN touchscreen radio with 6.5″ color display; Navigation with 3D landmarks; city models and digital terrain; standard UConnect Voice Command with Bluetooth®, the removable My Sky open-air roof system and the Infotainment, Winter, Visibility, Function and Trailer Tow Packs.